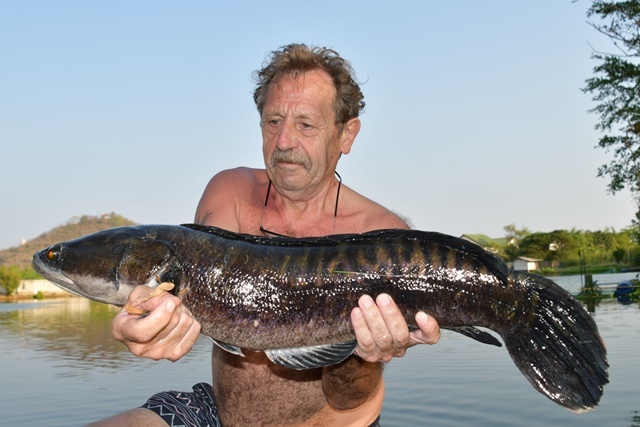 Another Belgium angler Jos Jacobs made his inaugural visit to Palm Tree during the month and what a session he had; topped off by an awesome giant snakehead and a very rare kali rohu. 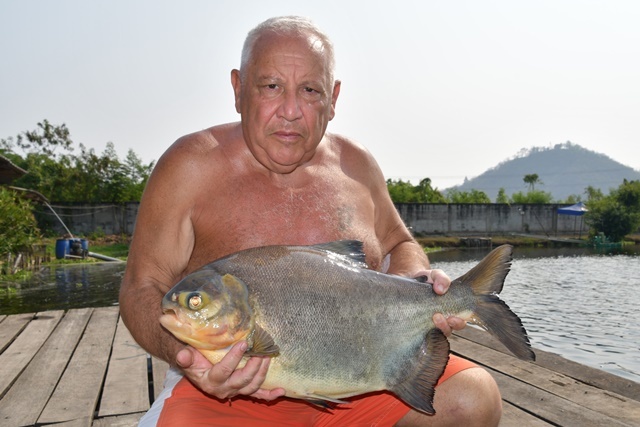 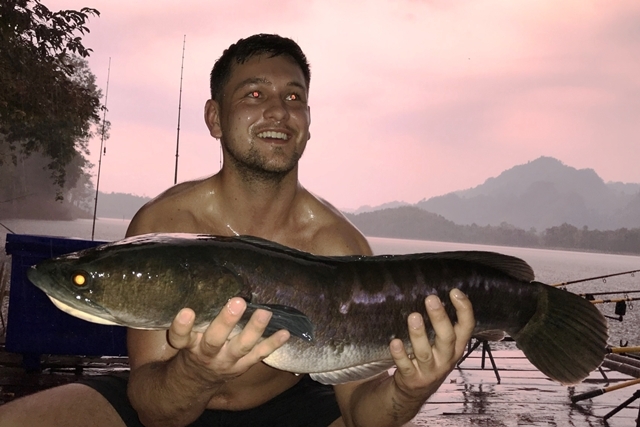 In addition to this he caught a plethora of other species that included tambaqui, giant gourami, Chinese bighead carp, Mekong catfish, chao phraya catfish, wallago attu, Juliens golden price carp, pacu, vundu catfish, striped snakehead, striped catfish, mollycot, as well as both Amazon and Asian redtail. 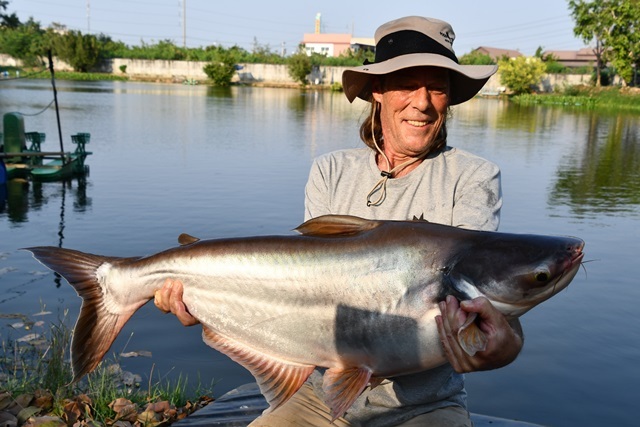 Belgium angling fanatic Francis Ameryckx returned for another session and as usual landed a wide variety of splendid catches that included arapaima, an awesome Chinese silver carp, a stunning vundu catfish, Juliens golden price carp, pacu, Mekong catfish, alligator gar, black shark minnow, catfish shark, striped catfish, chao phraya catfish, African walking catfish, rohu, wallago attu, yellow catfish, mollycot as well as numerous Amazon and Asian redtsail. 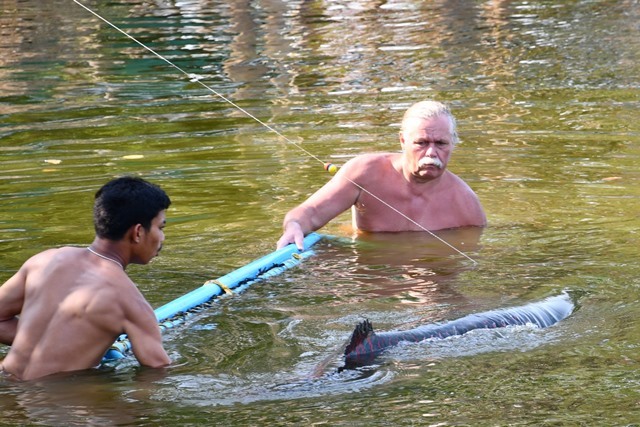 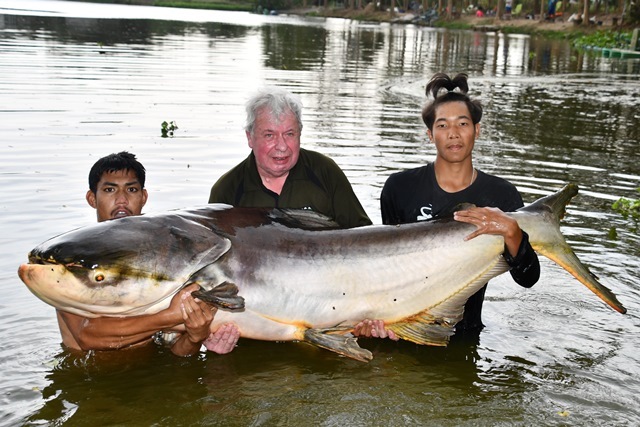 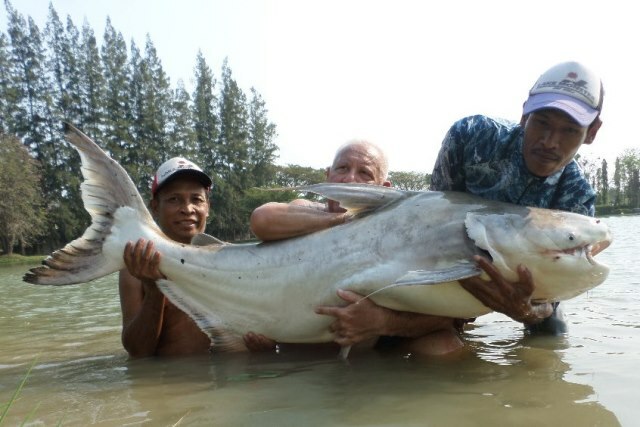 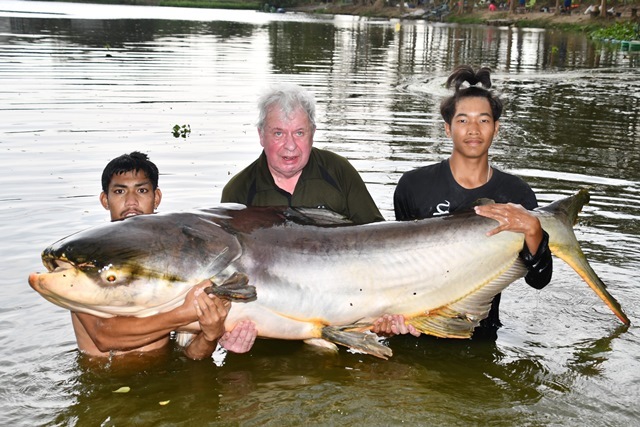 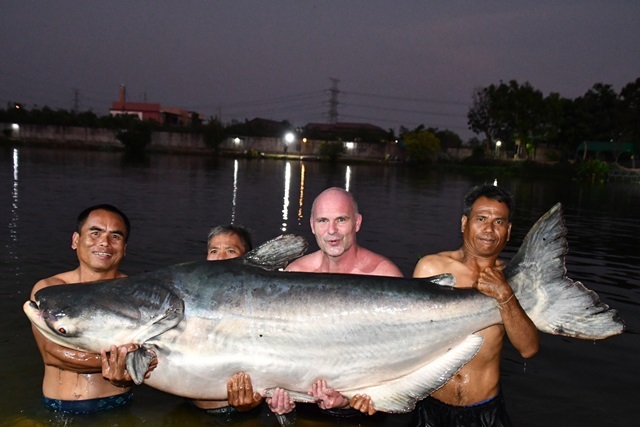 Per Ola Fallman and his fishing mates had a good session topped off by t-shirter in the shape of a monstrous Mekong catfish. 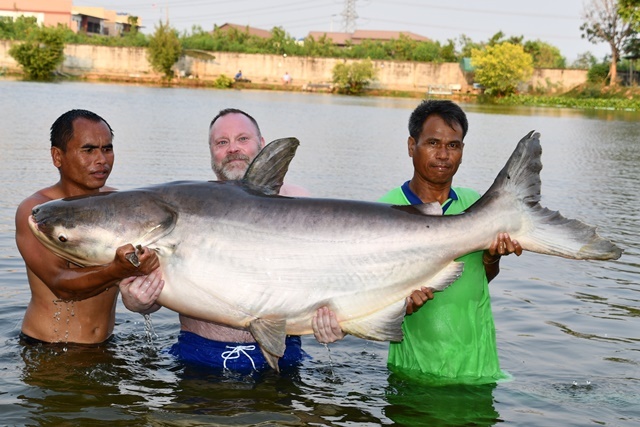 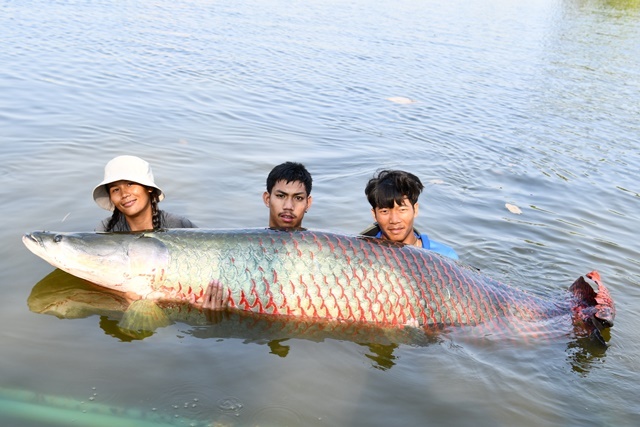 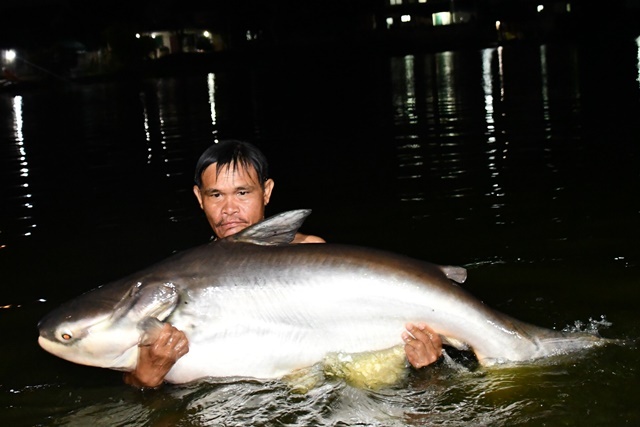 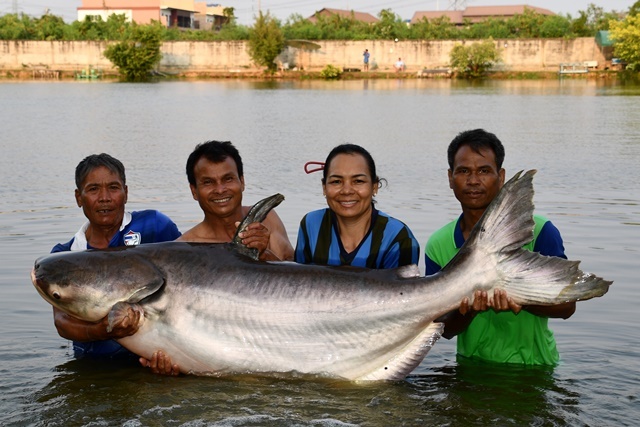 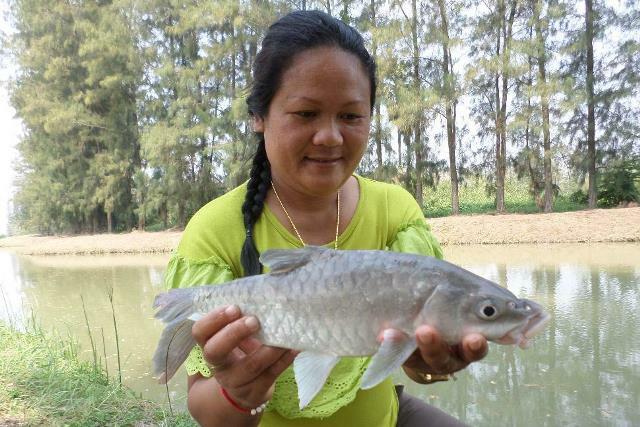 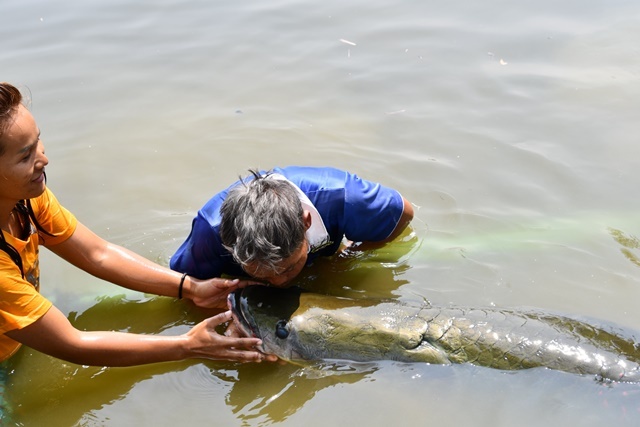 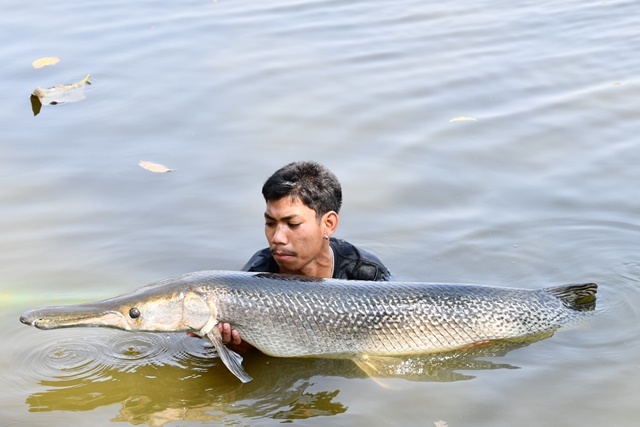 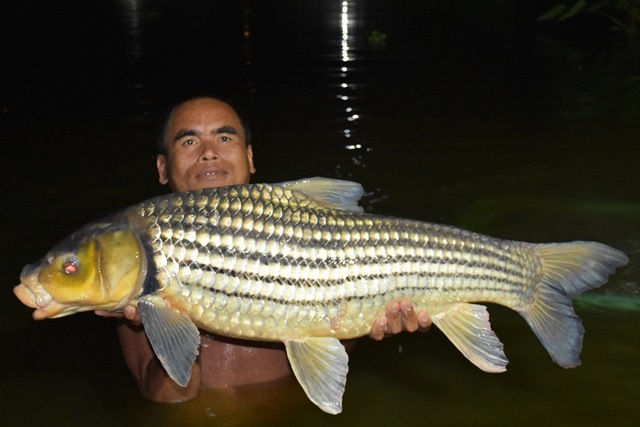 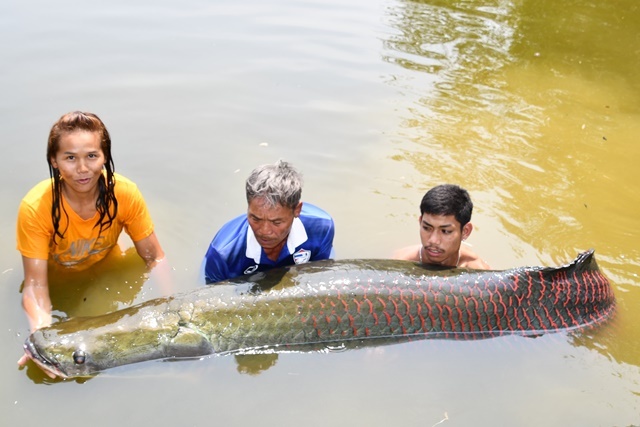 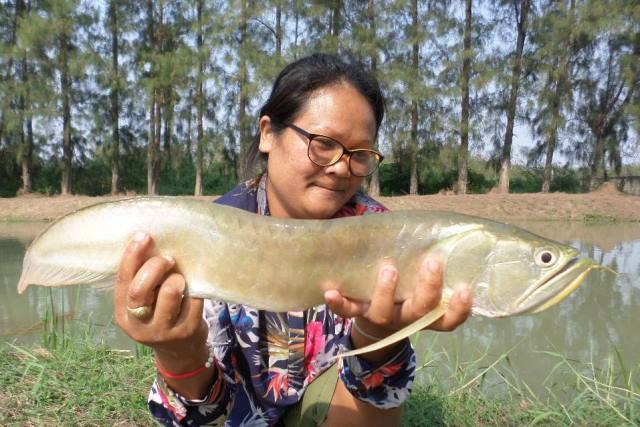 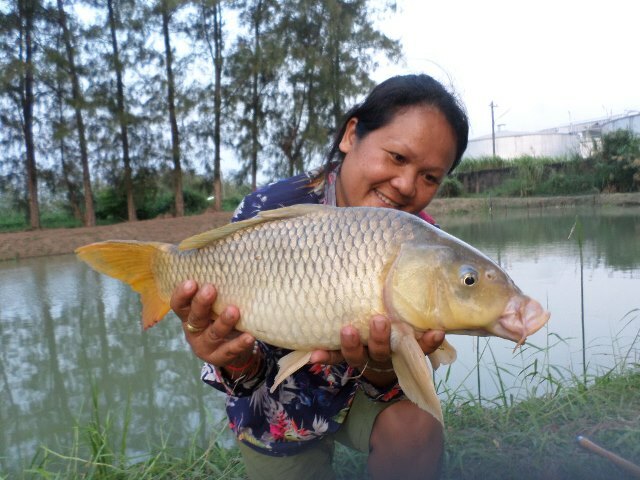 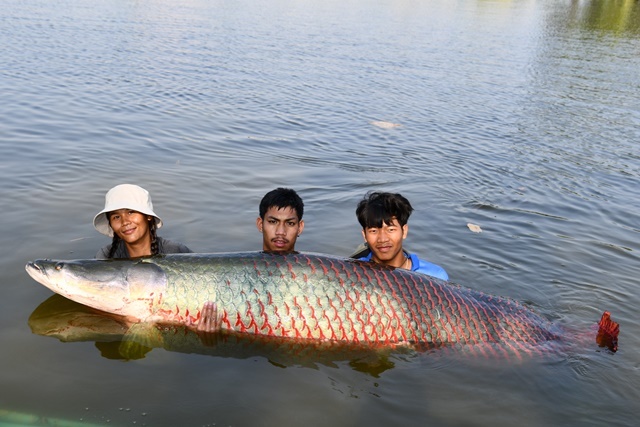 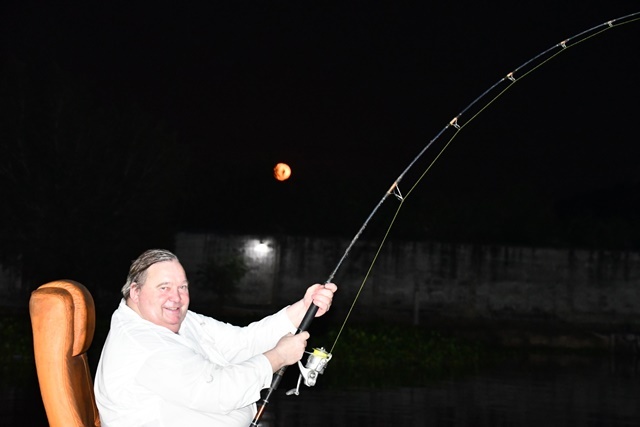 They also caught a number of other superb fish that included catla carp, wallago attu, alligator gar, rohu as well as both Amazon and Thai redtail. 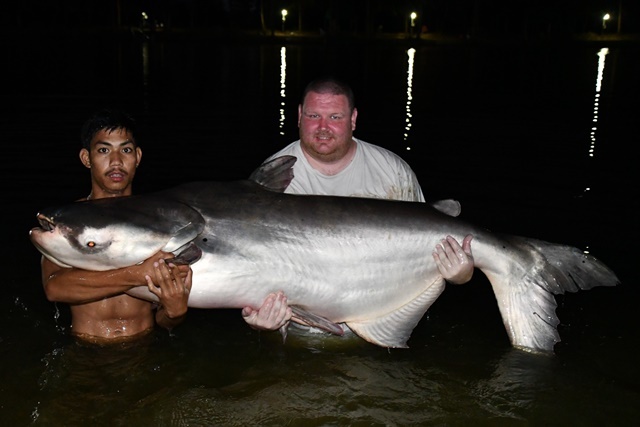 Top of Adrian Hancock bucket list when he accompanied Tim down to IT Monster Lake was to catch a chao phraya catfish over the 100lb mark which he did in style with this t-shirt qualifying fish of 150lb+. 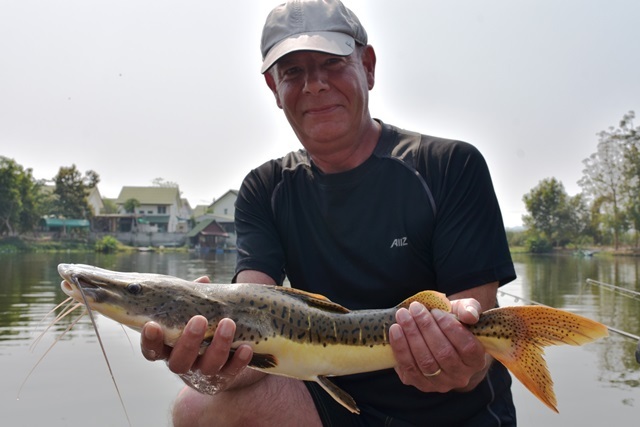 They also caught soldier river barb a new species for Ade as well as Amazon redtail and rohu. 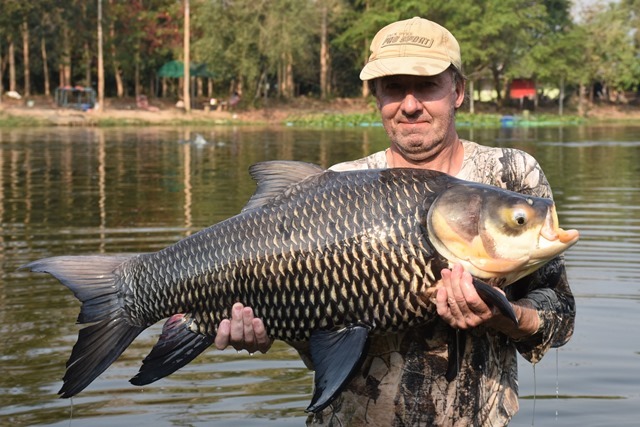 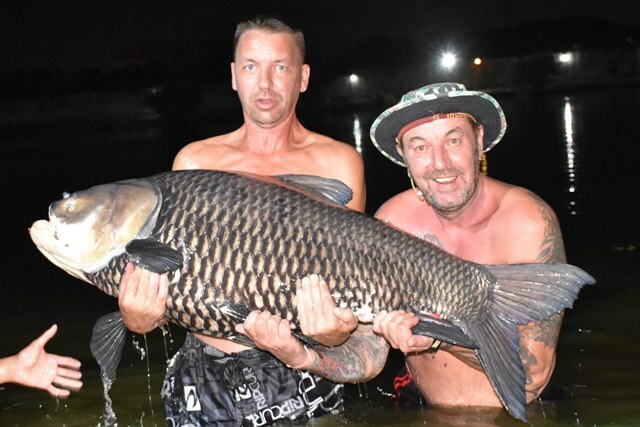 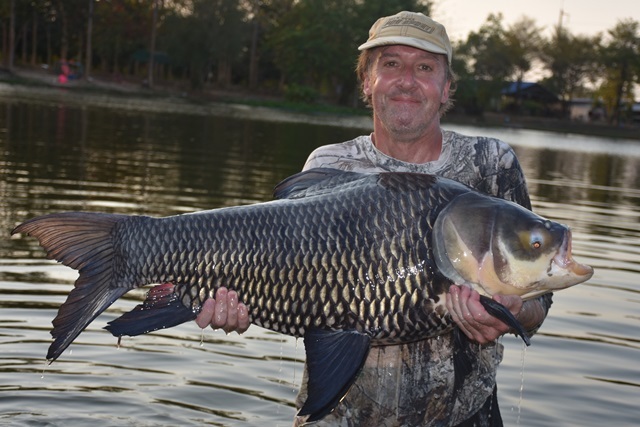 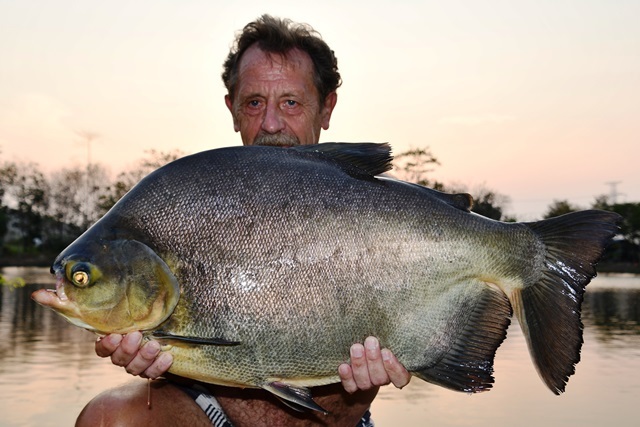 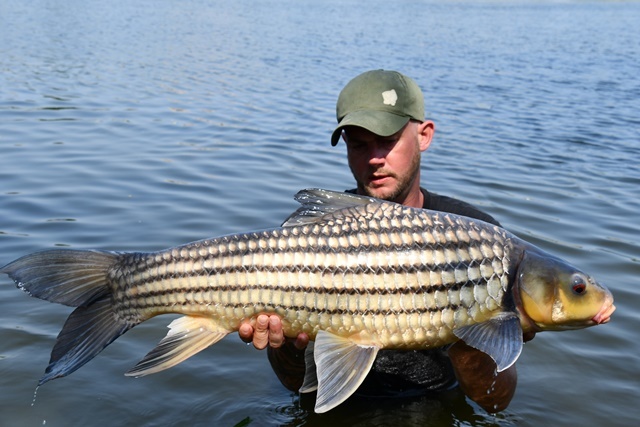 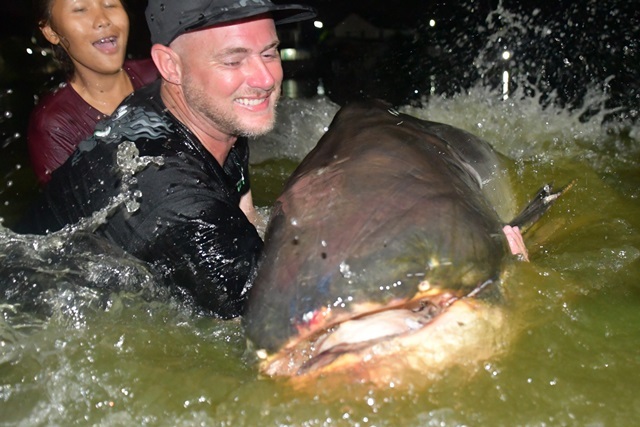 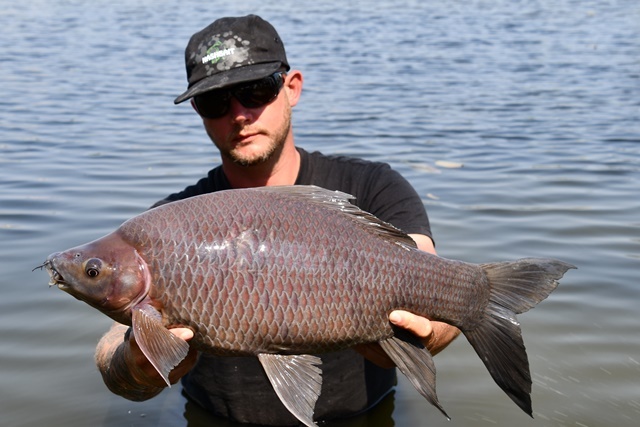 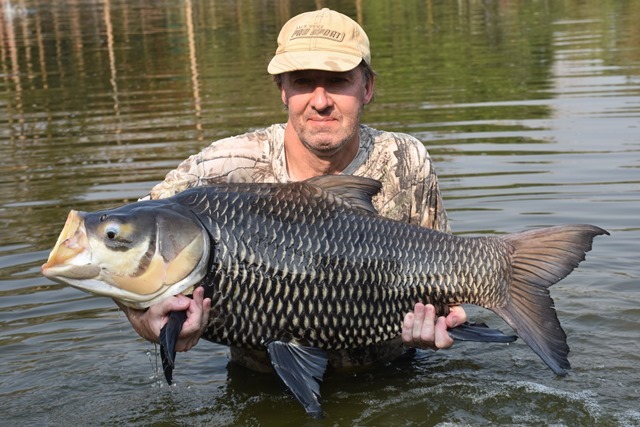 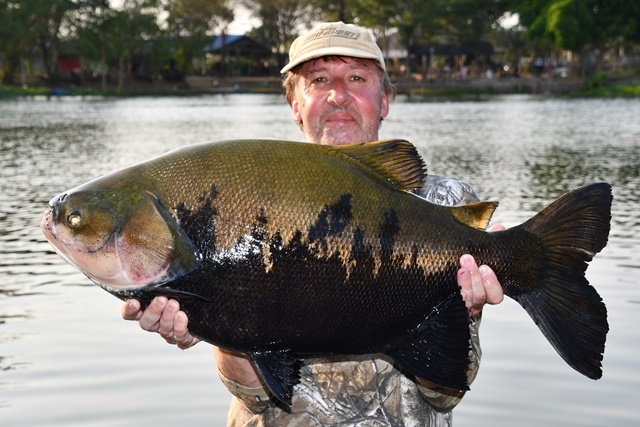 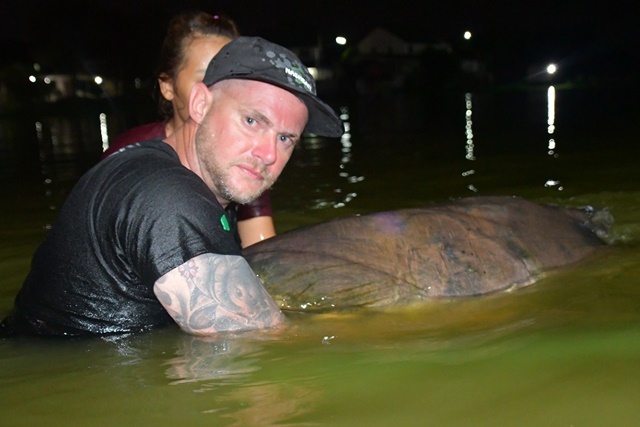 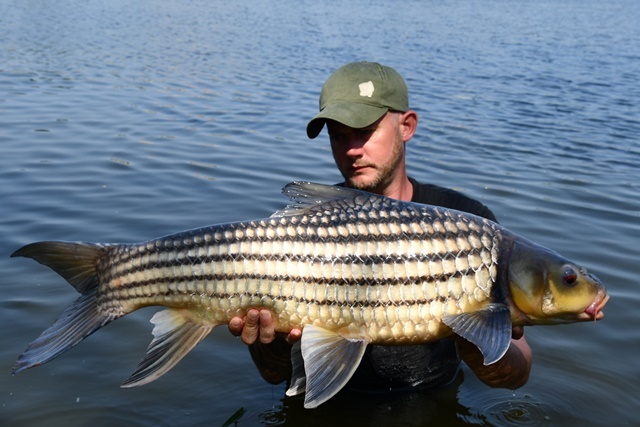 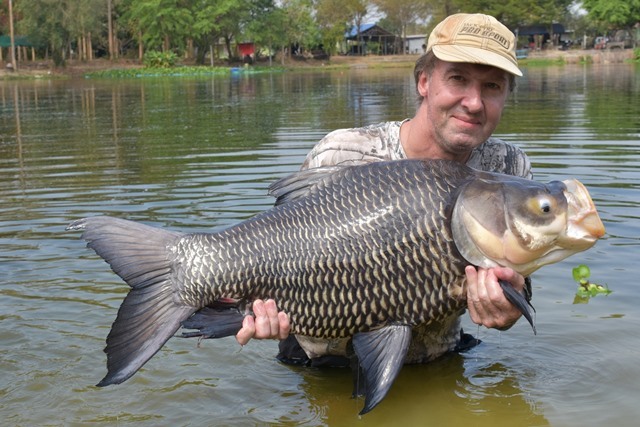 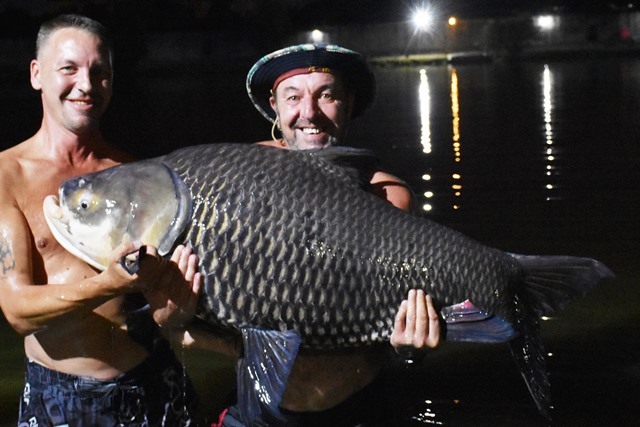 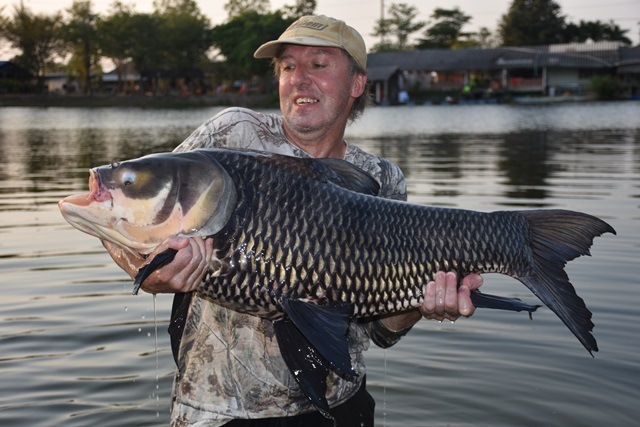 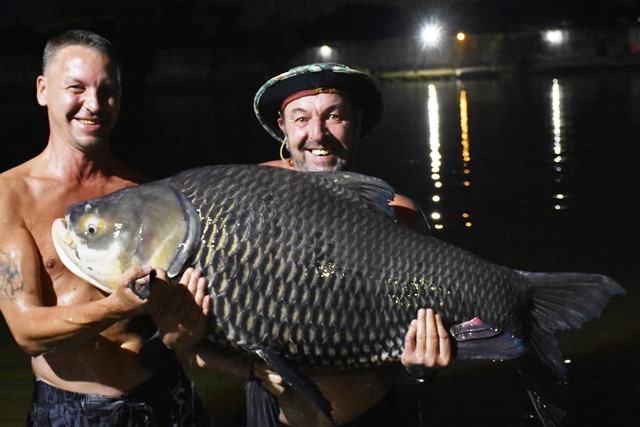 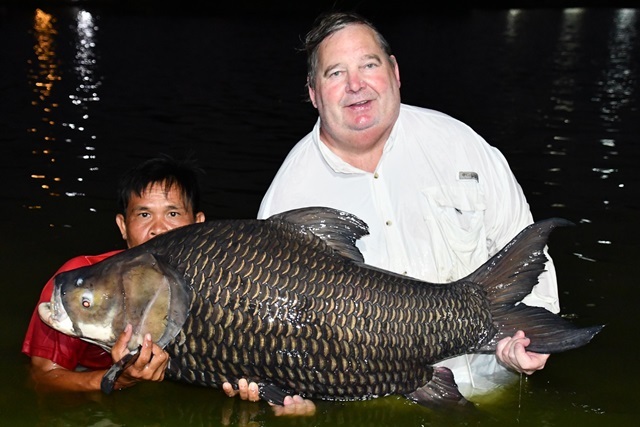 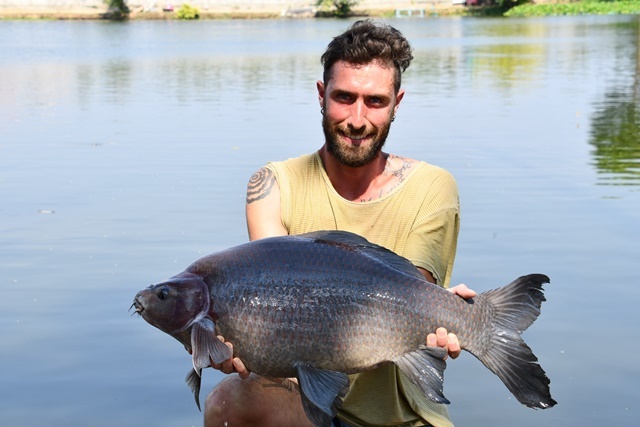 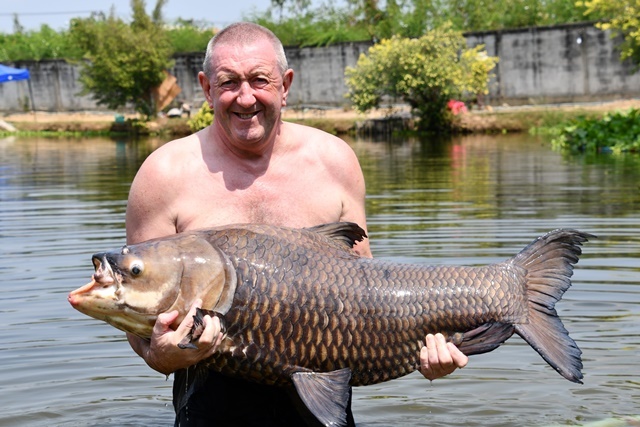 Tim Coakley was another angler who made the journey up from Pattaya during the month successfully landing the 'Friendly Mekong' after a lengthy battle, as well as stunning black shark minnow and Juliens golden price carp. 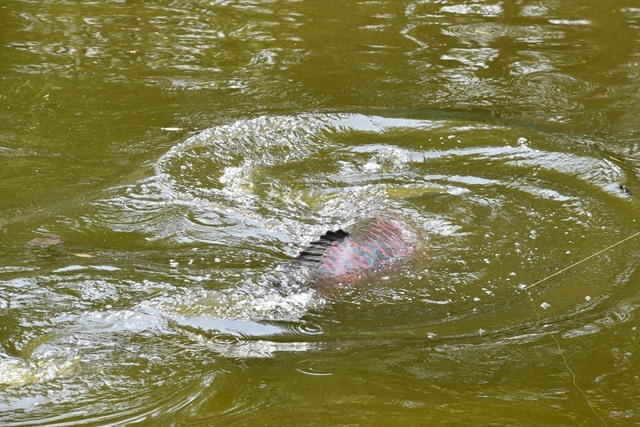 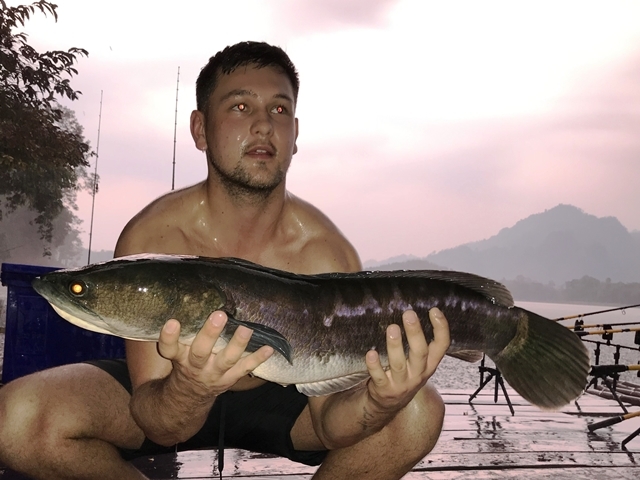 One of the fish high on Gordon Rennie's bucket list was a giant snakehead, and he went ahead and caught an absolute stunner. 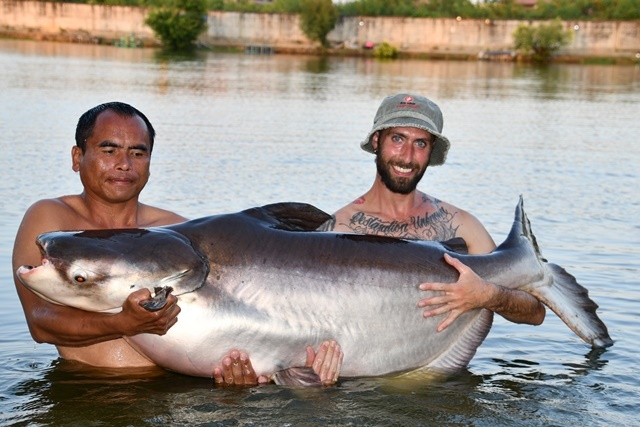 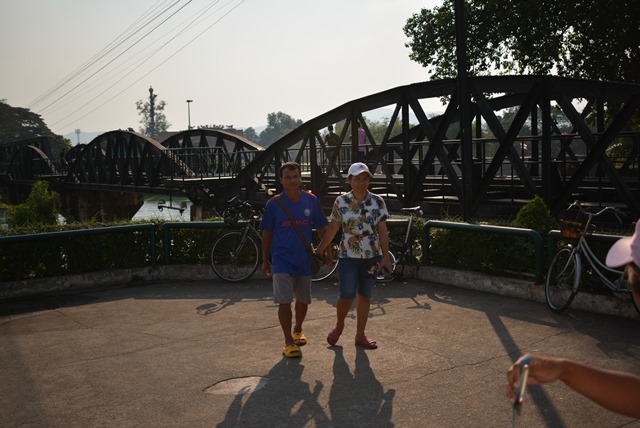 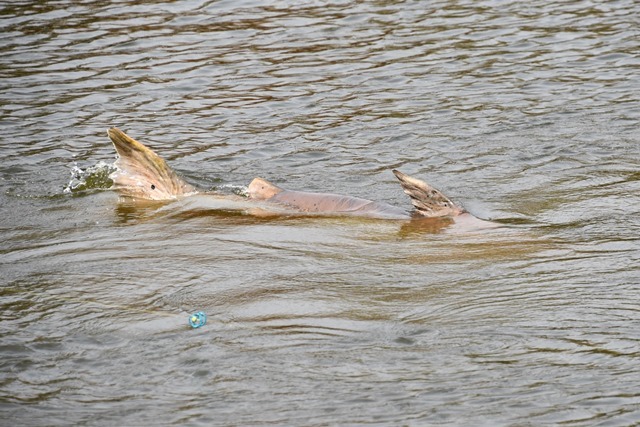 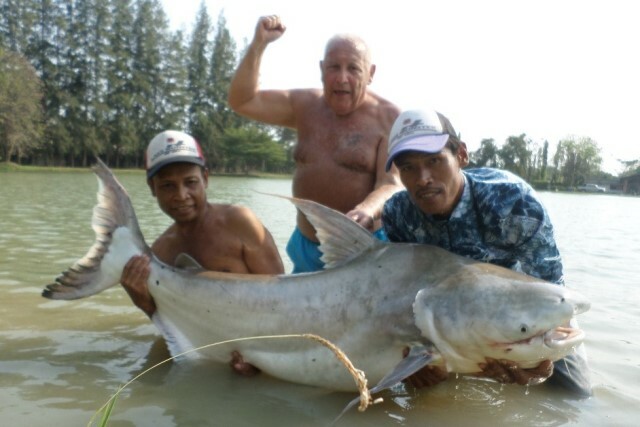 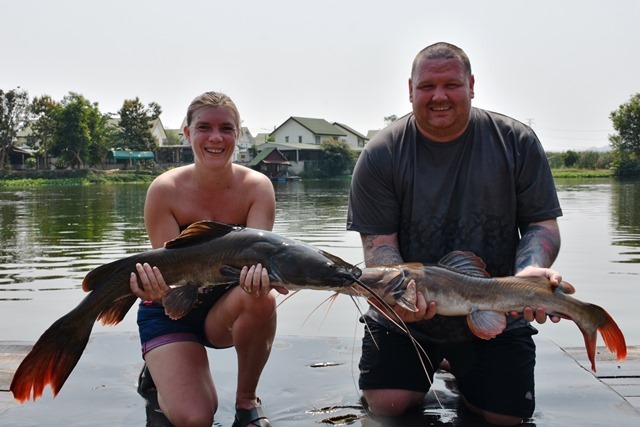 He and Kirstiy also landed Mekong catfish, alligator gar, striped catfish, as well as both Amazon and Asian redtail. 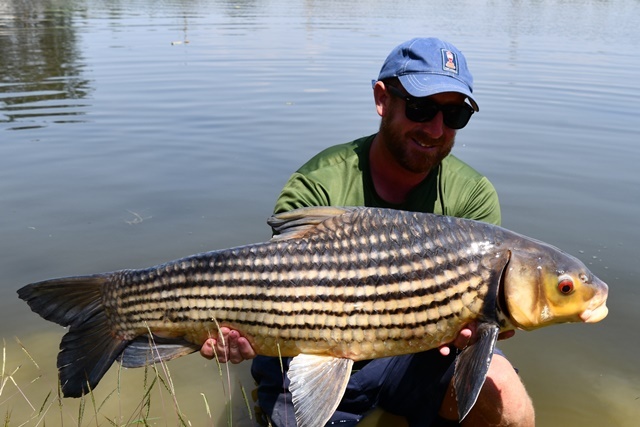 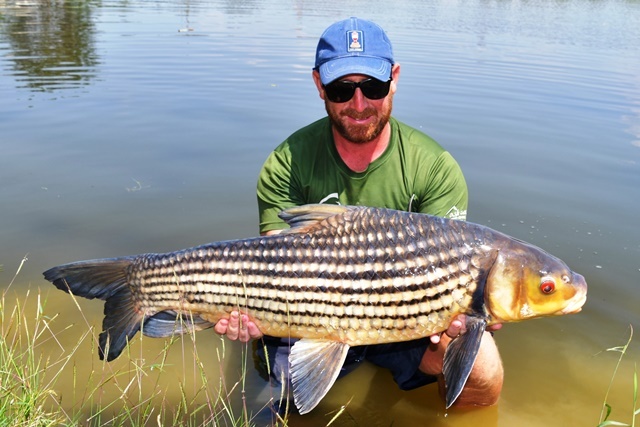 Another returning angler Ashley Davies had another enjoyable session catching a stunning black shark minnow, as well as pacu, striped catfish, alligator gar, catfish shark, big-Y catfish, as well as both Amazon and Asian redtail. 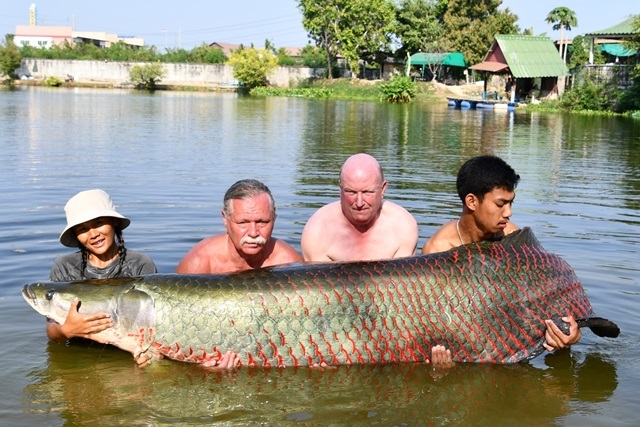 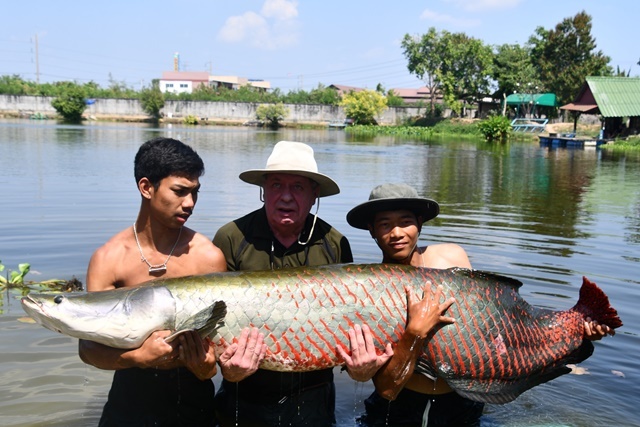 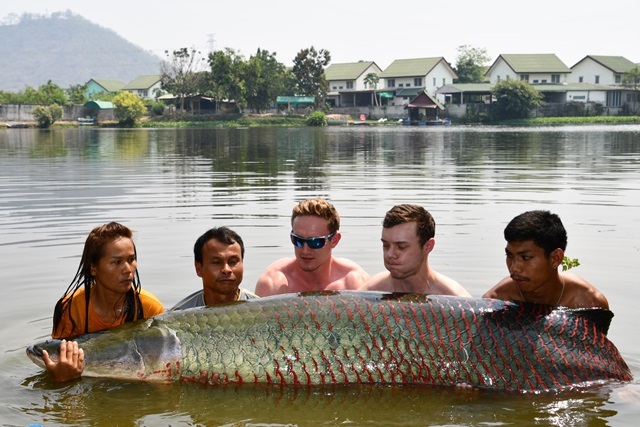 A couple of passers by fished for couple of days catching this monstrous arapaima, as well as mrigal and several other fish. 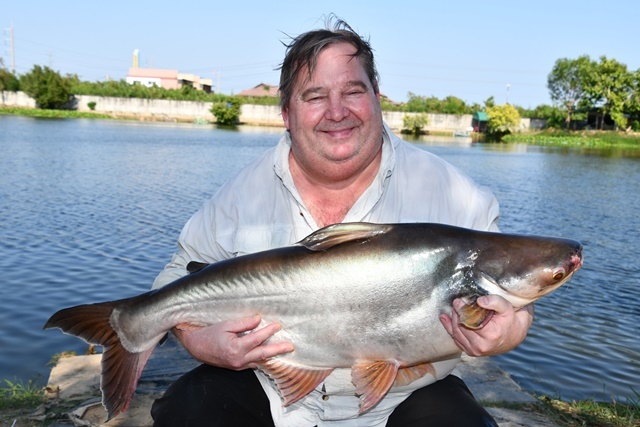 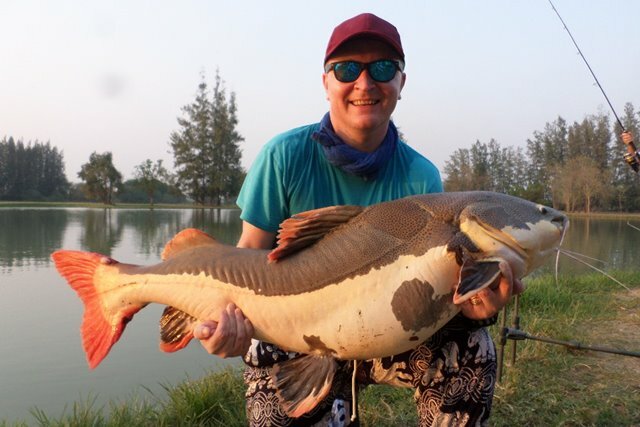 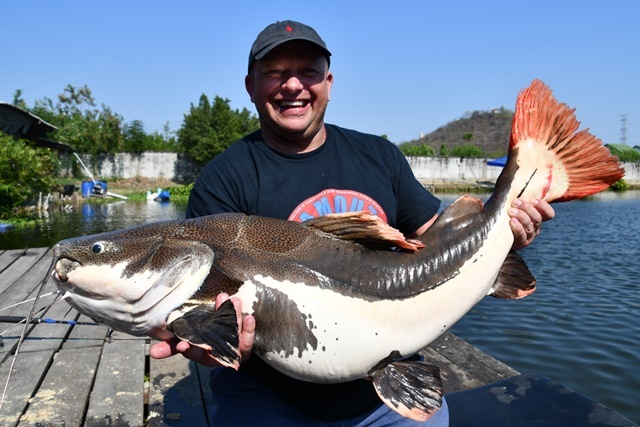 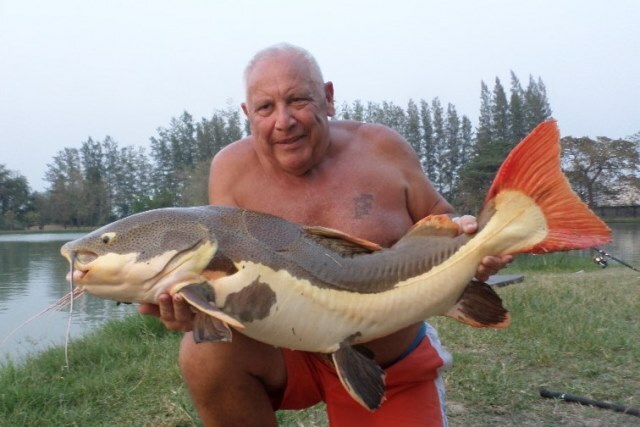 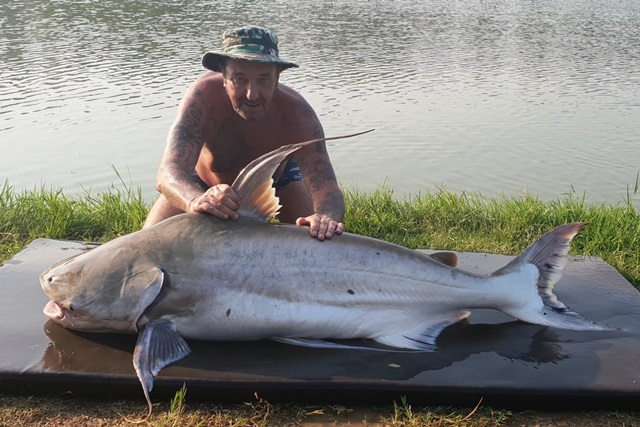 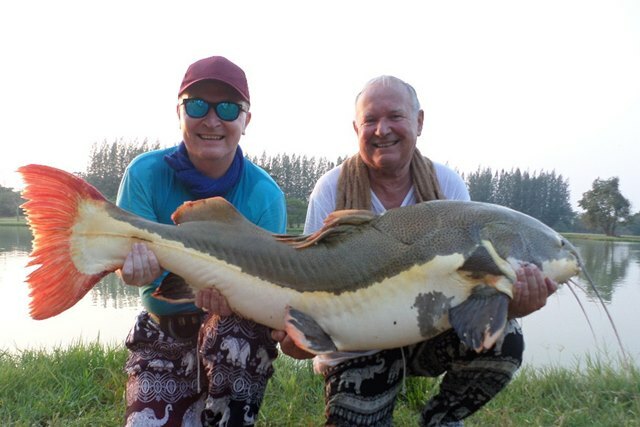 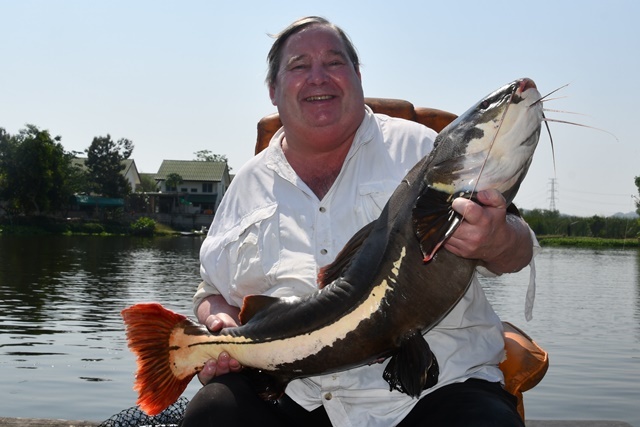 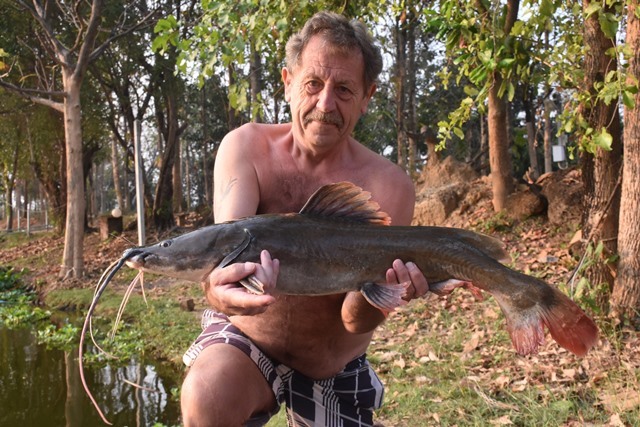 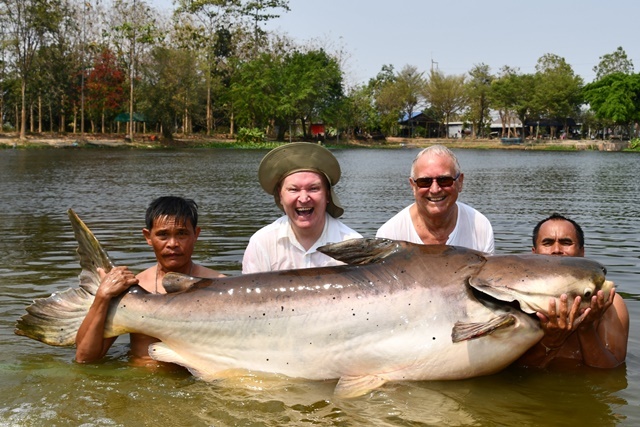 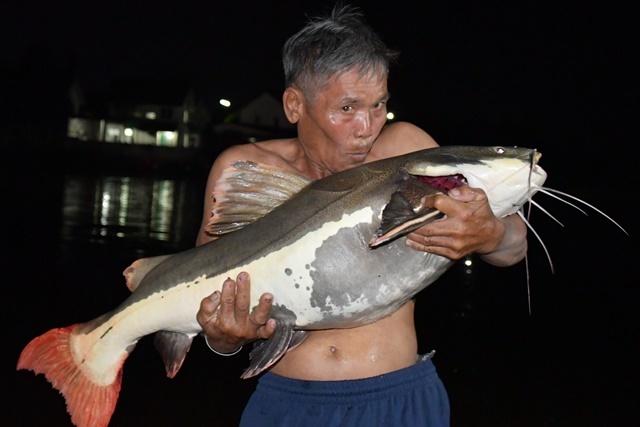 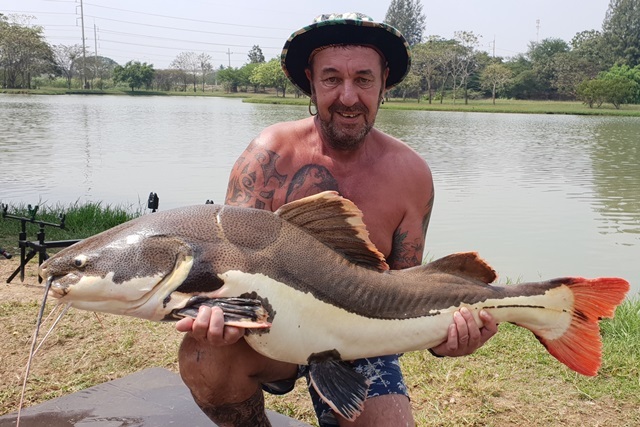 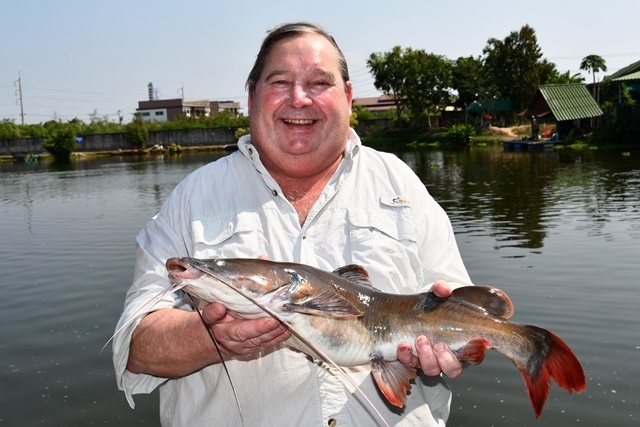 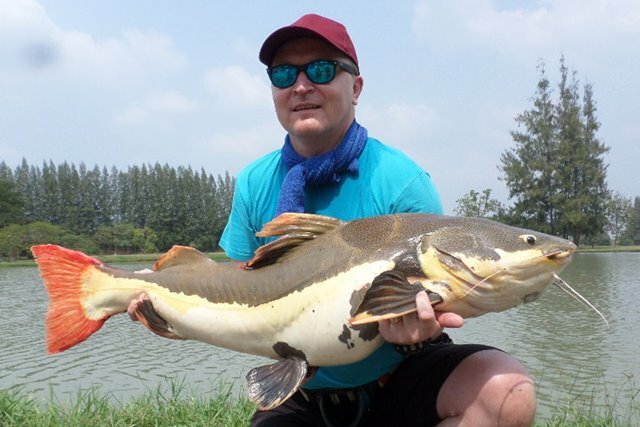 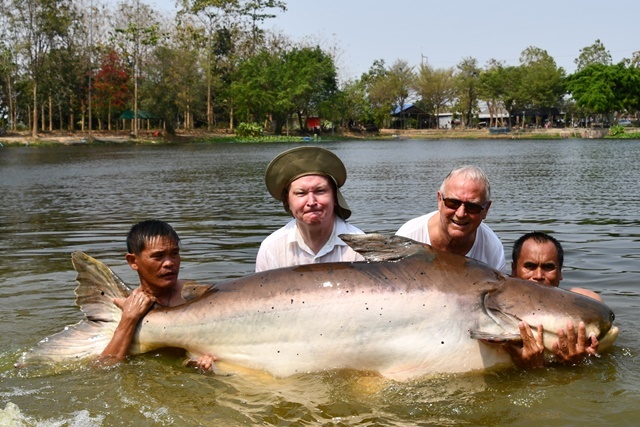 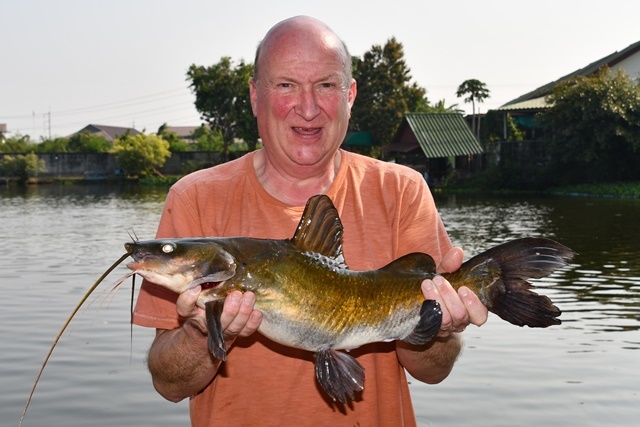 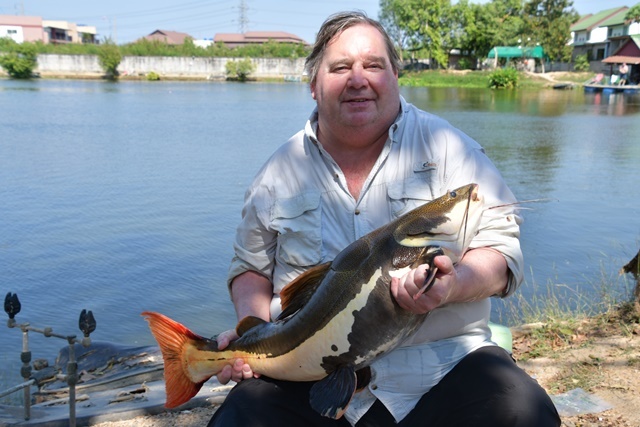 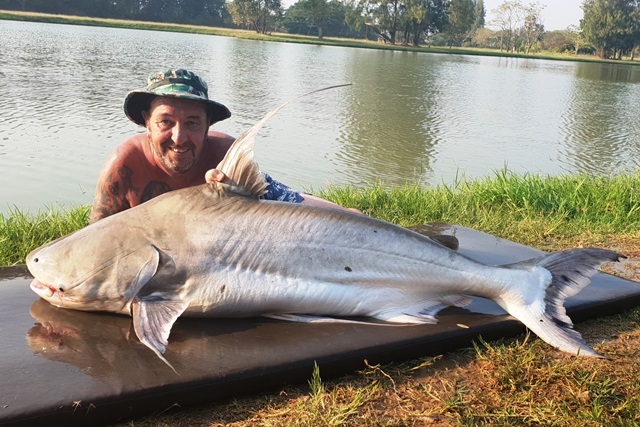 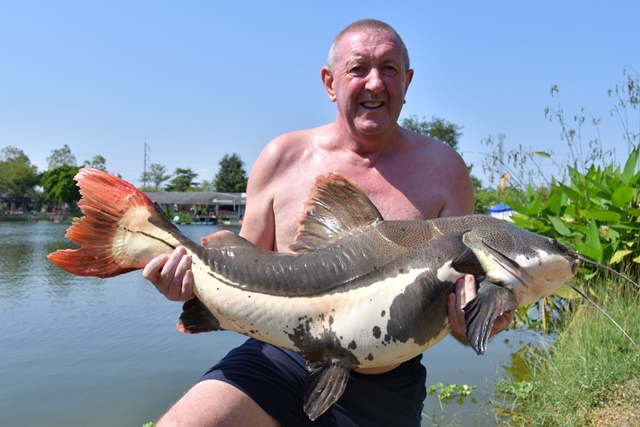 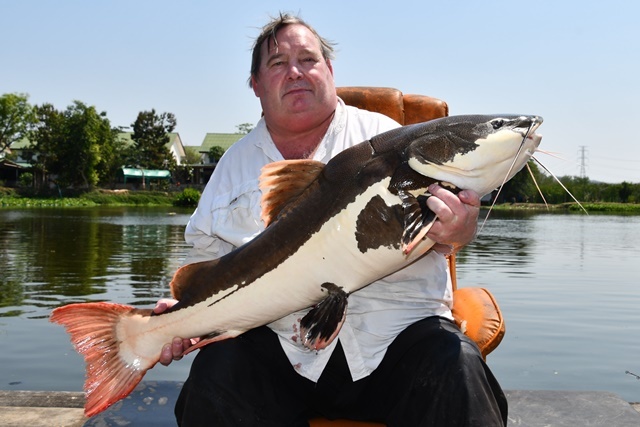 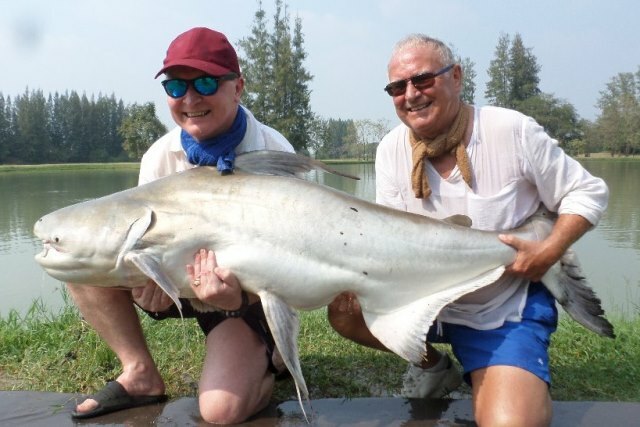 Mr Punch aka John Harvey made the journey up from Pattaya and was rewarded with catches of a superb bleak ear catfish as well as a stunning Juliens golden price carp, striped catfish and Amazon redtail. 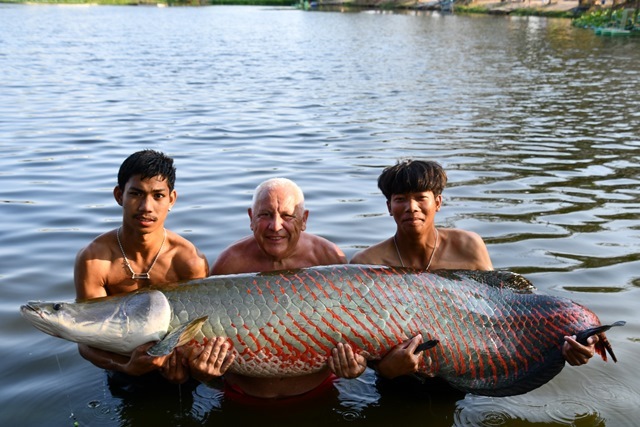 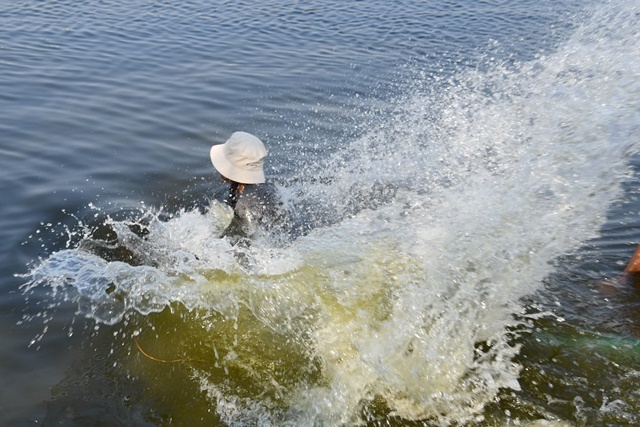 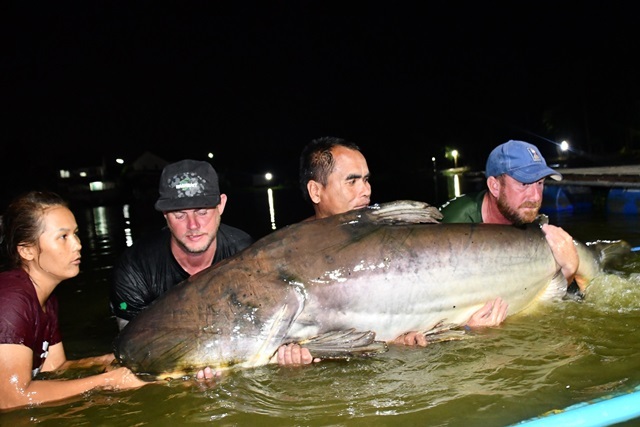 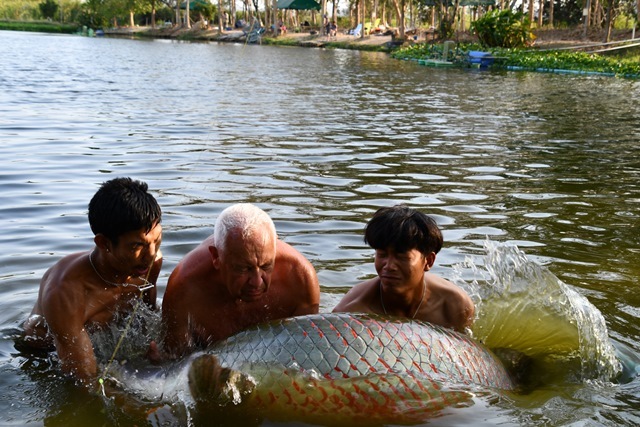 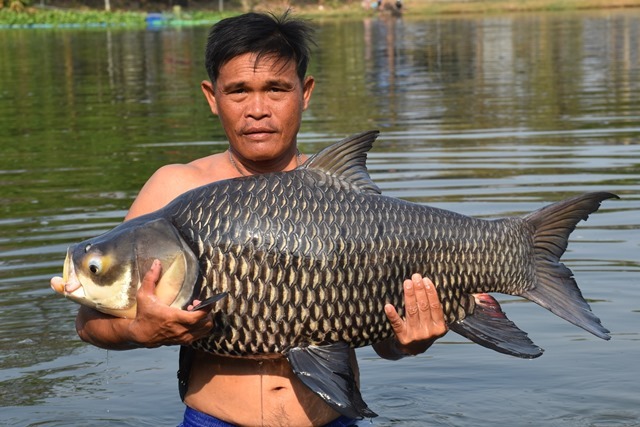 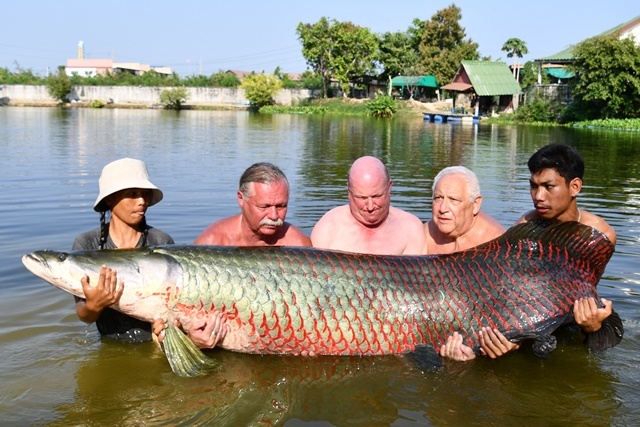 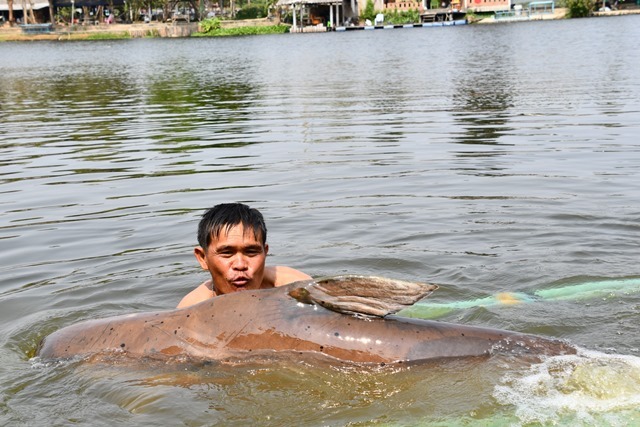 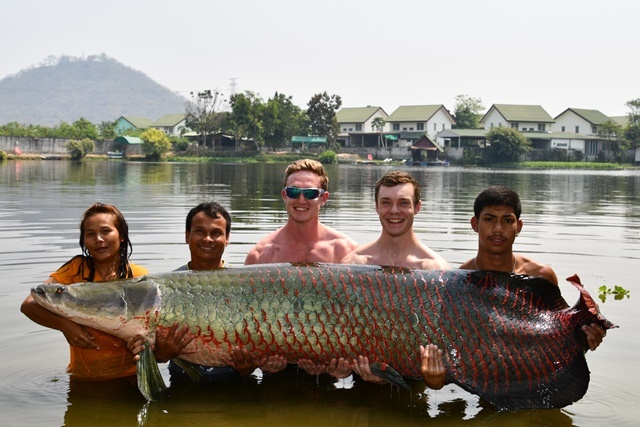 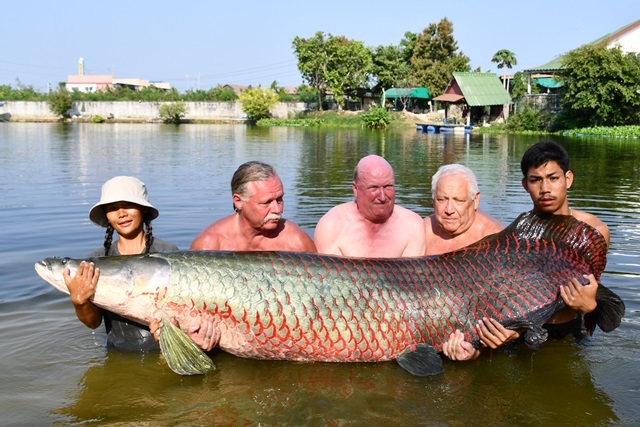 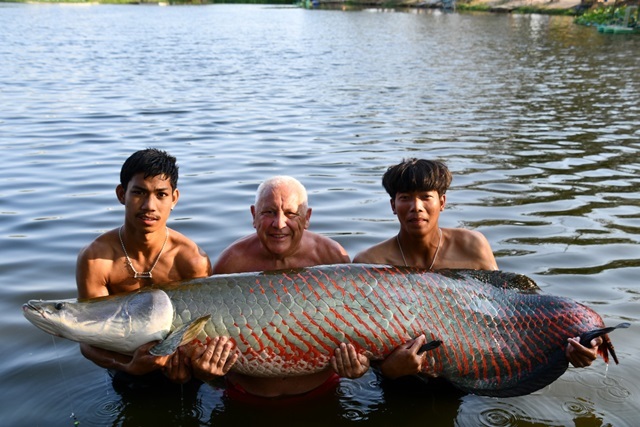 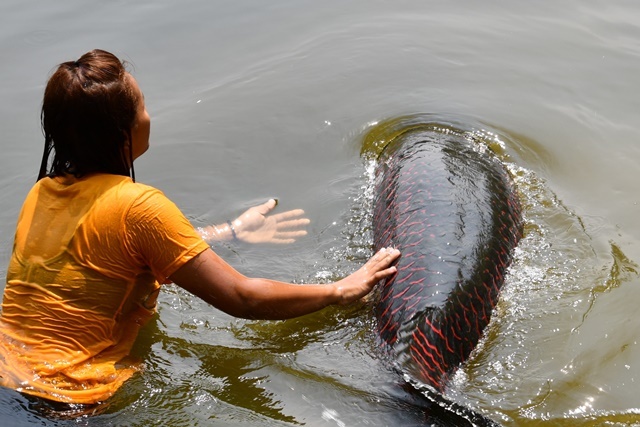 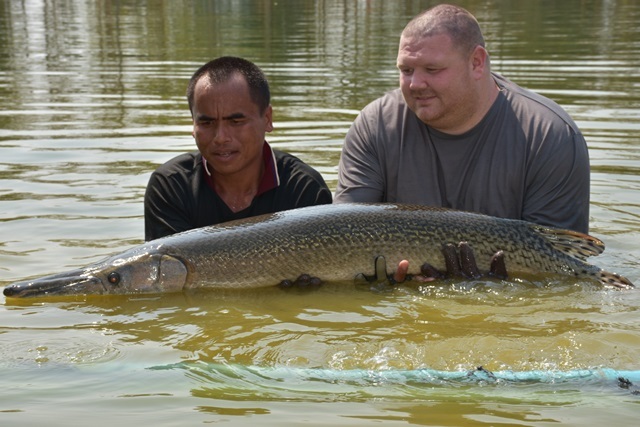 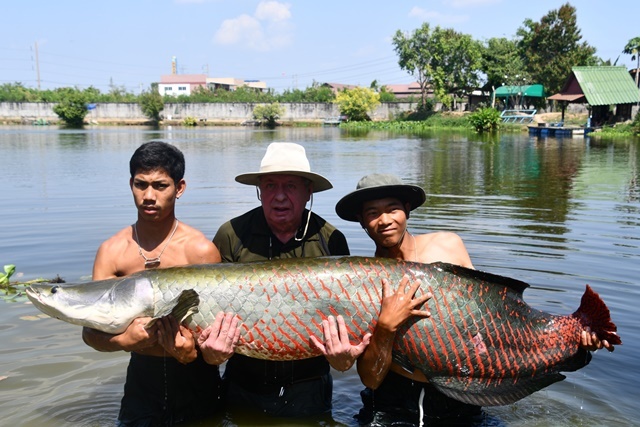 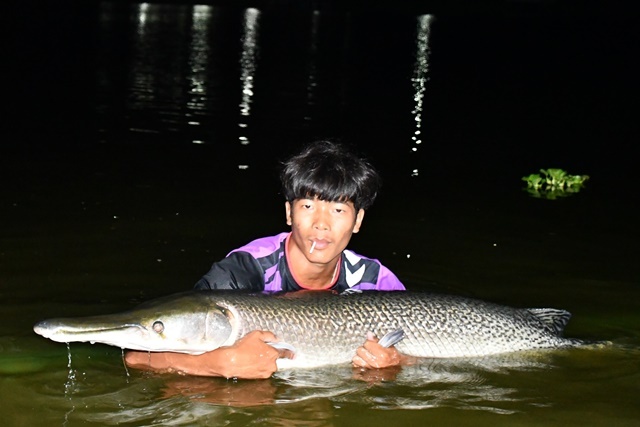 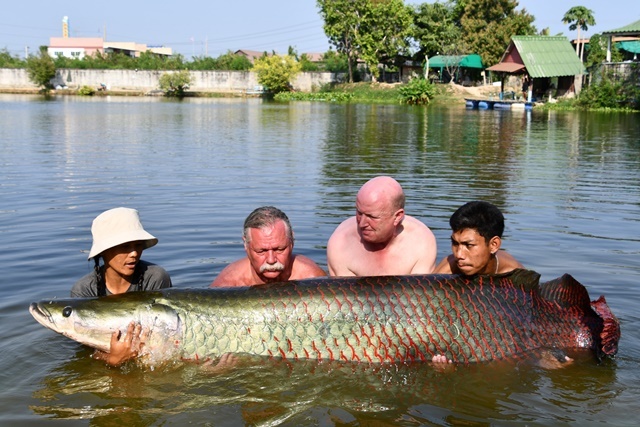 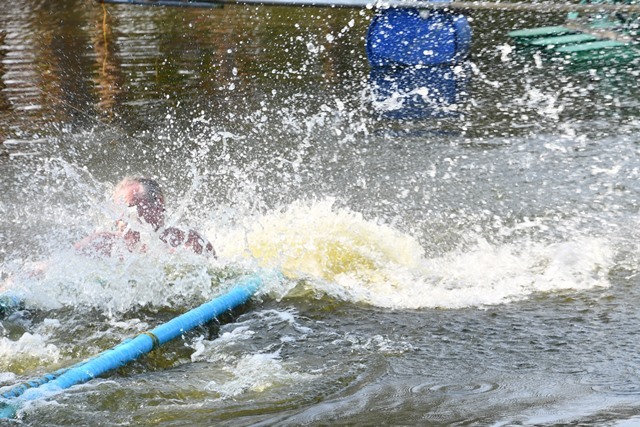 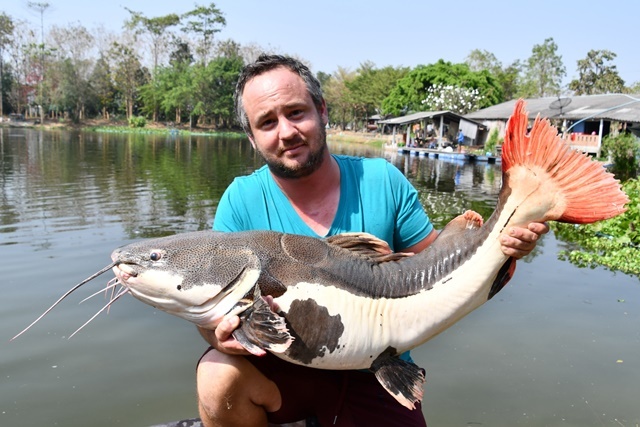 The guides had a dabble during the month with Benny's helping father catch a monstrous arapaima, as well as Mekong catfish, alligator gar, chao phraya catfish, Juliens golden price carp, Siamese carp, catla carp and Amazon redtail. 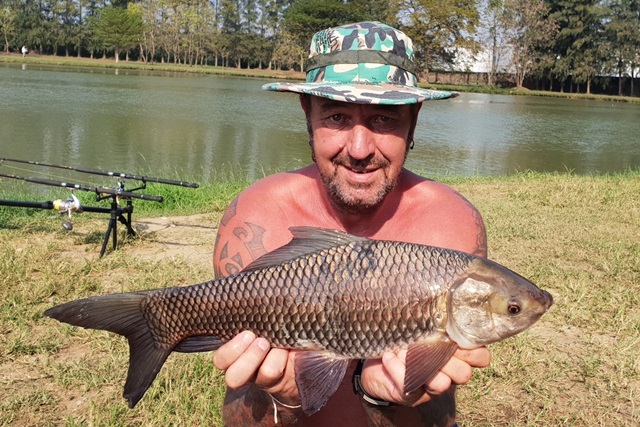 The ever happy Paul Muir returned and was soon into a number of big Amazon redtails as well as a stunning Juliens golden price carp, as well as rohu. 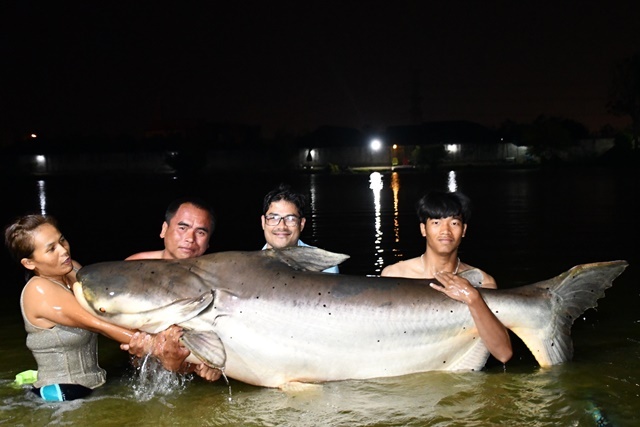 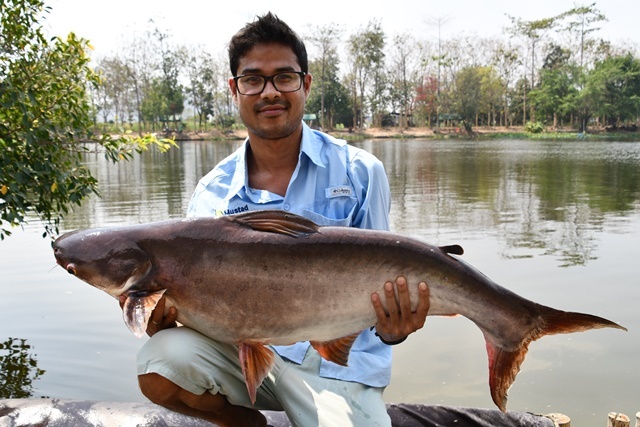 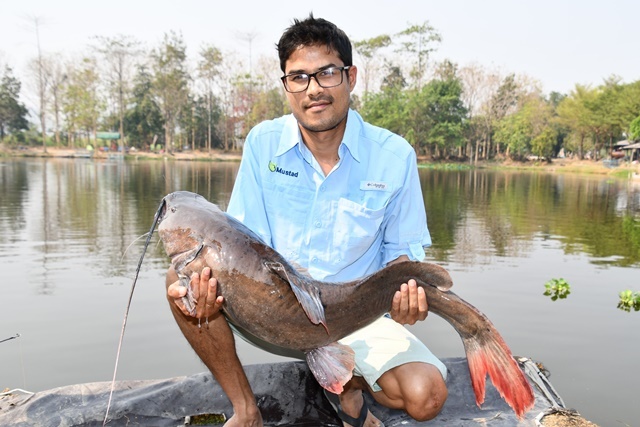 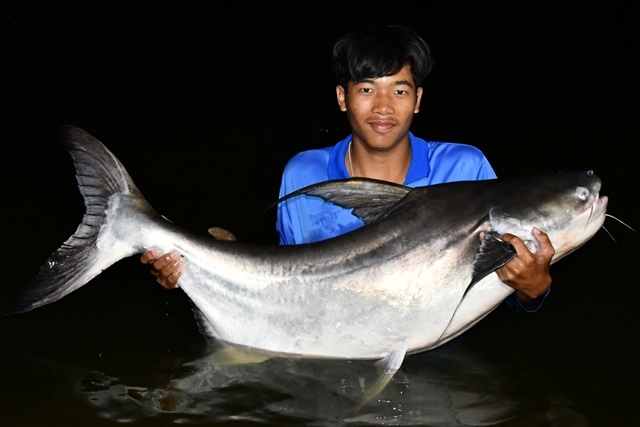 A great inaugural session for Pranjal Das landing a monstrous Mekong catfish that catapulted him into the Palm Tree BIG Catfish Club, as well as Juliens golden price carp, catfish shark and Thai redtail. 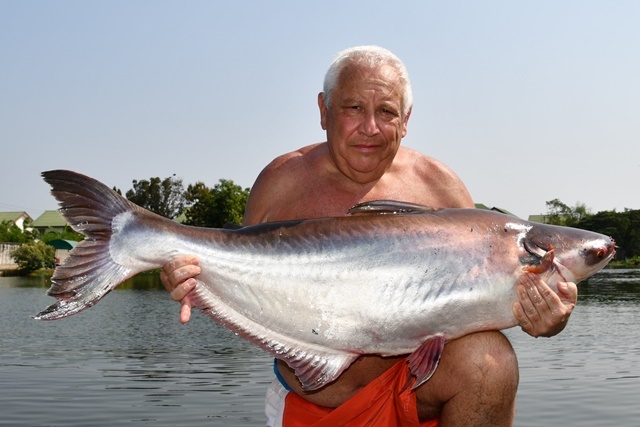 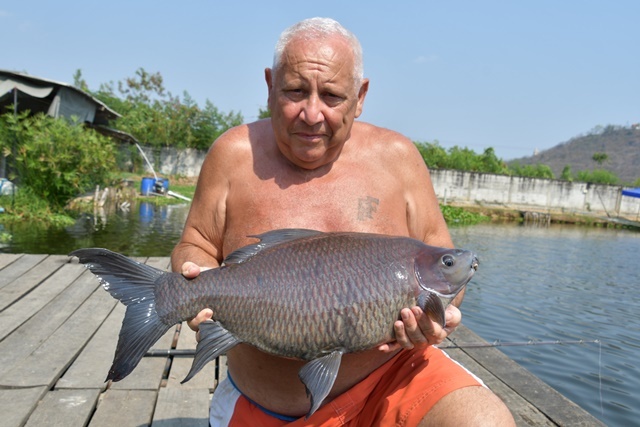 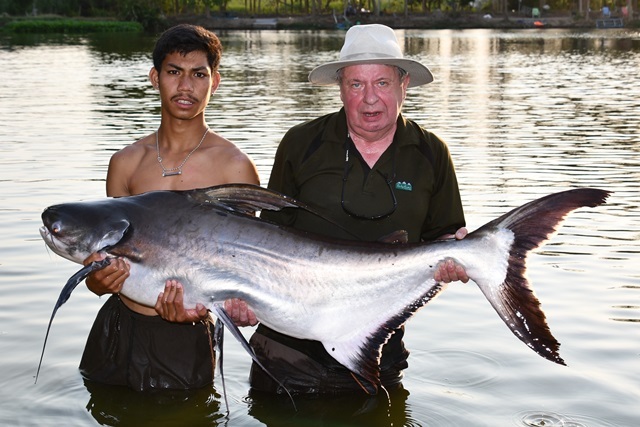 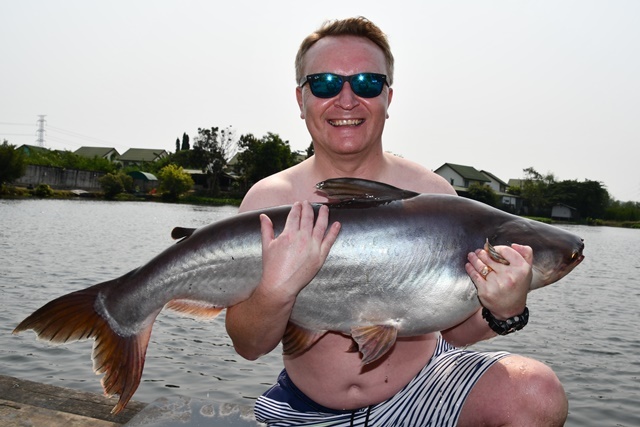 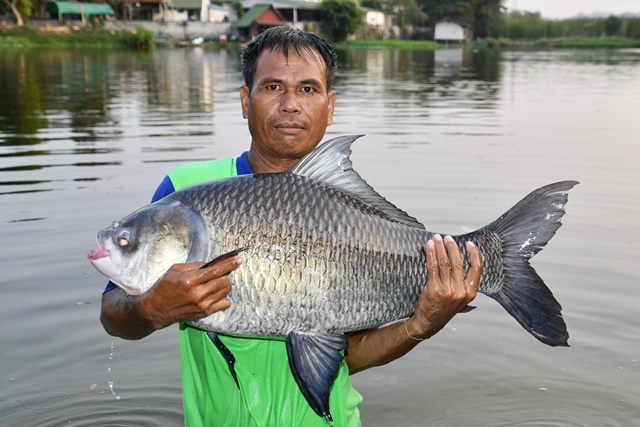 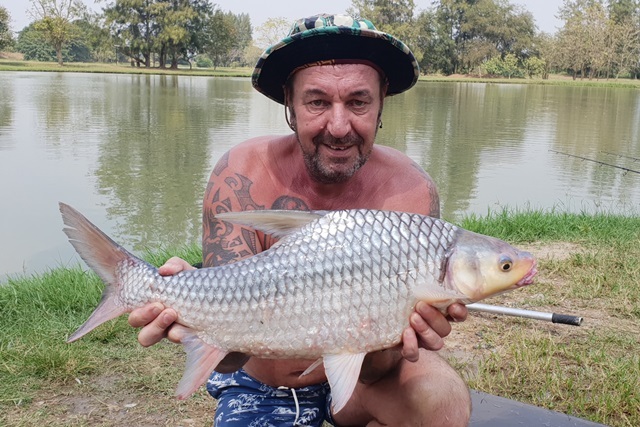 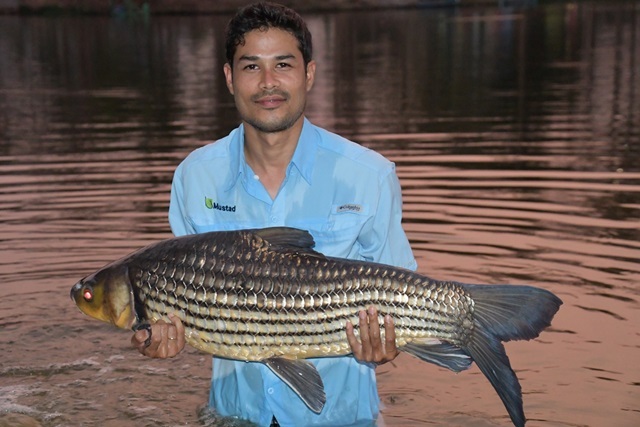 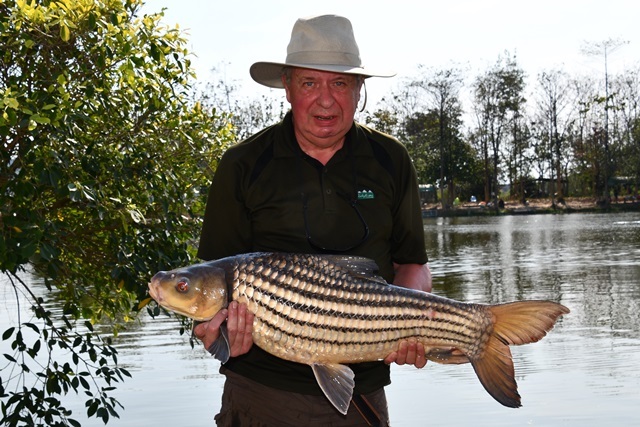 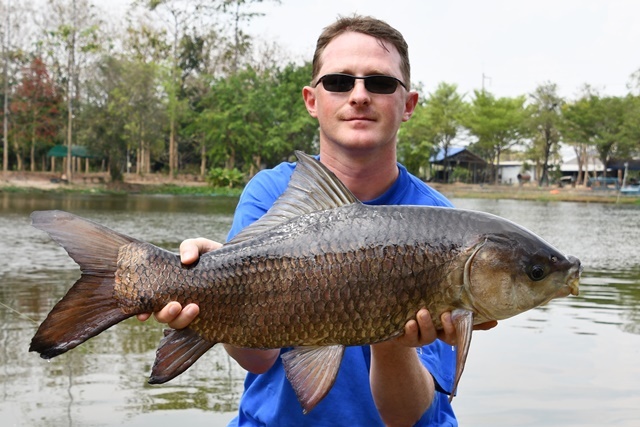 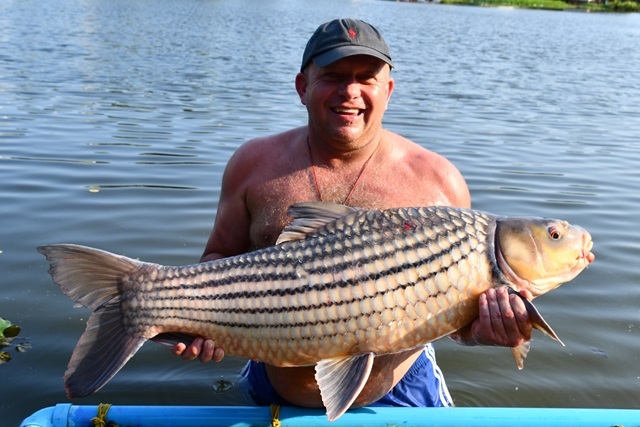 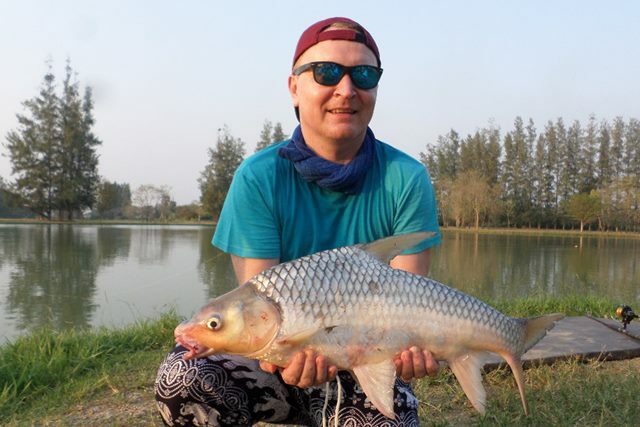 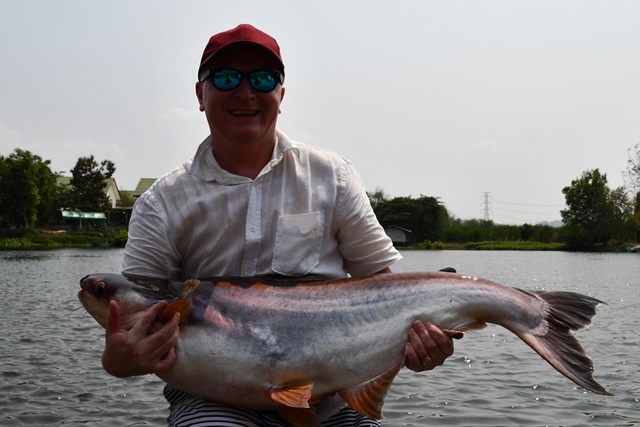 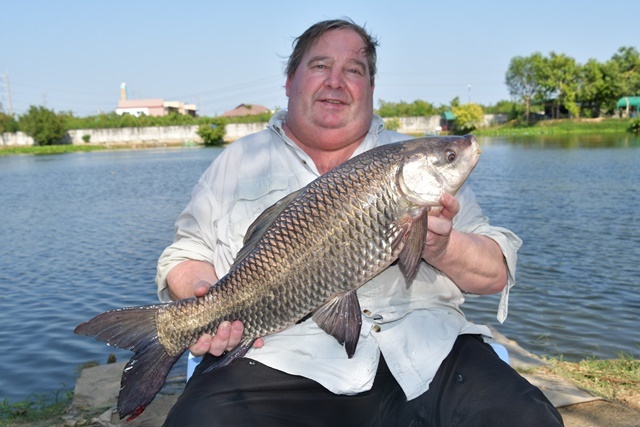 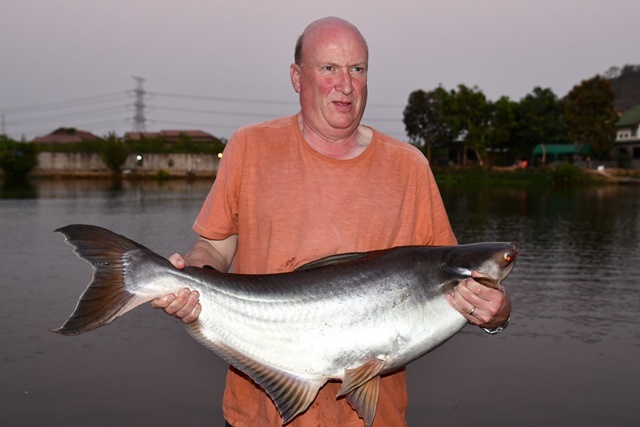 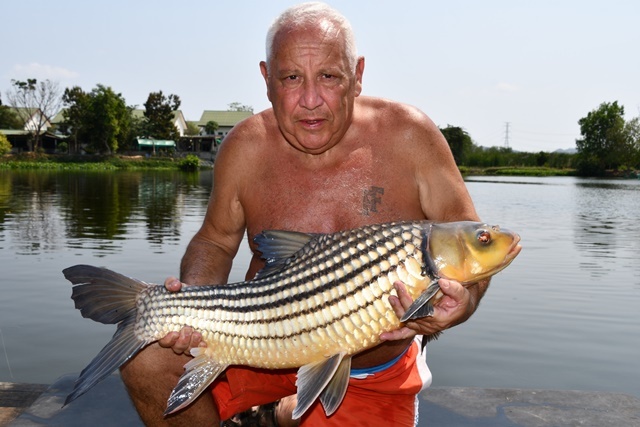 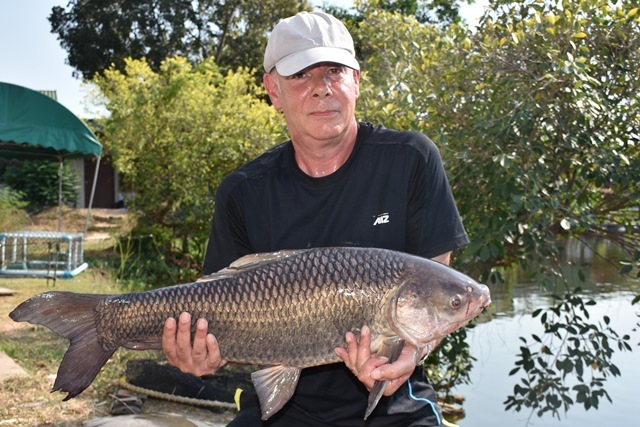 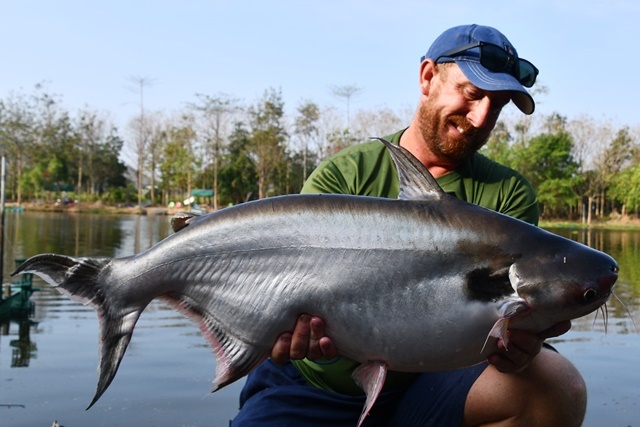 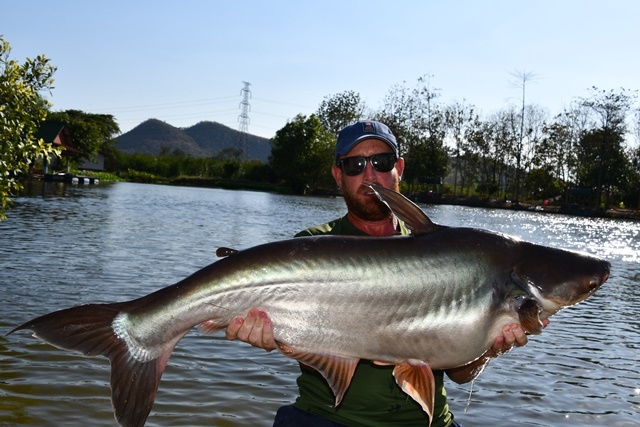 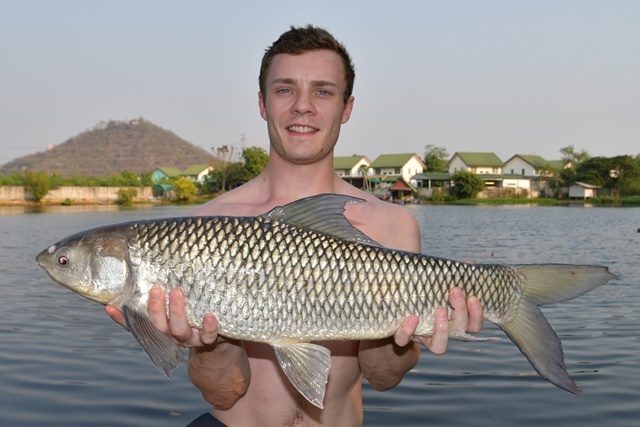 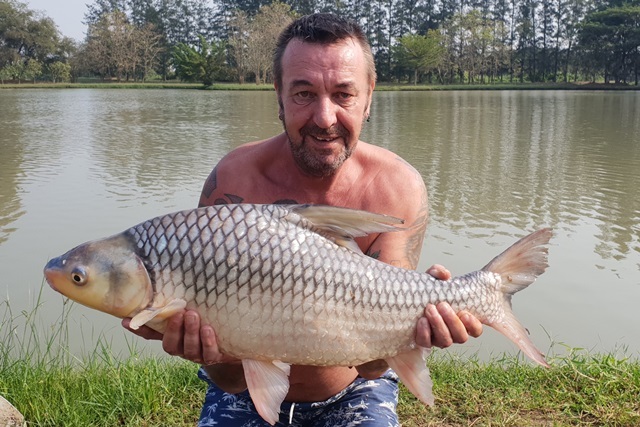 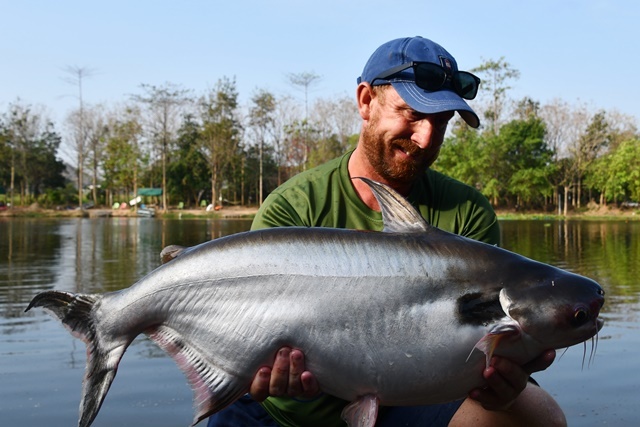 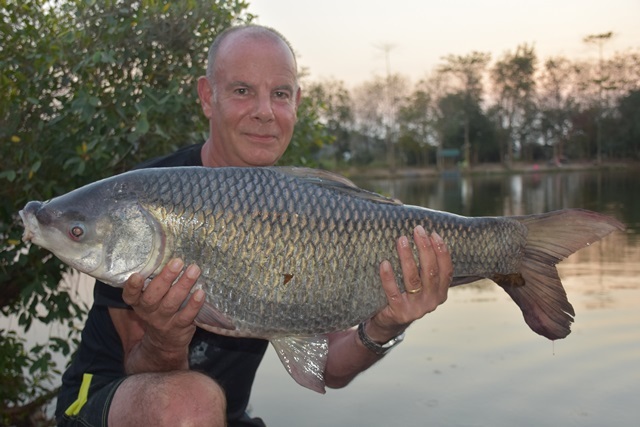 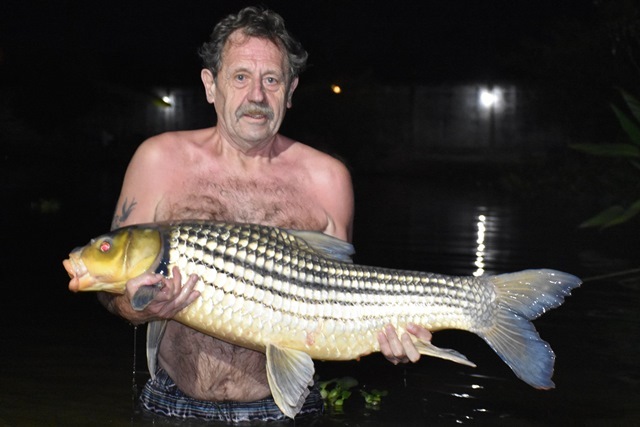 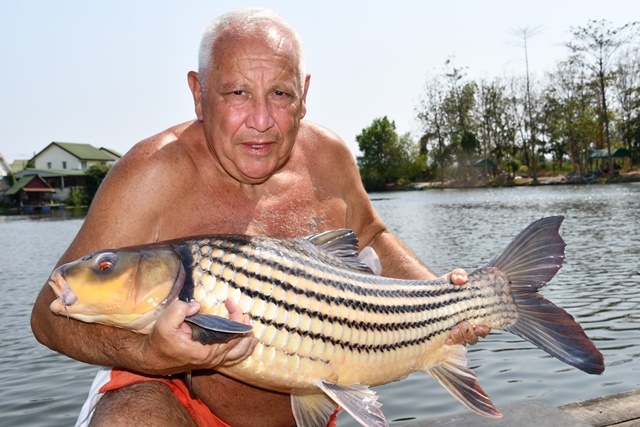 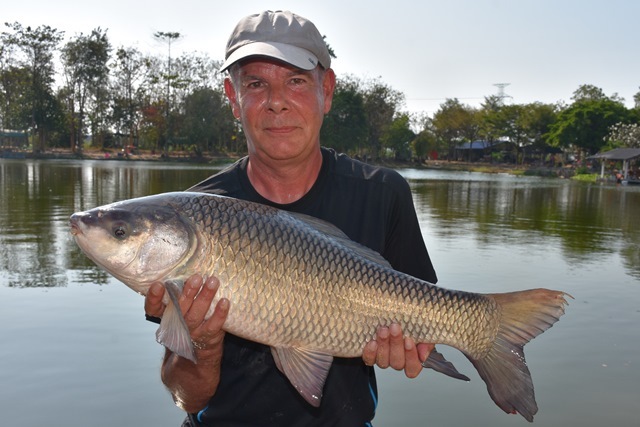 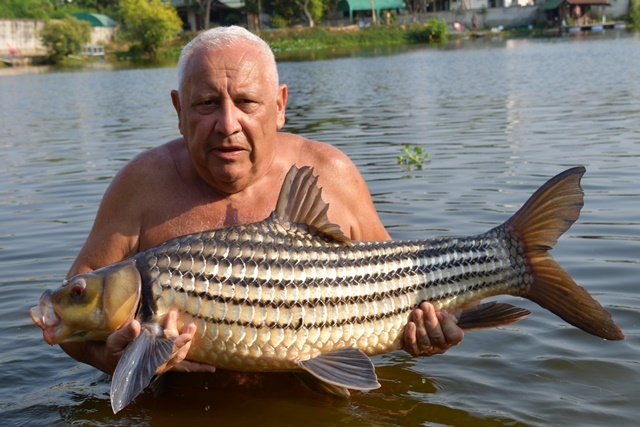 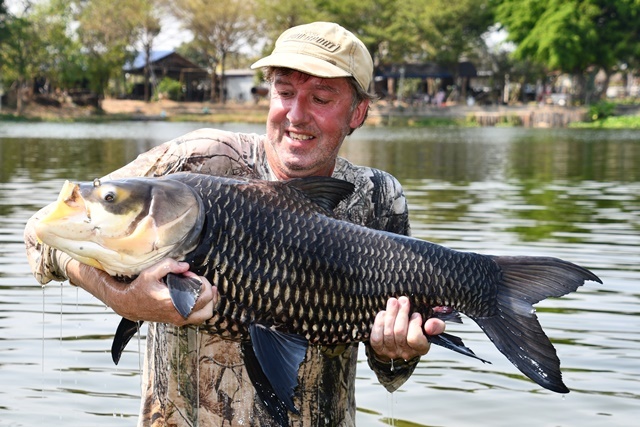 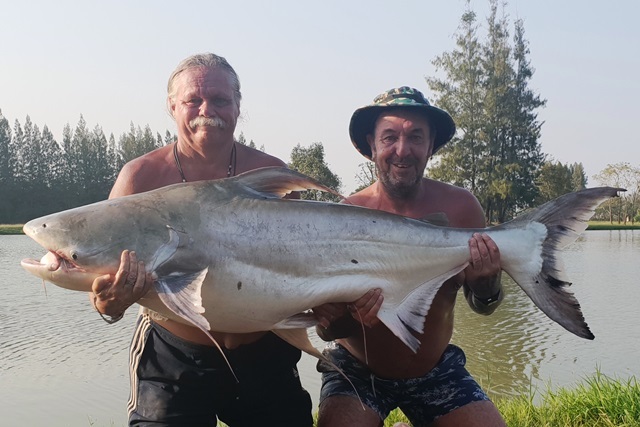 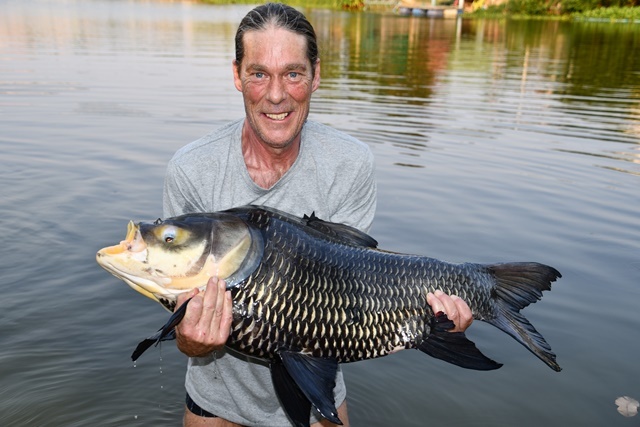 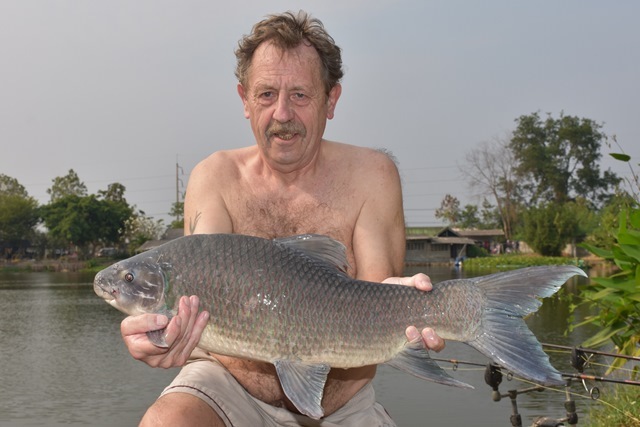 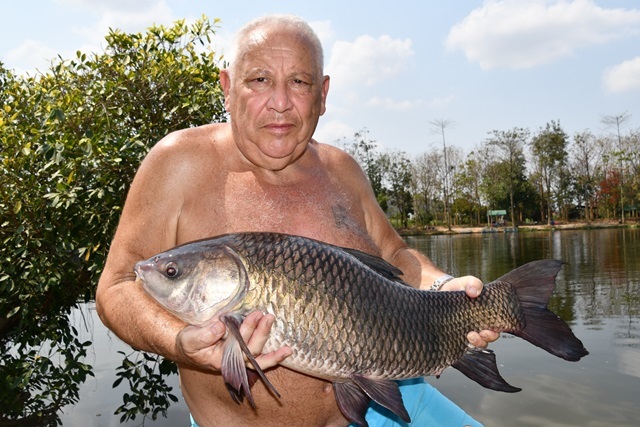 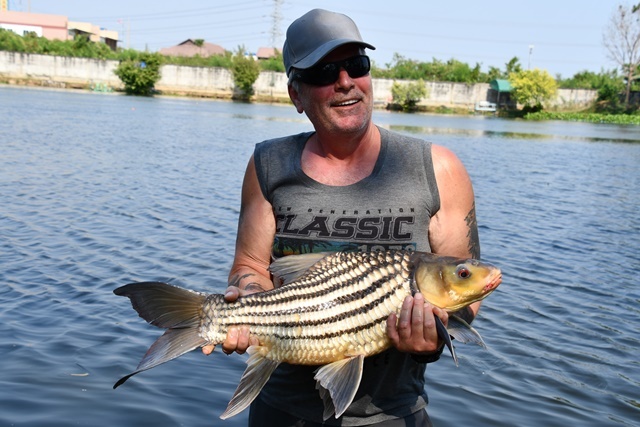 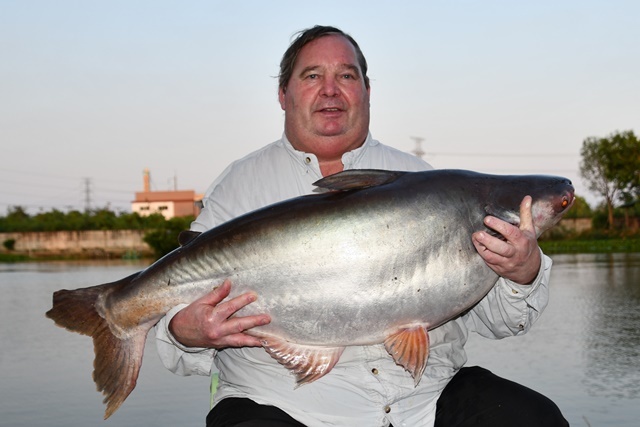 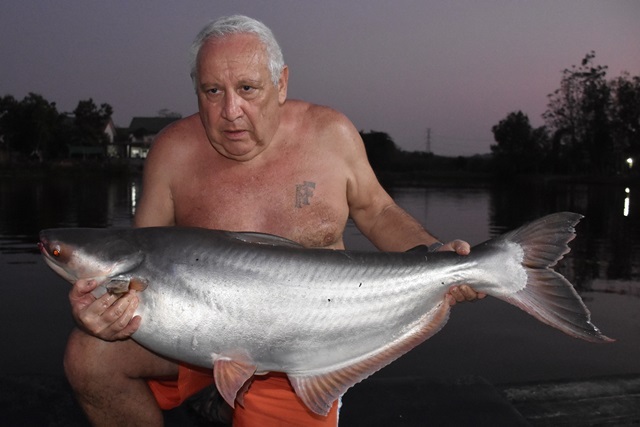 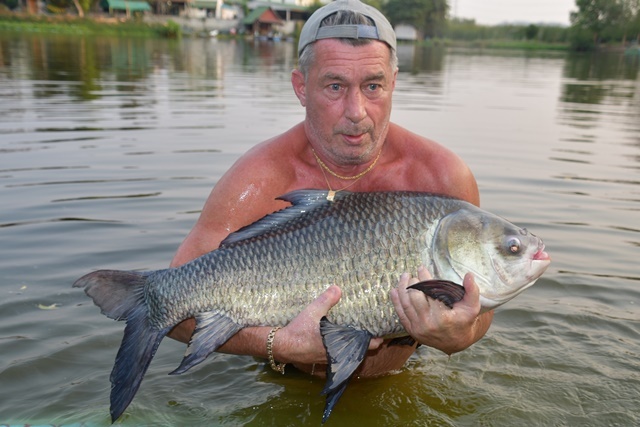 Richard Whitefoot was all smiles during his first visit to Palm Tree catching a superb Chinese silver carp, as well as tambaqui, striped catfish, Mekong catfish and Amazon redtail. 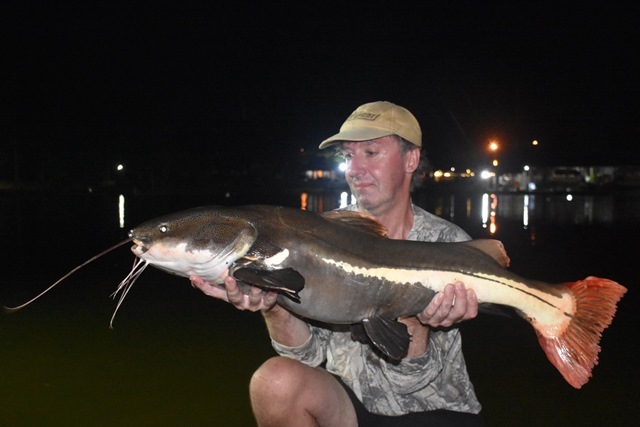 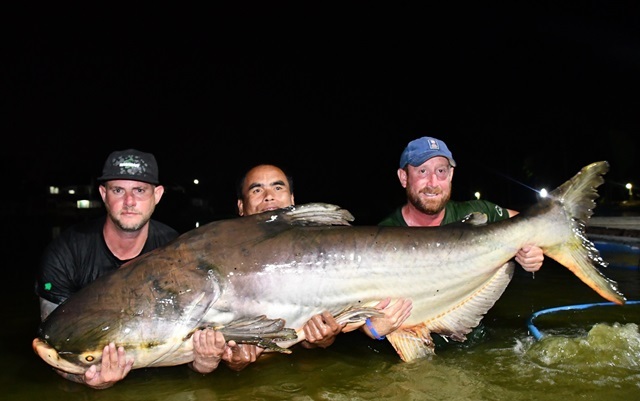 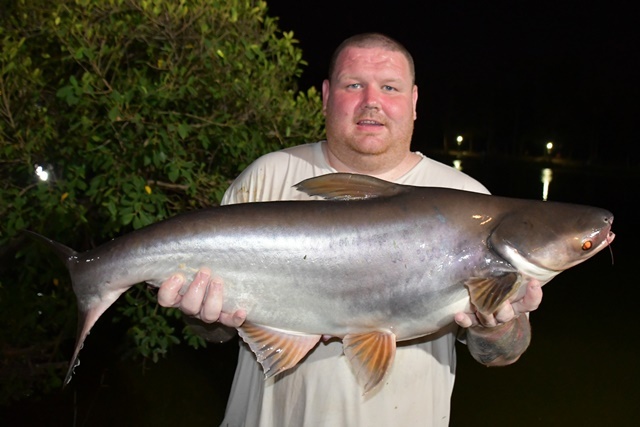 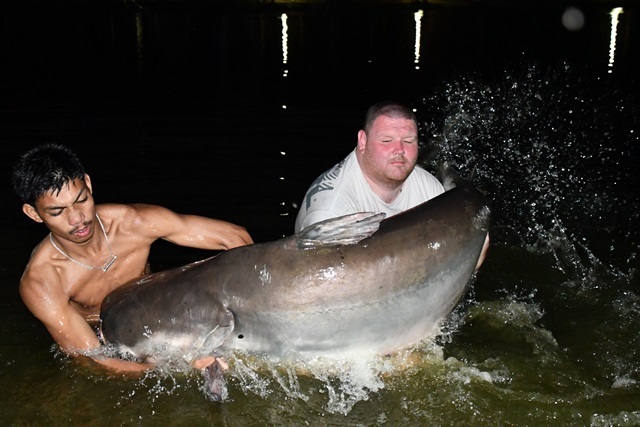 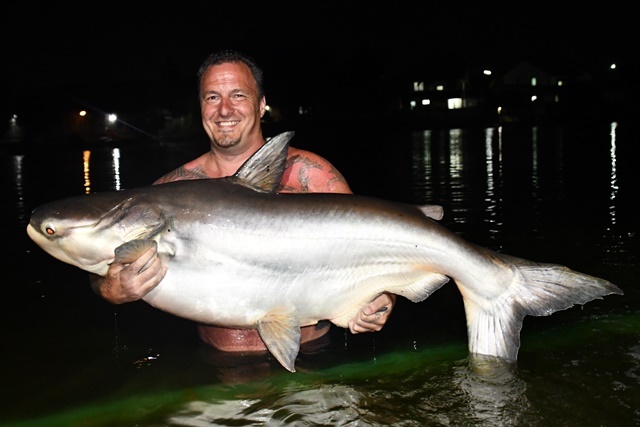 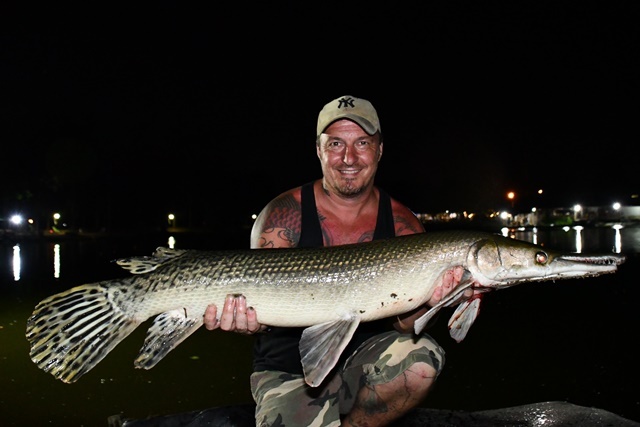 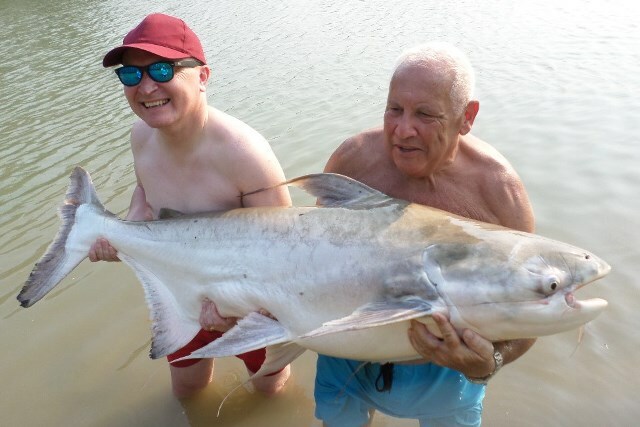 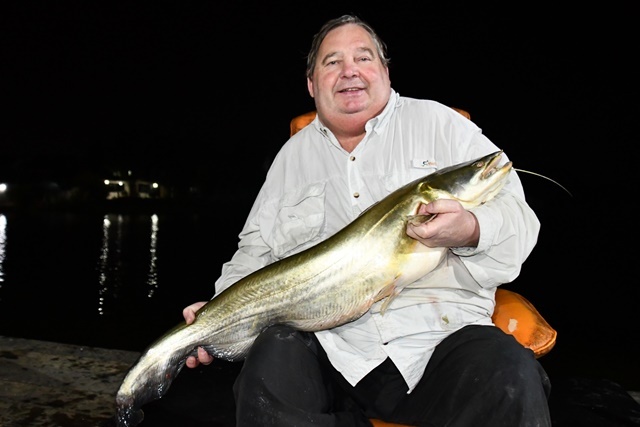 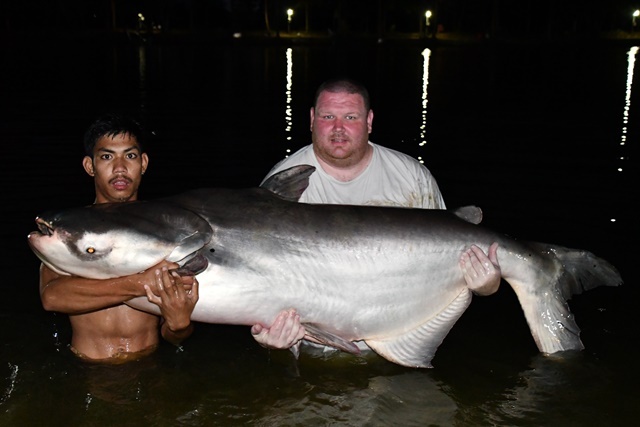 Derek Ewing was back for another one of his bi-annual visits catching a pb alligator gar as well as Mekong catfish, crystal eyed catfish a new species for him, big-Y catfish and striped catfish. 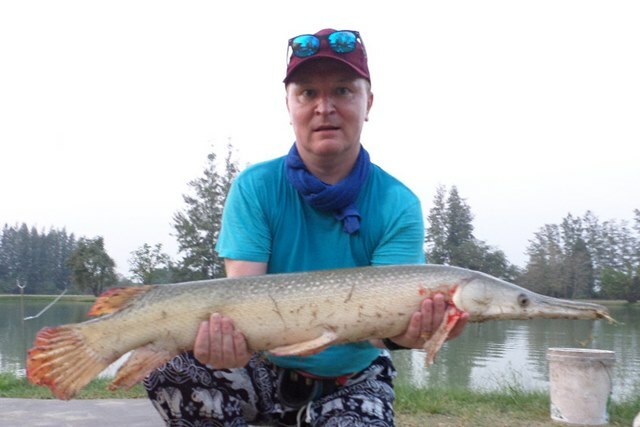 Richard Whitefoot who opted for a change of scenery and went with Benny to IT Monster lake where he caught chao phraya catfish, soldier river barb, alligator gar, Amazon redtail and pacu. 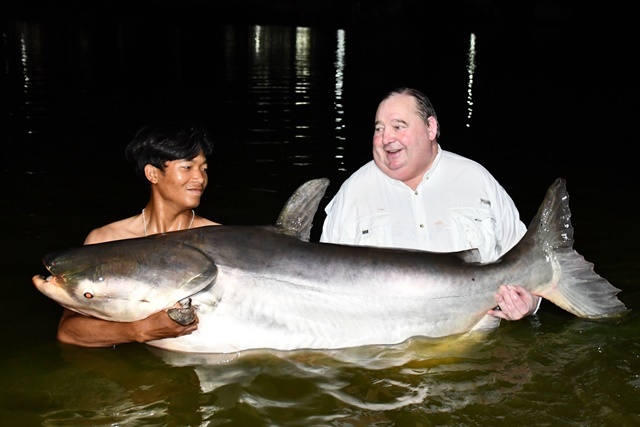 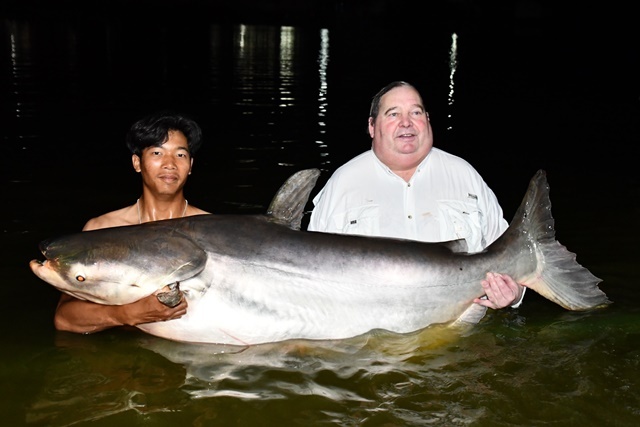 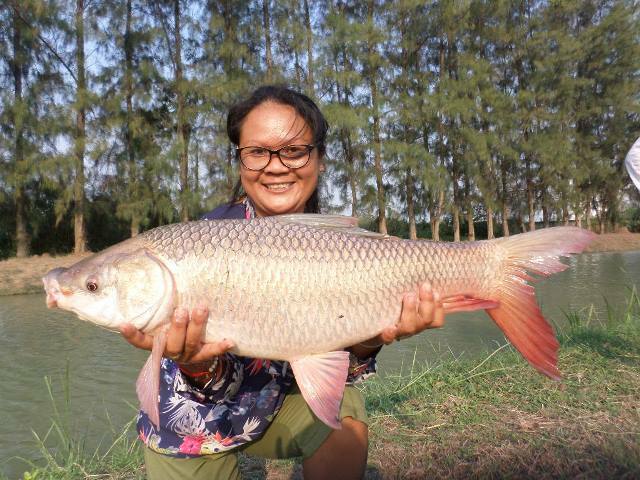 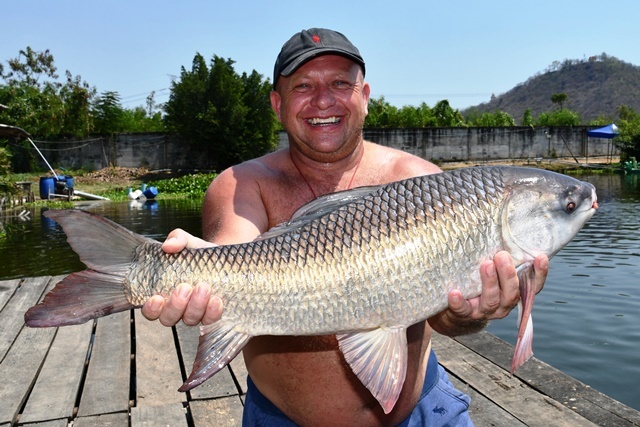 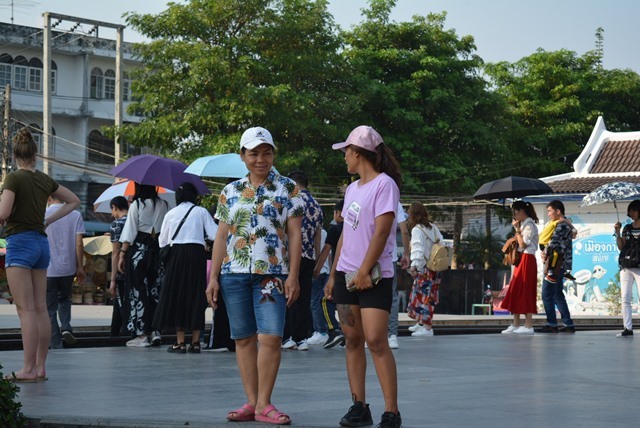 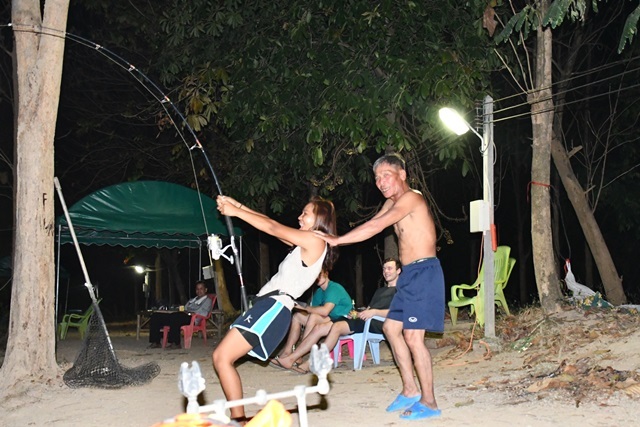 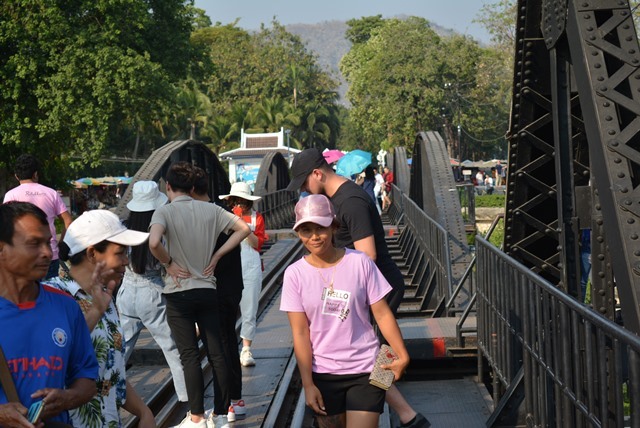 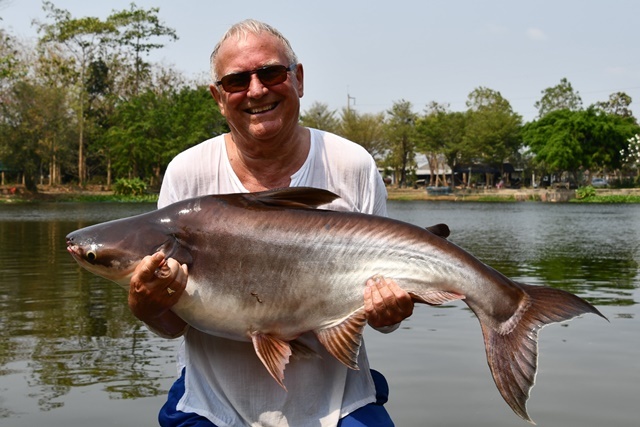 Tap of Bangkok Fishing Guide brought down a couple of customers who were all smiles with their catches of a rare Salween rita, some good sized alligator gar and chao phraya catfish, Juliens golden price carp, Mekong catfish, tambaqui, wallago attu, Siamese carp, and Asaina redtail. 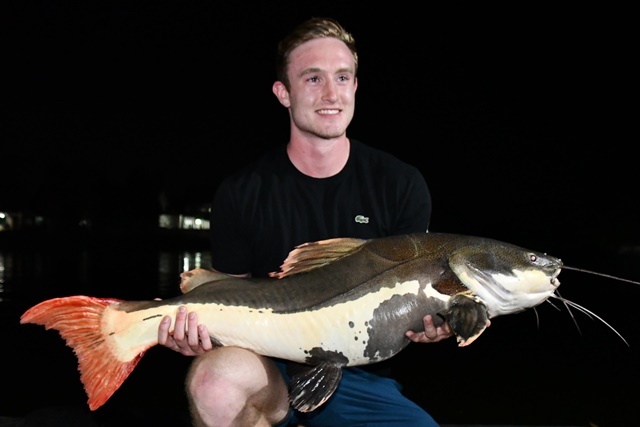 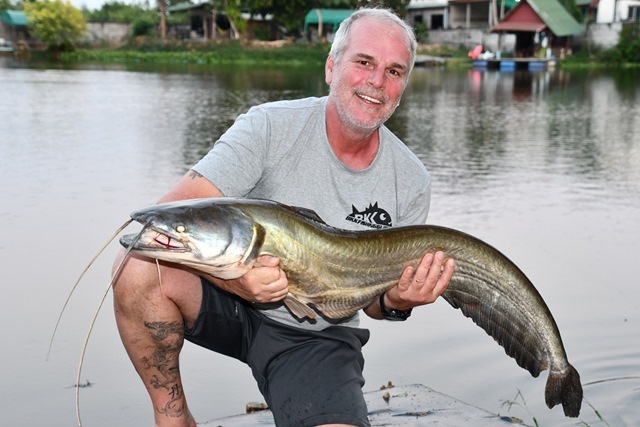 Stephen Norris had a good first visit to Palm Tree catching a number of fish that included some big Mekong catfish, Siamese carp, good sized alligator gar, wallago attu, striped catfish, catfish shark, as well as both Amazon and Asian redtail. 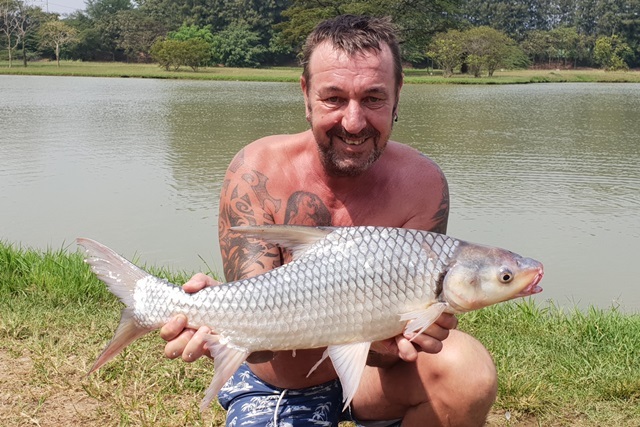 Benny had a go with bread flake on the waggler at IT Monster lake and successfully caught arawana, Thai mahseer, common carp and rohu. 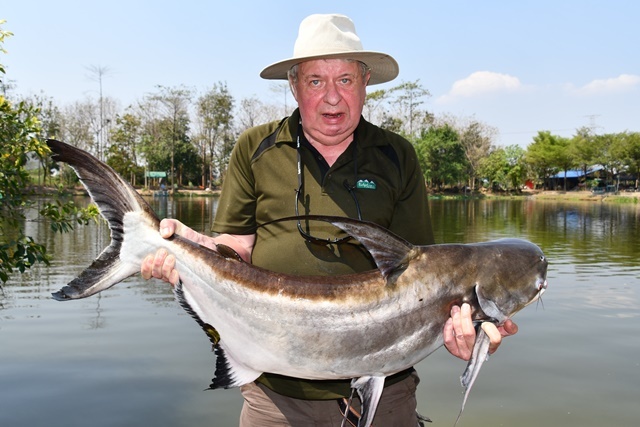 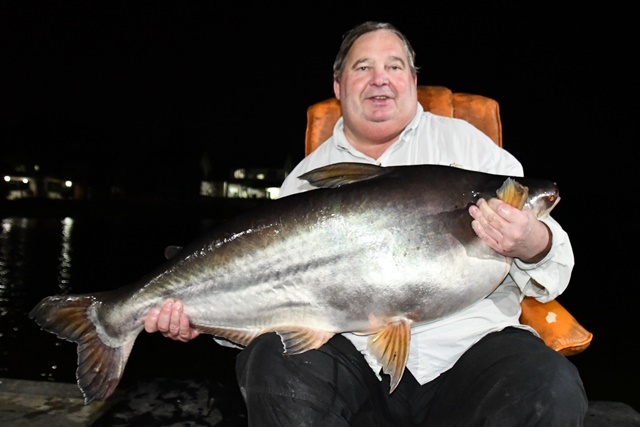 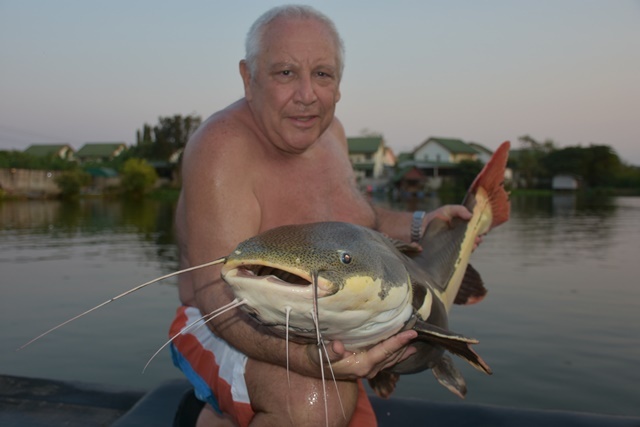 Bill Maloney returned after after a lengthy absence this time catching leopard catfish, rohu, as well as both Asian and Amazon redtail. 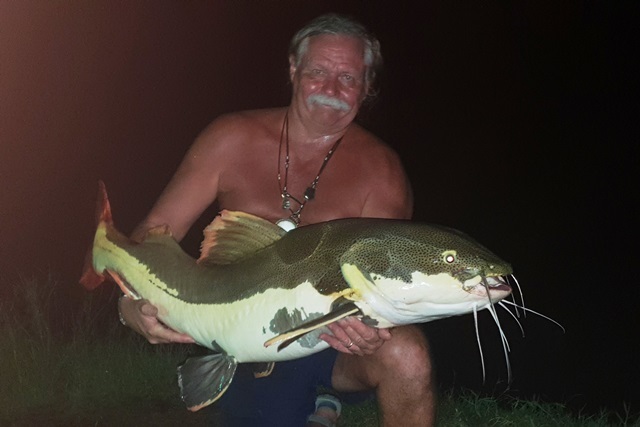 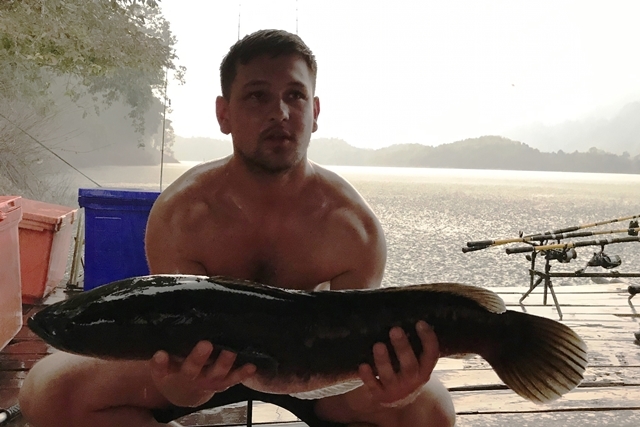 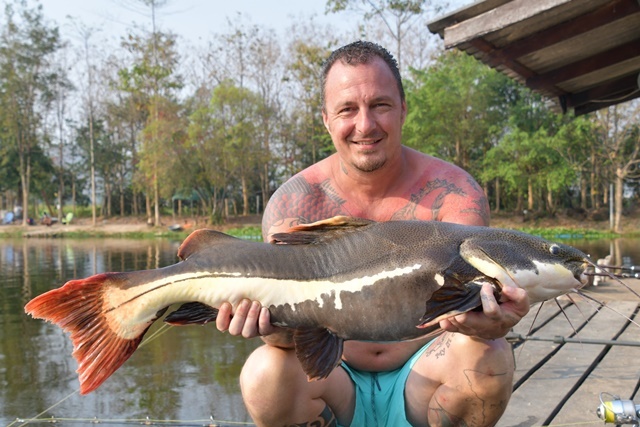 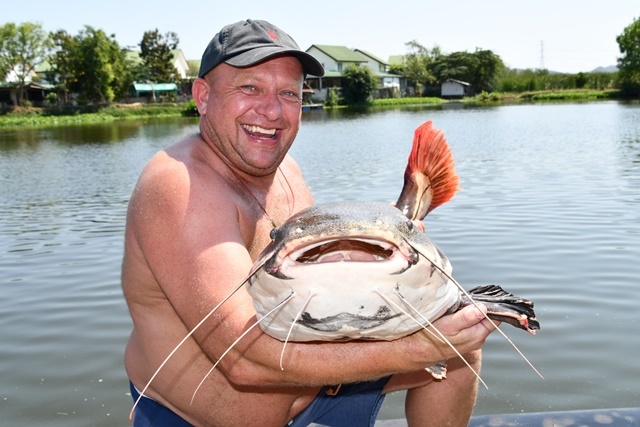 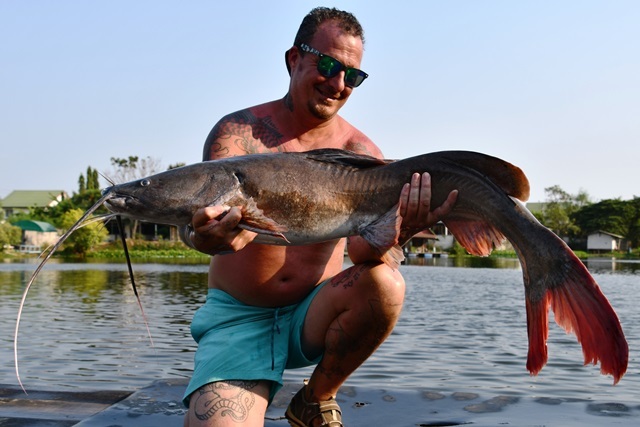 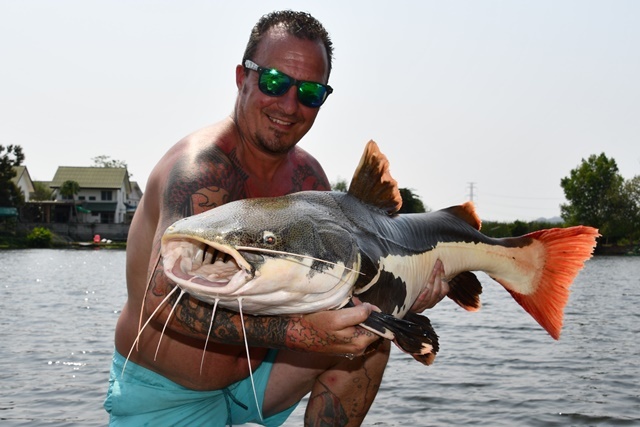 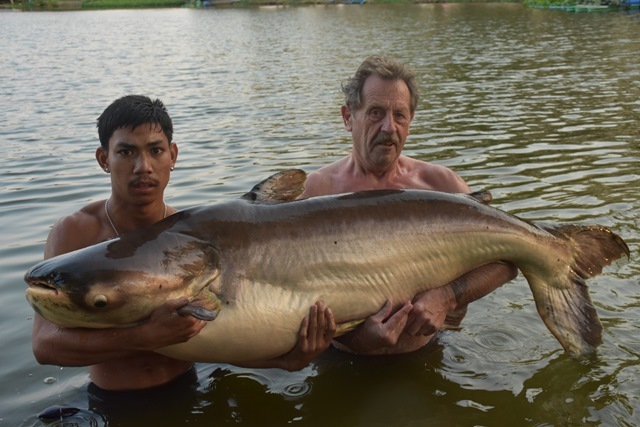 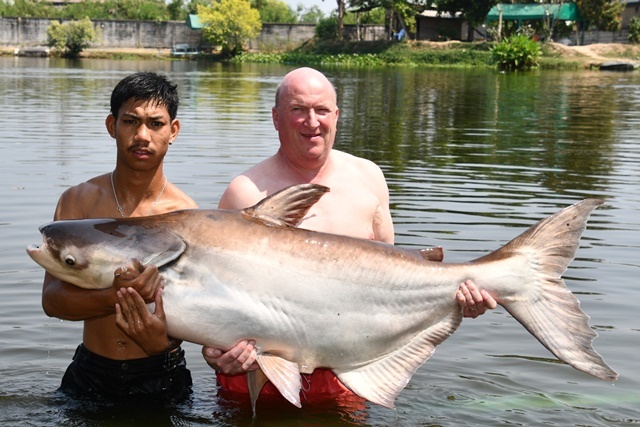 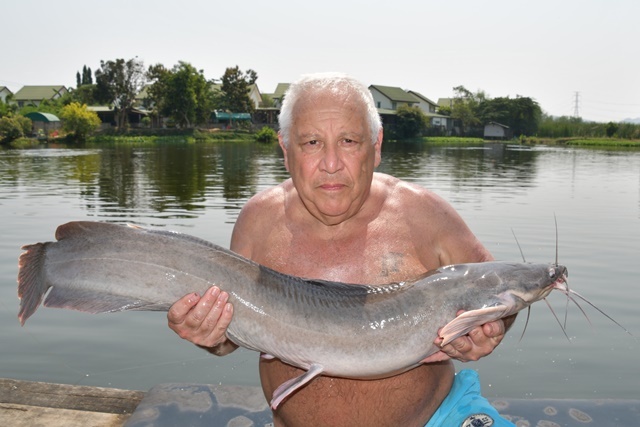 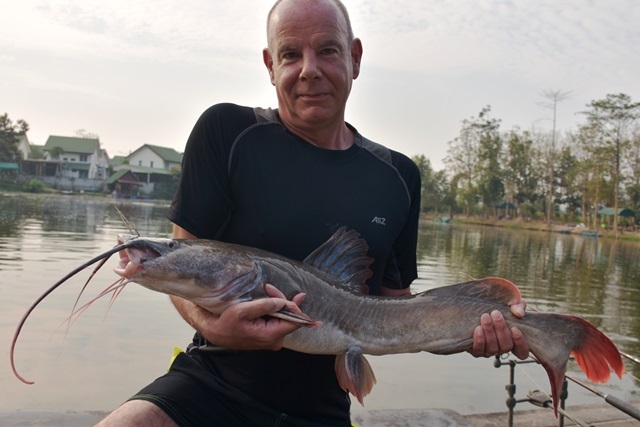 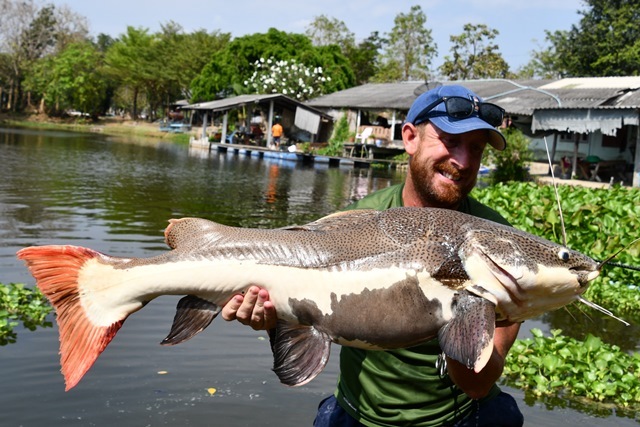 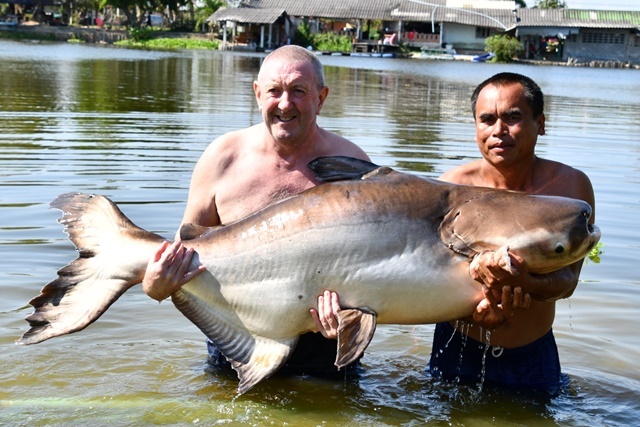 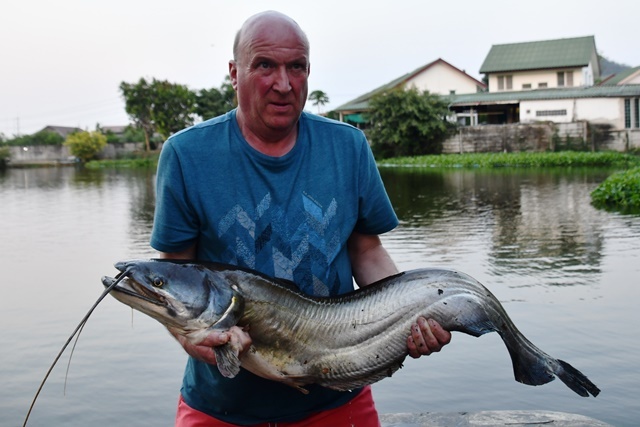 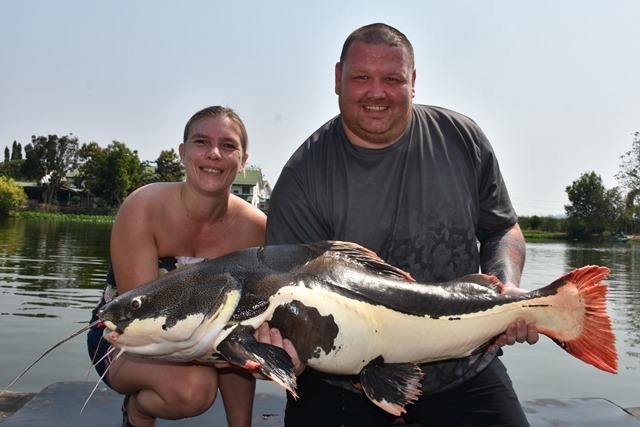 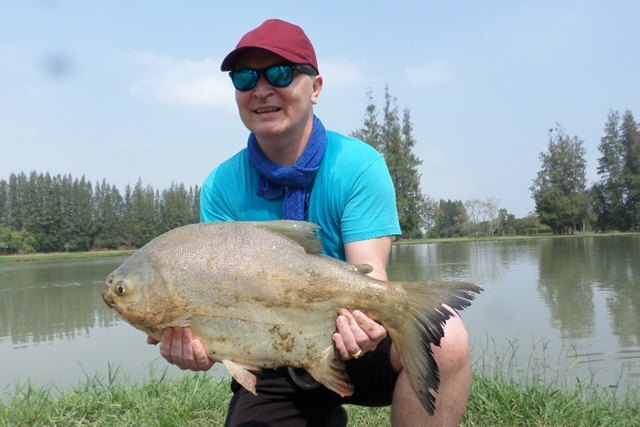 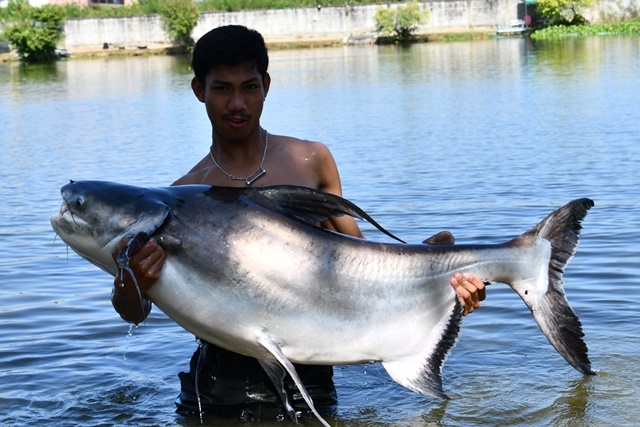 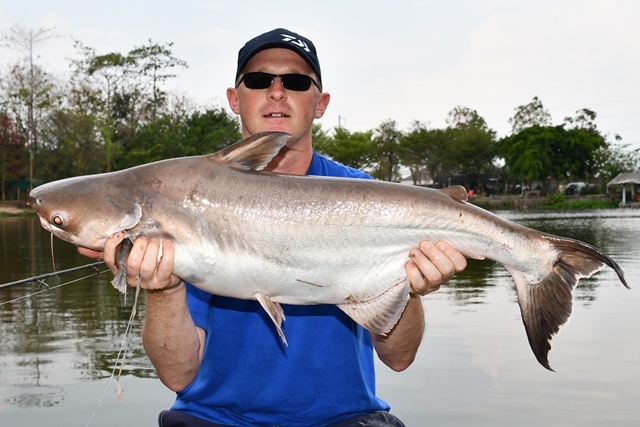 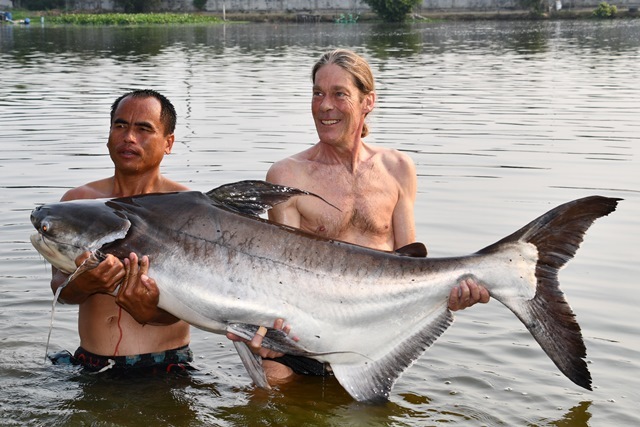 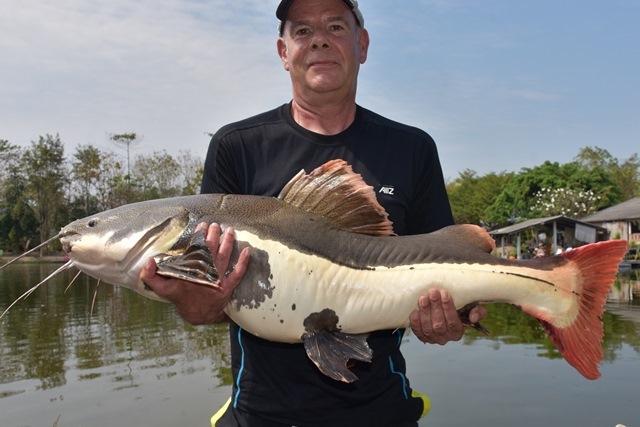 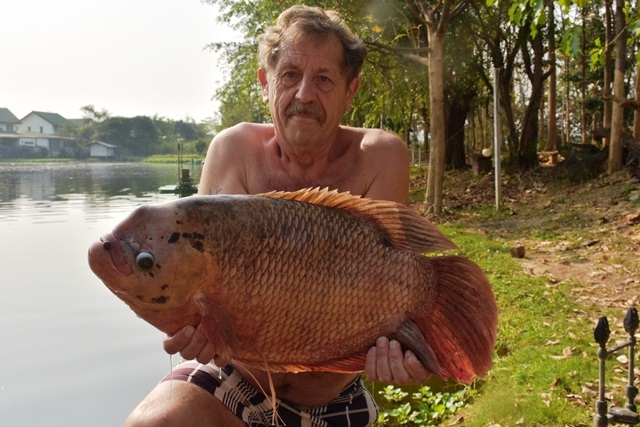 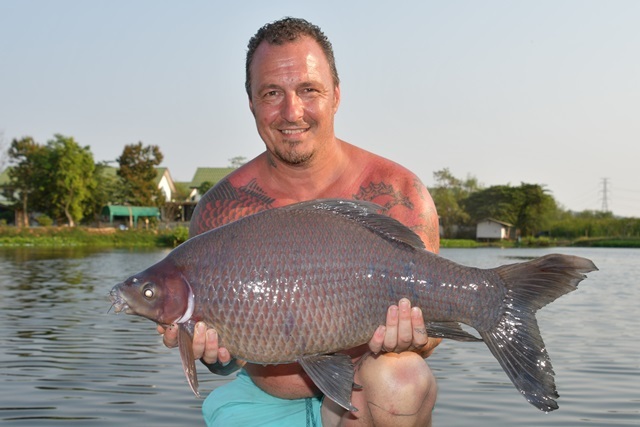 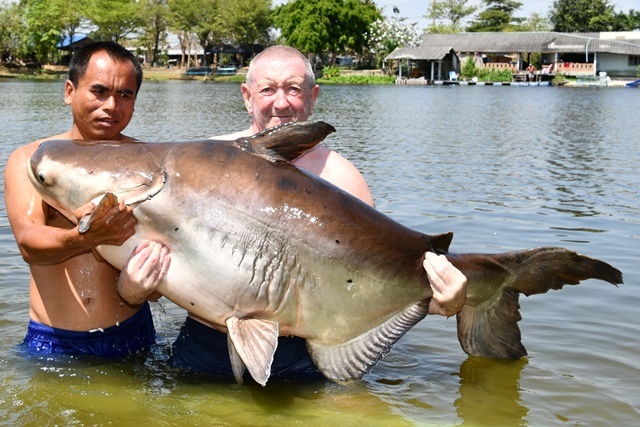 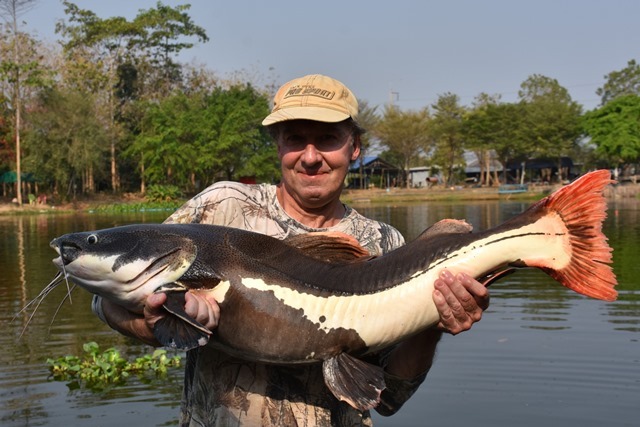 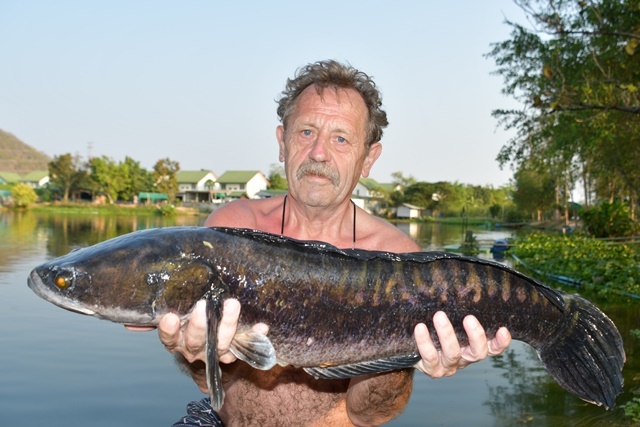 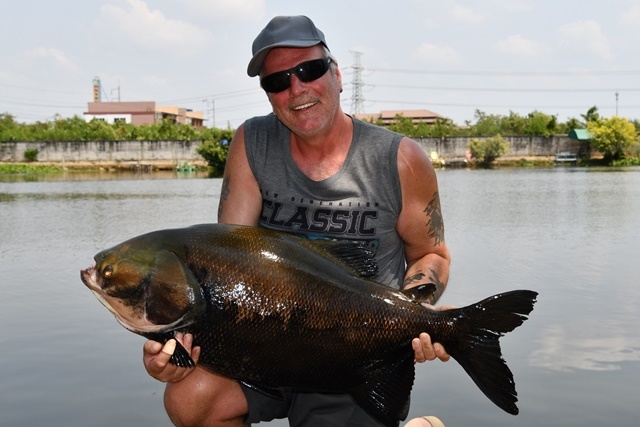 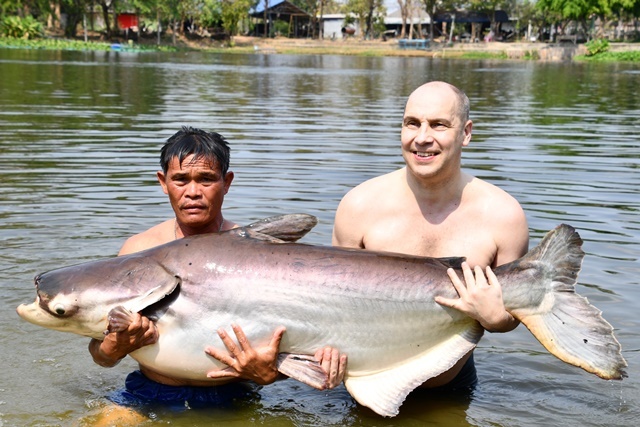 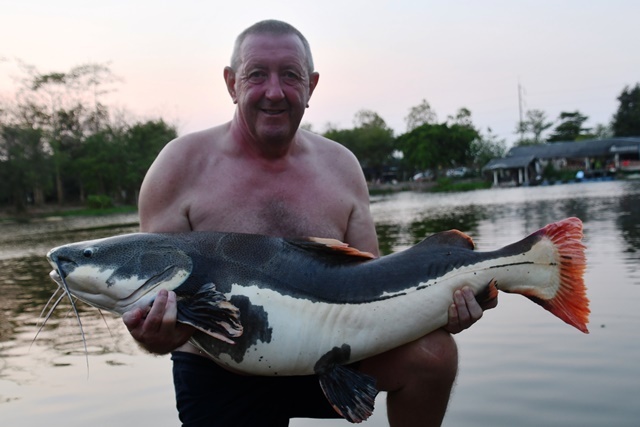 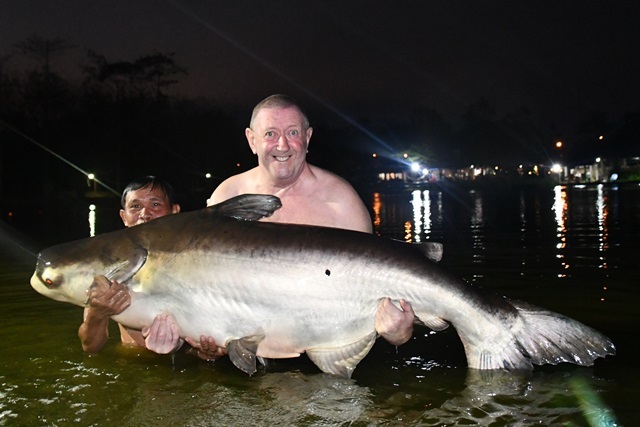 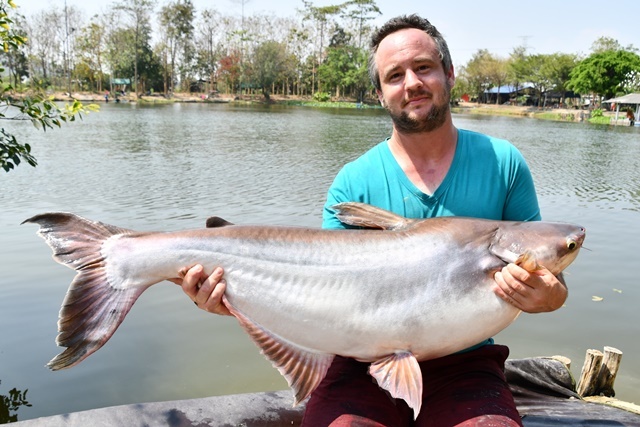 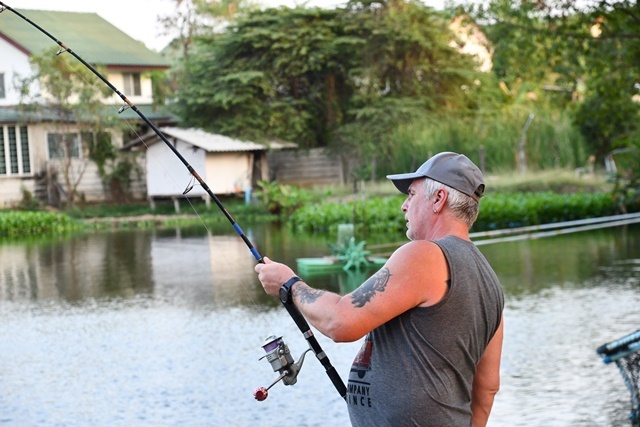 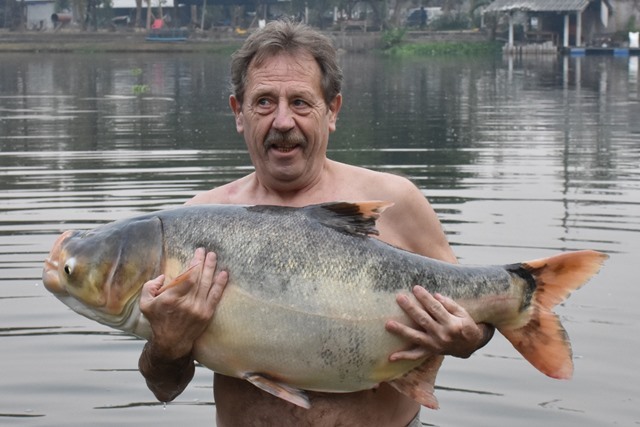 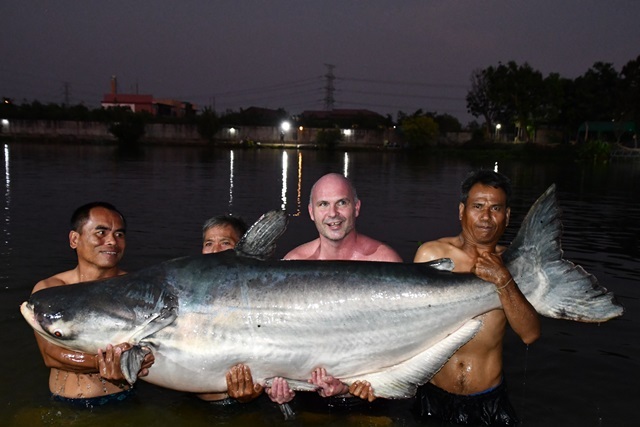 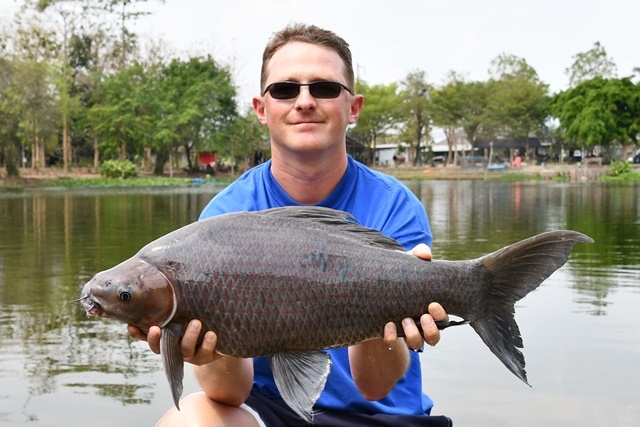 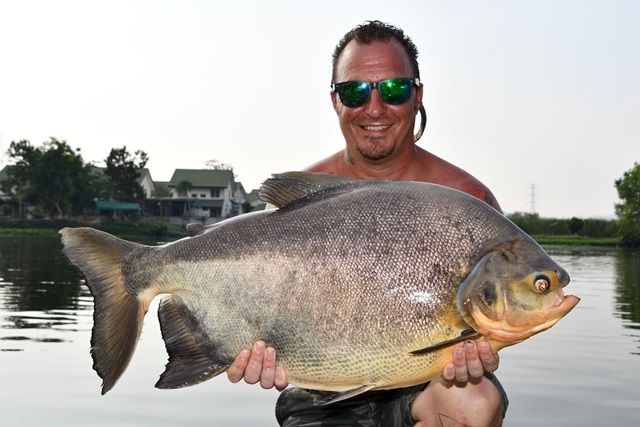 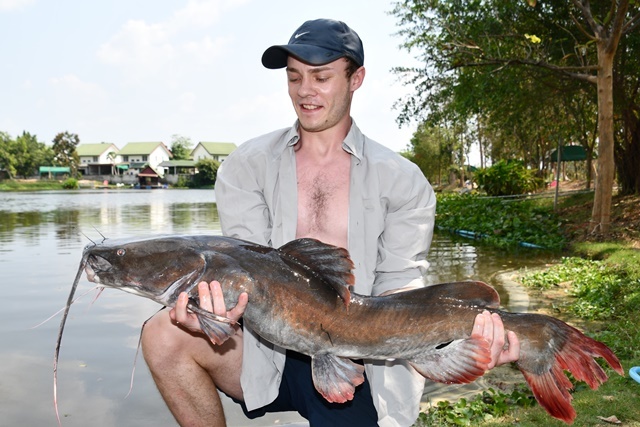 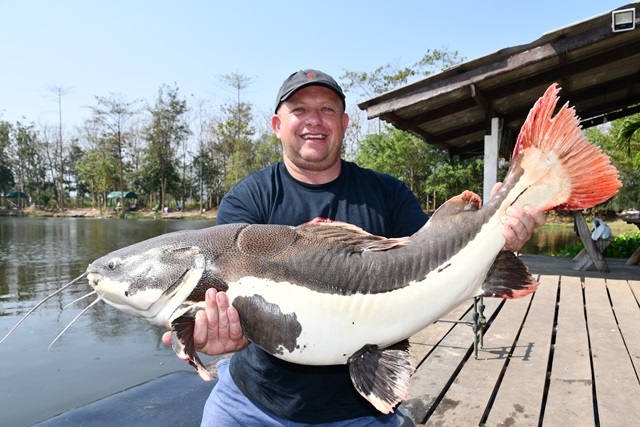 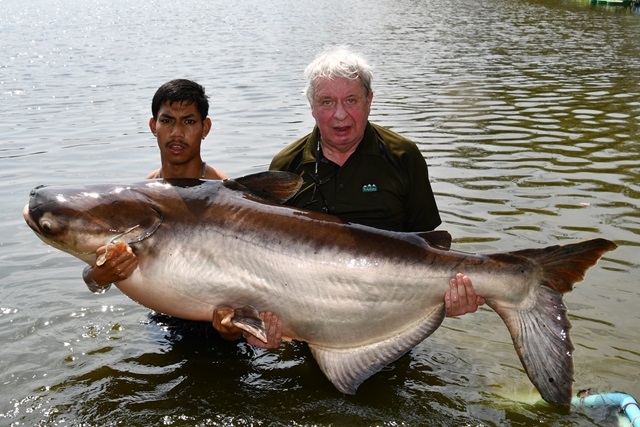 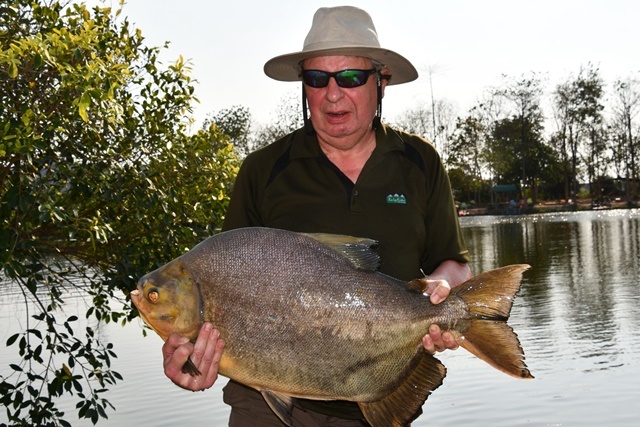 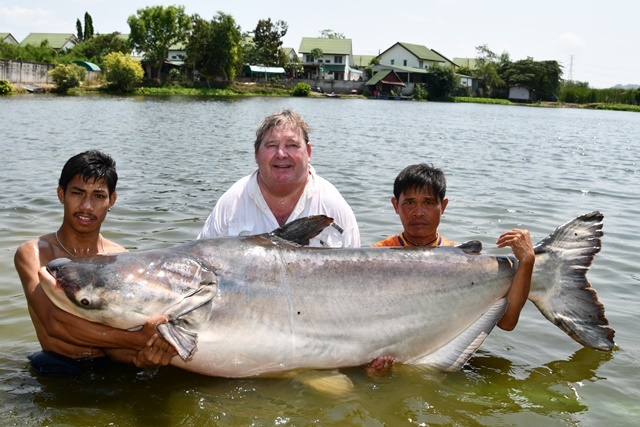 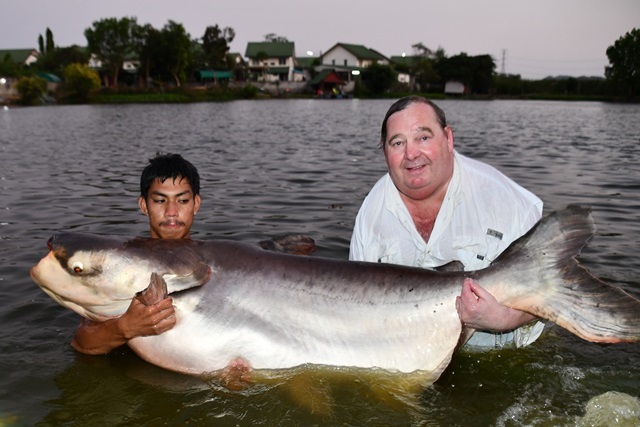 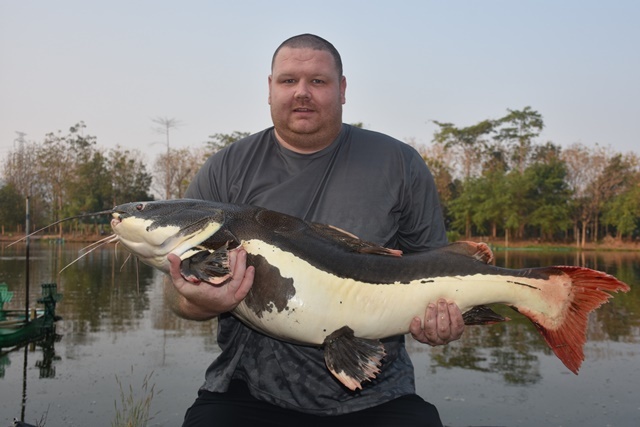 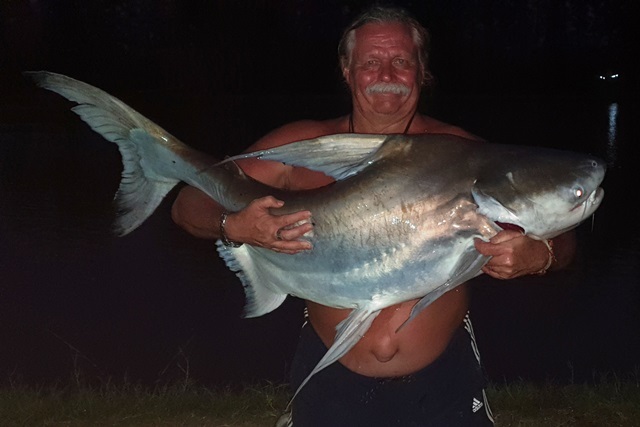 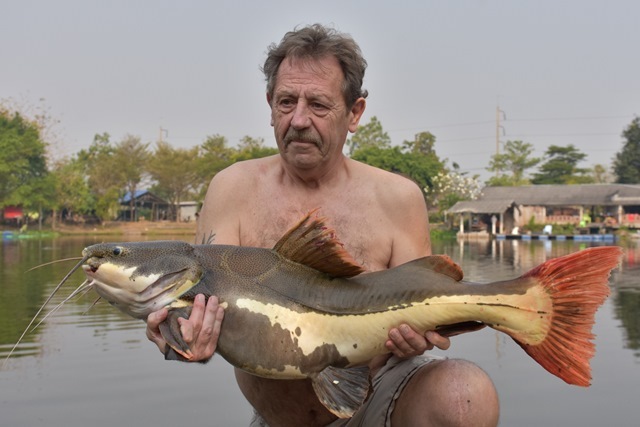 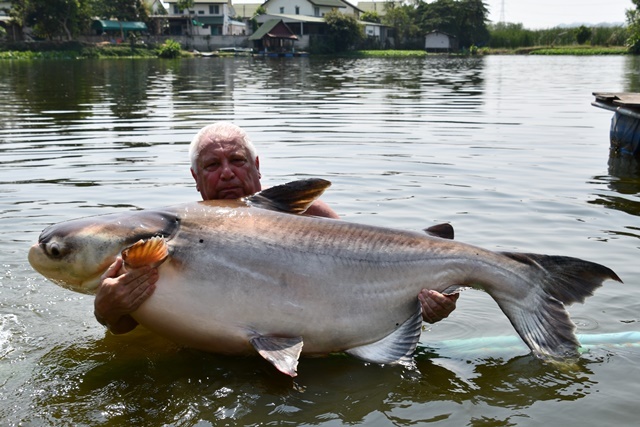 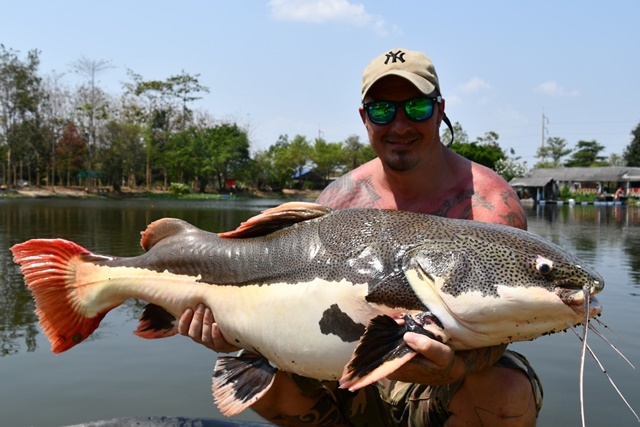 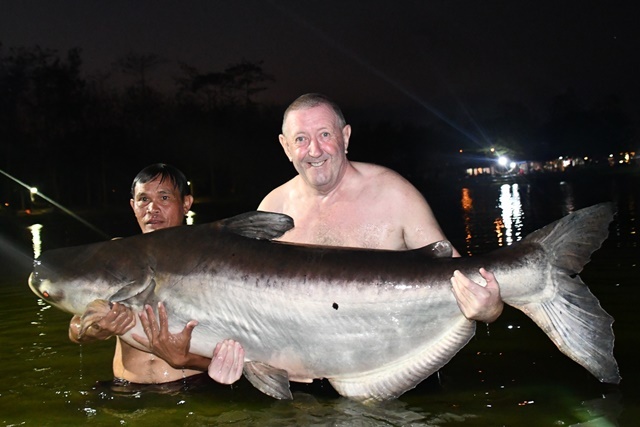 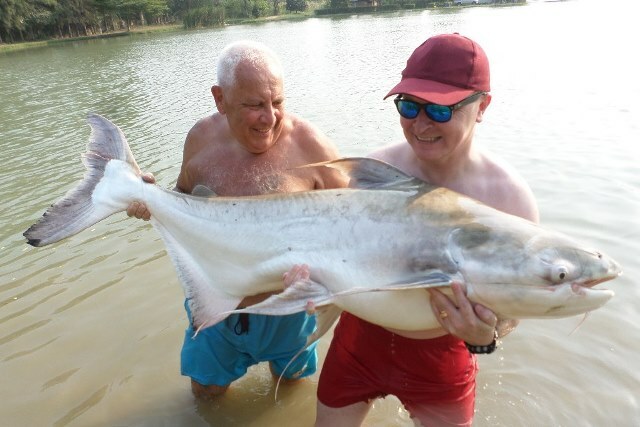 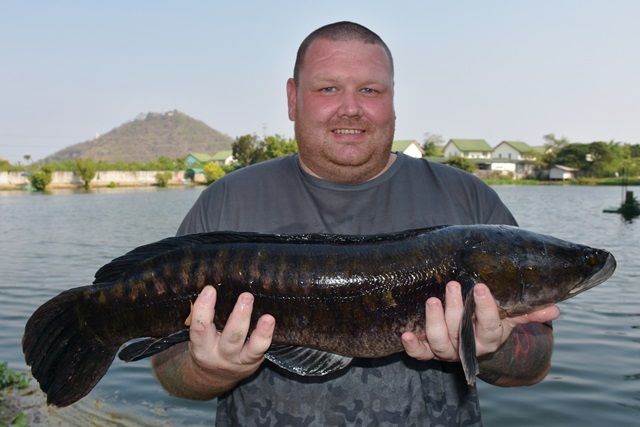 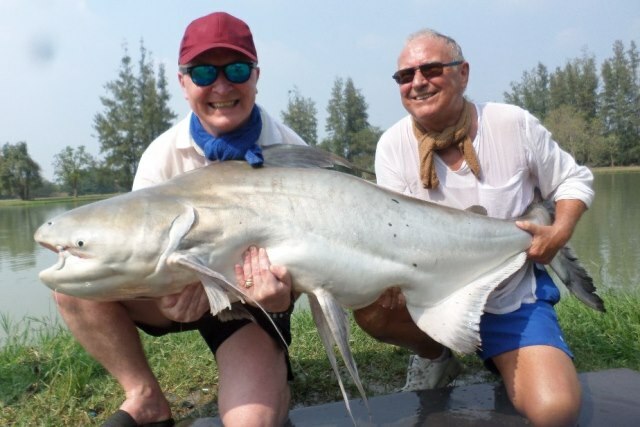 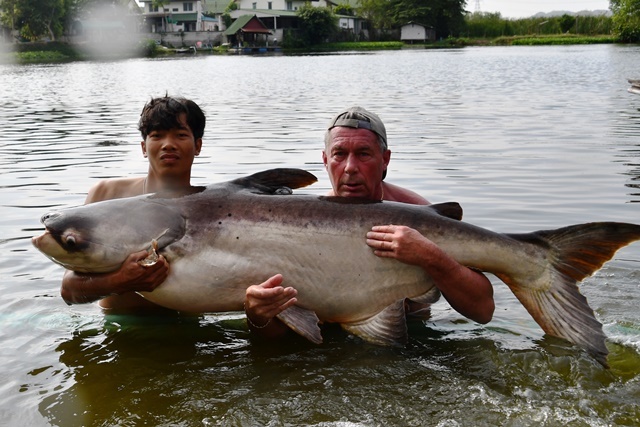 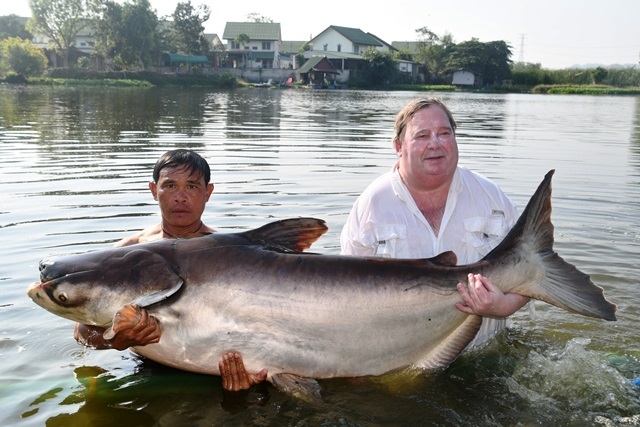 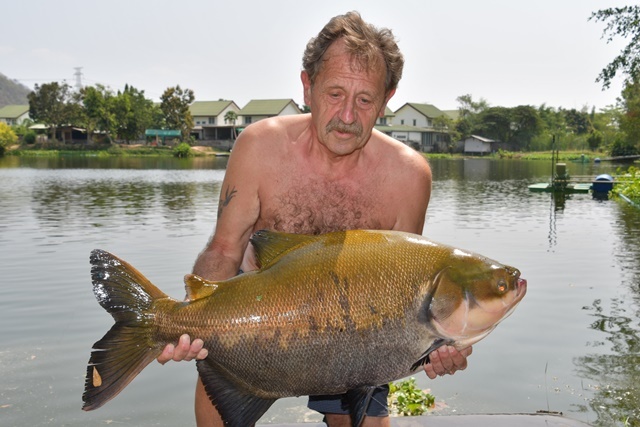 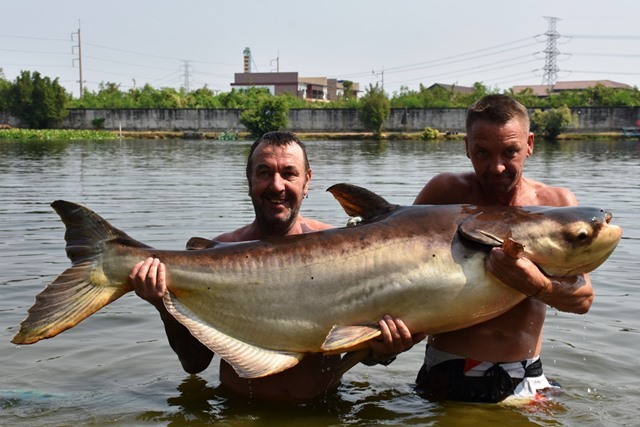 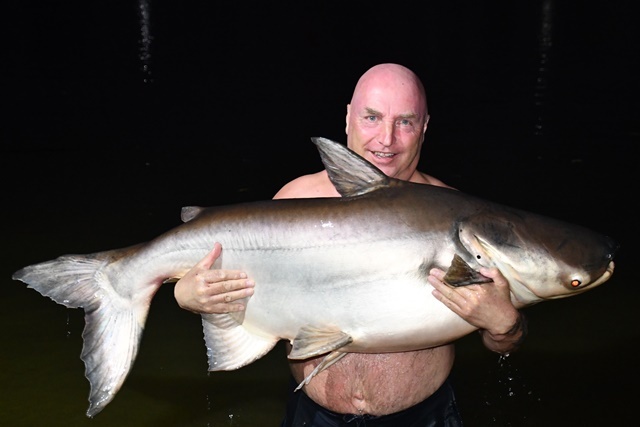 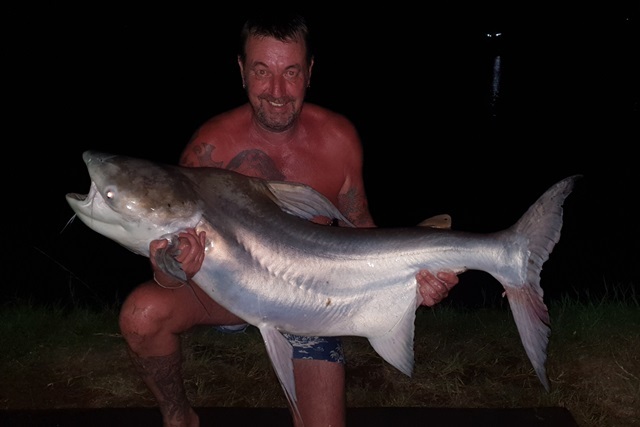 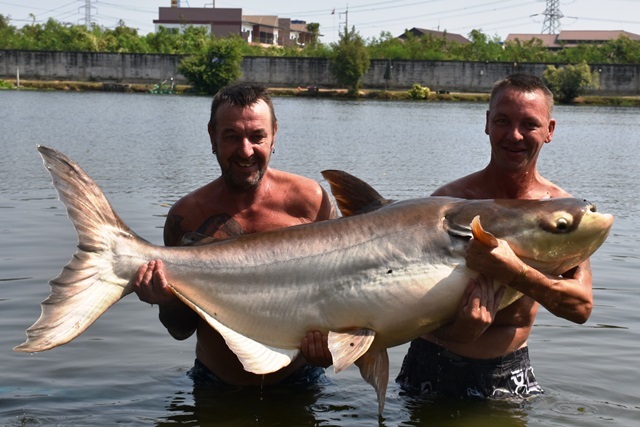 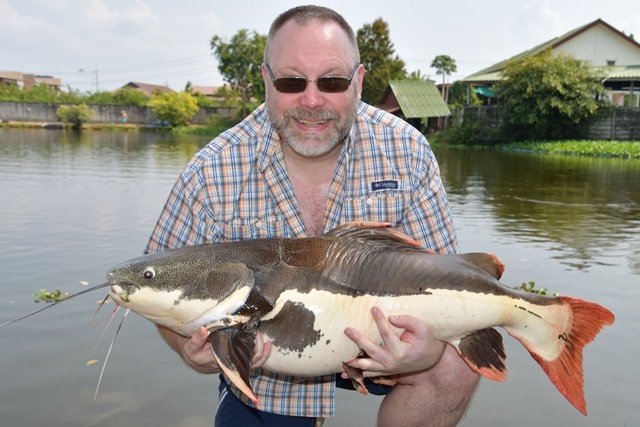 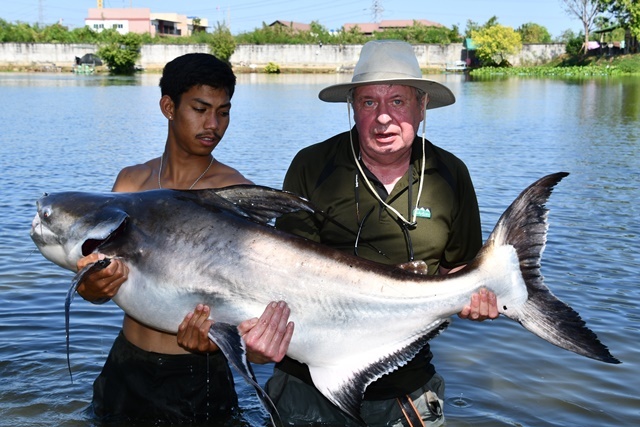 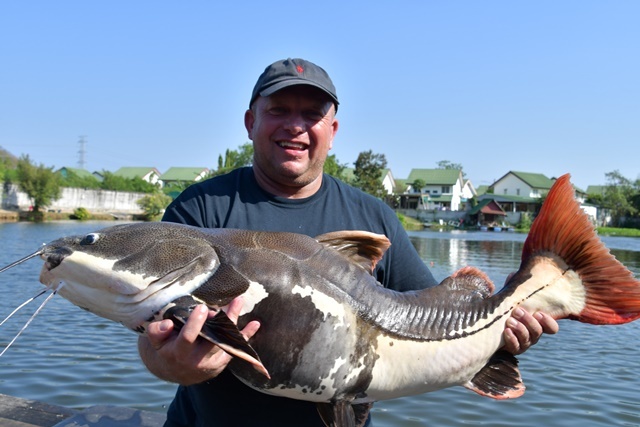 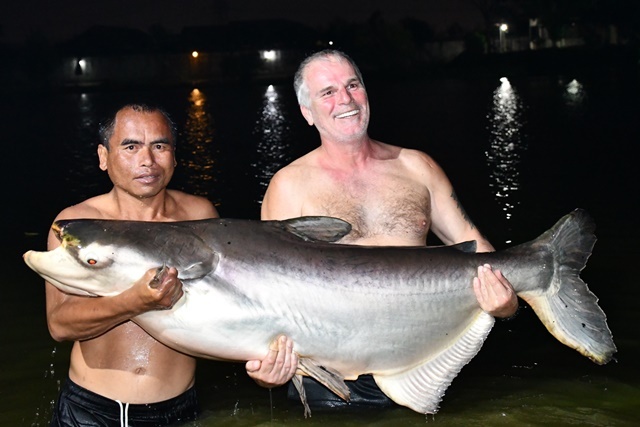 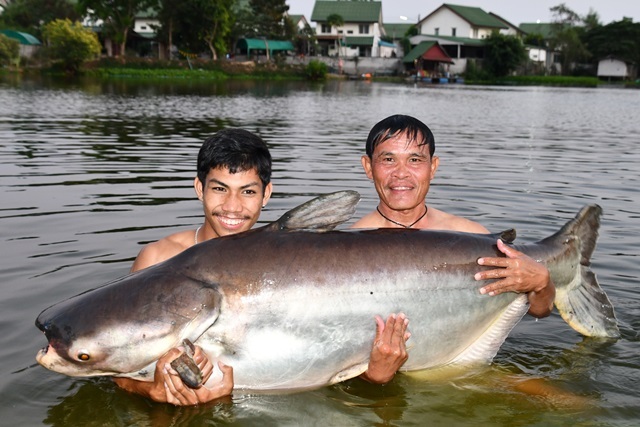 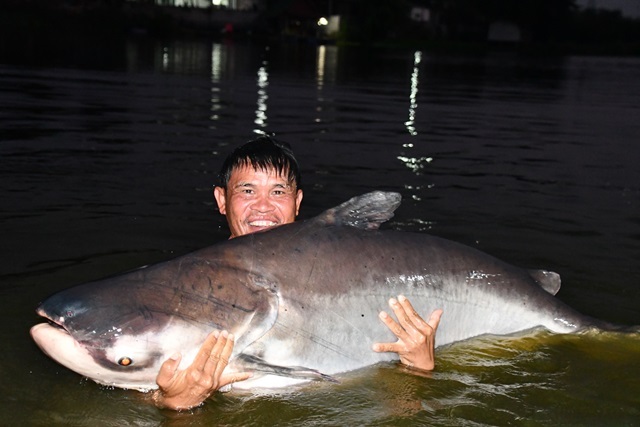 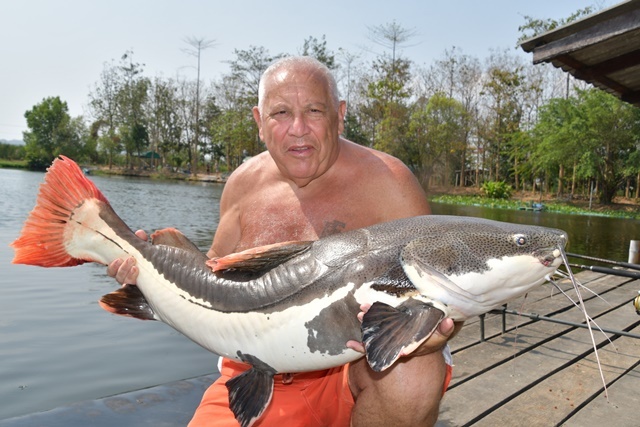 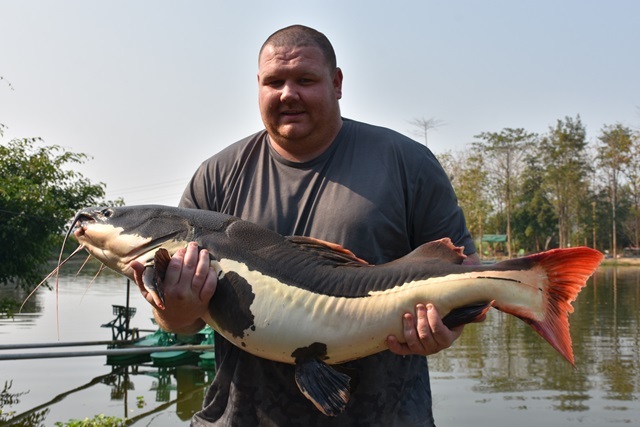 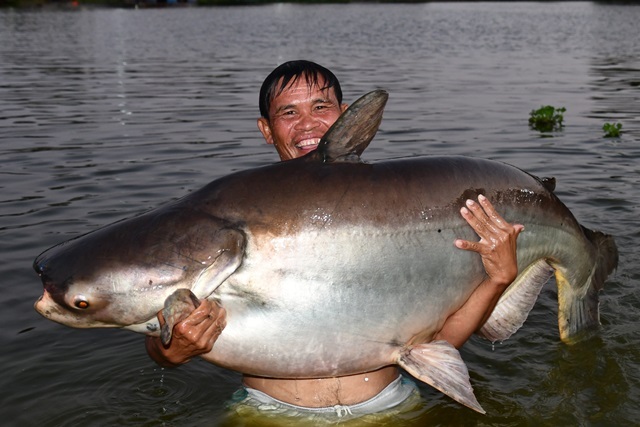 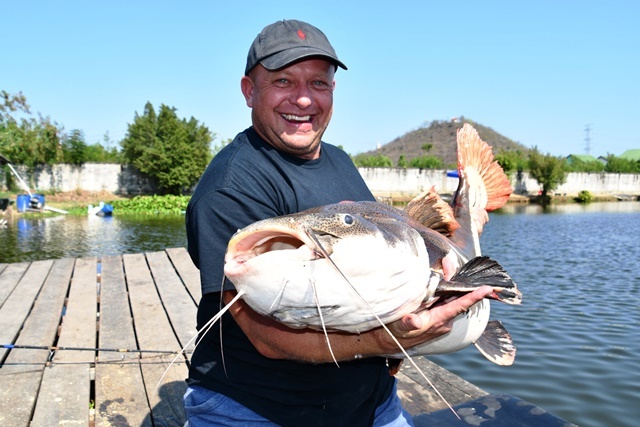 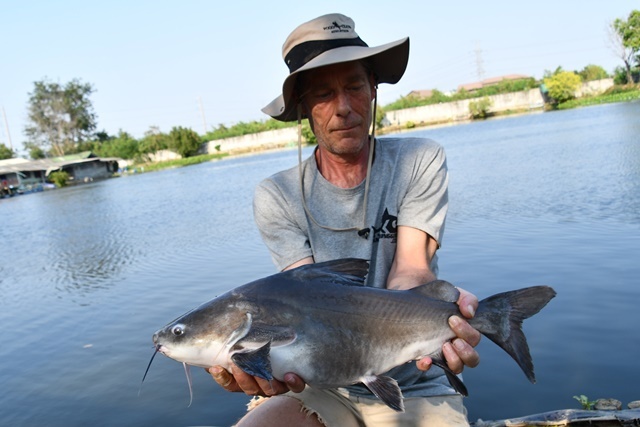 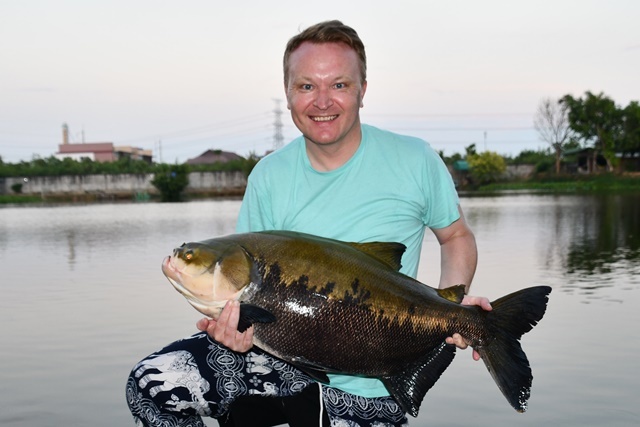 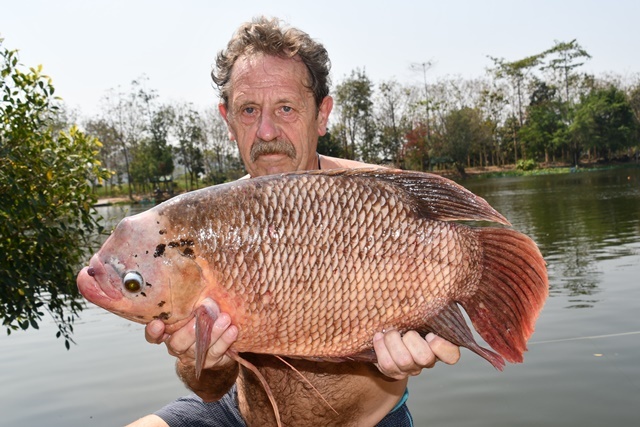 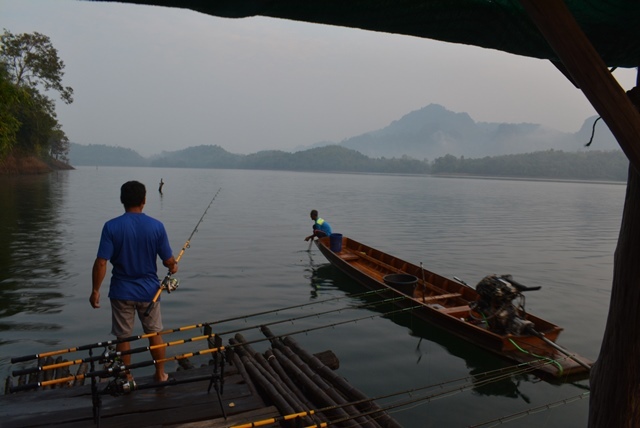 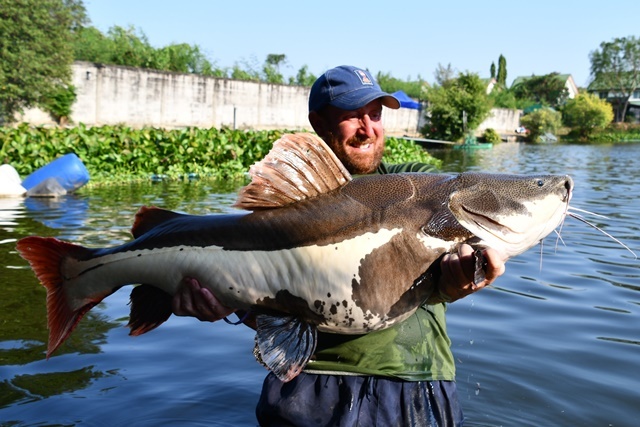 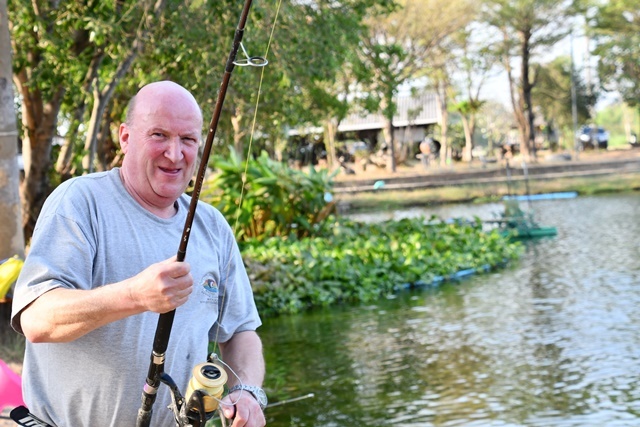 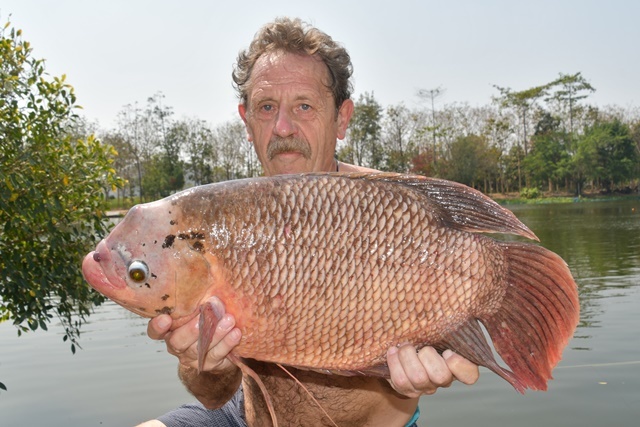 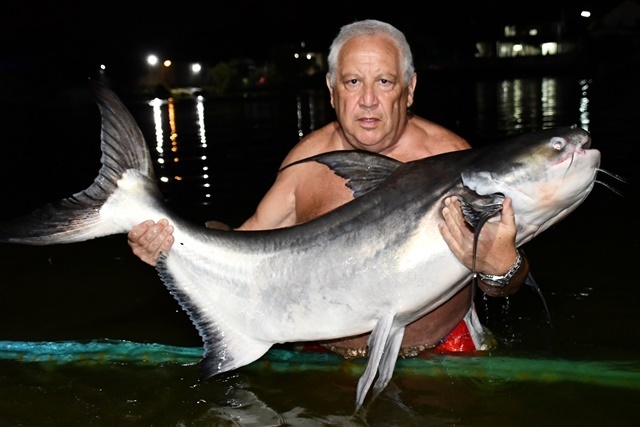 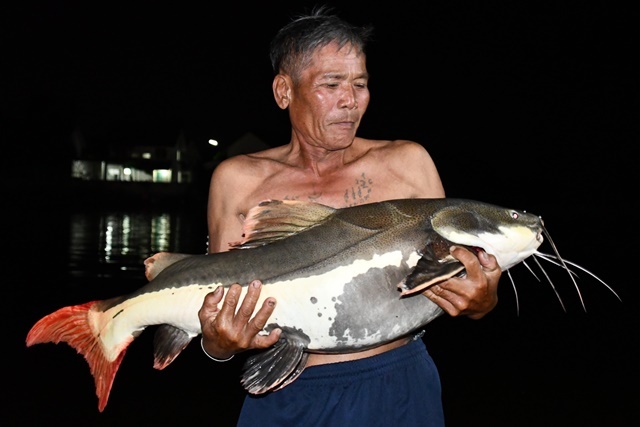 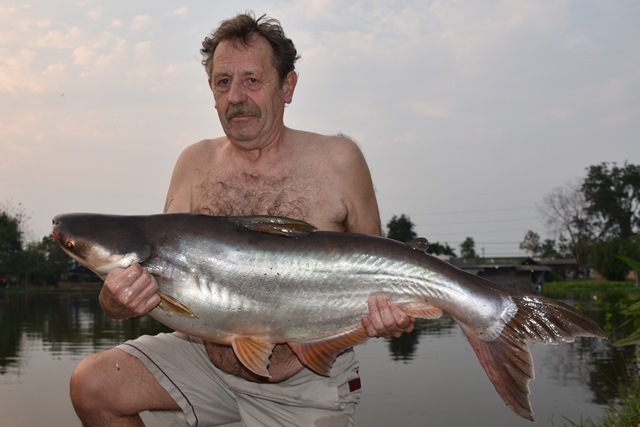 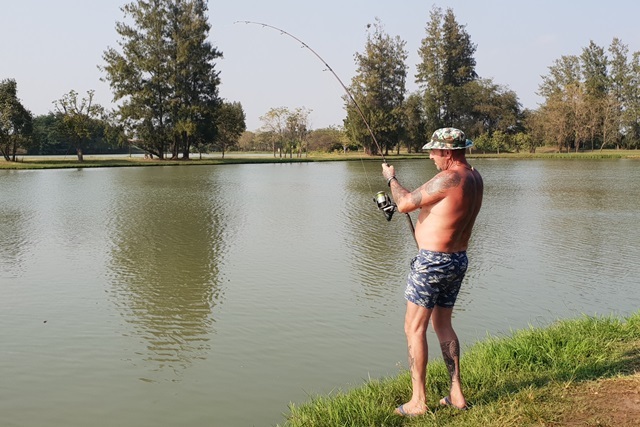 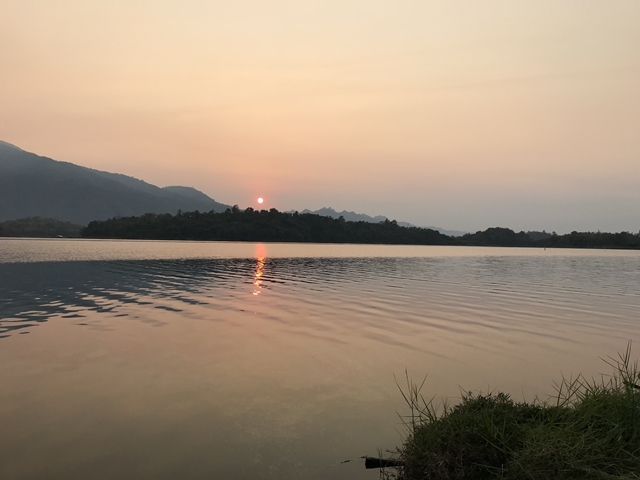 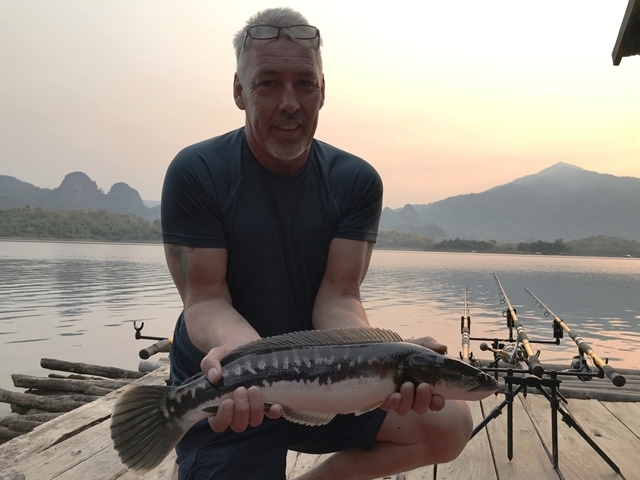 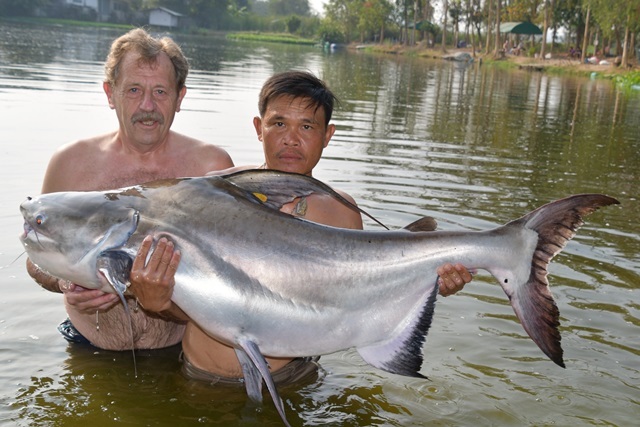 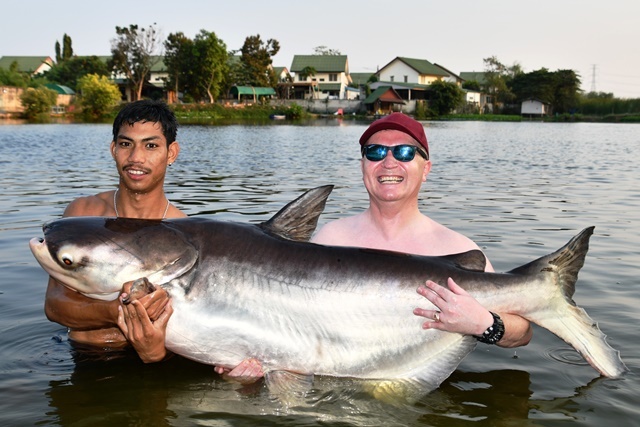 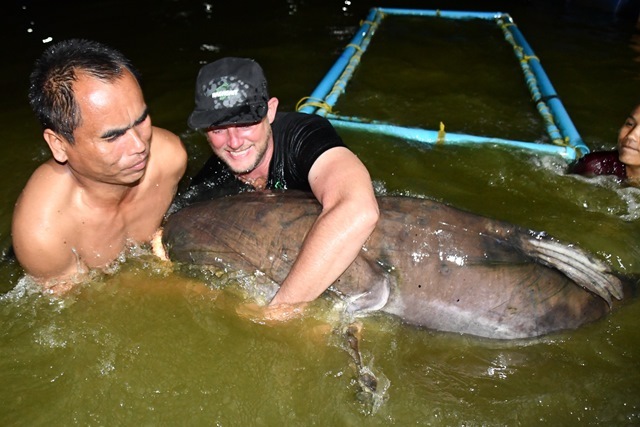 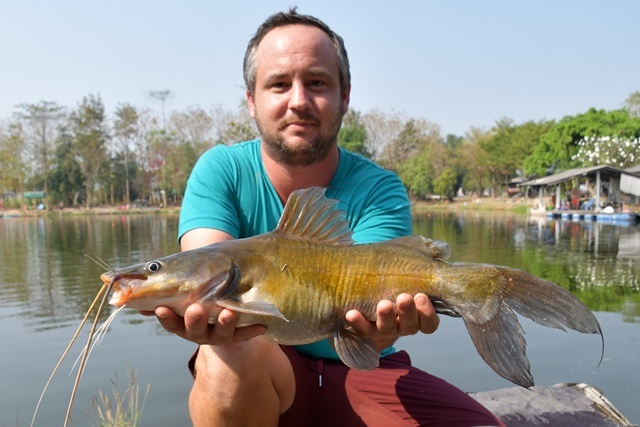 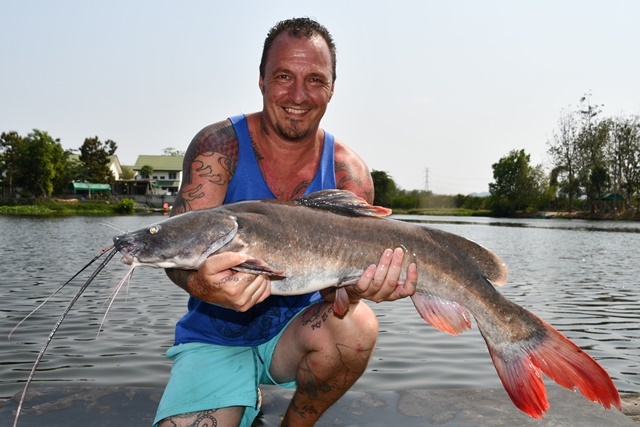 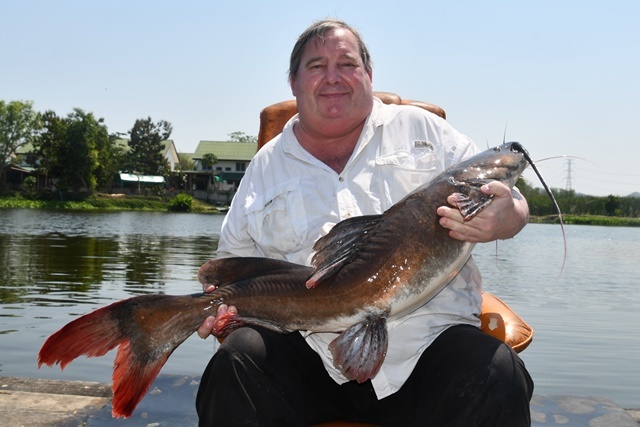 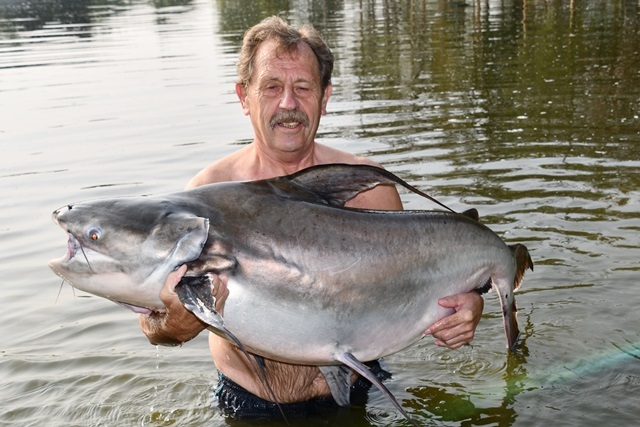 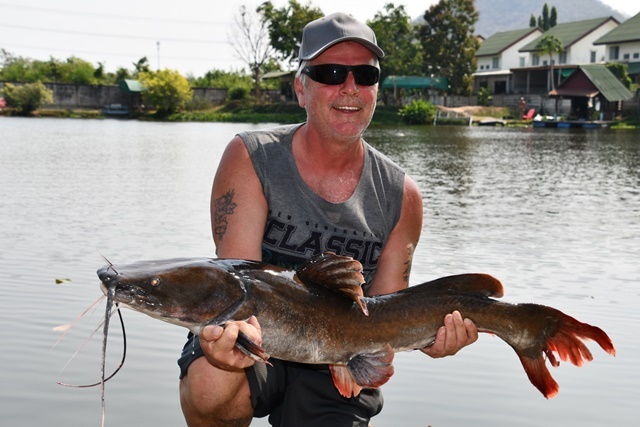 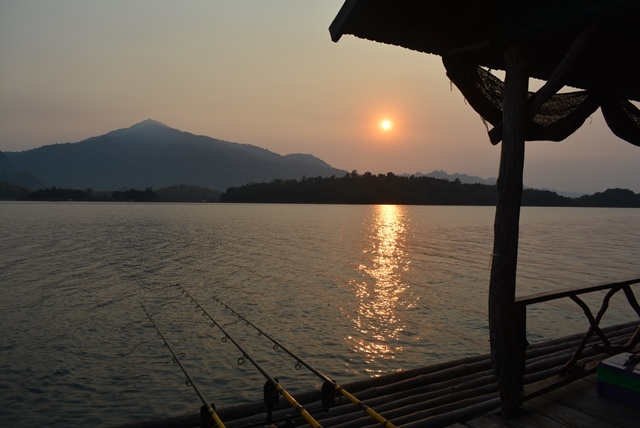 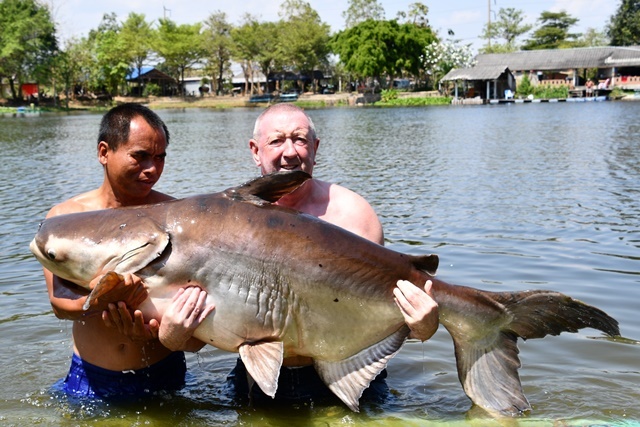 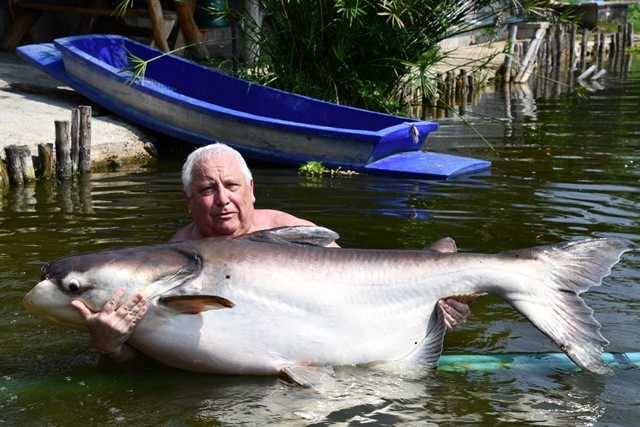 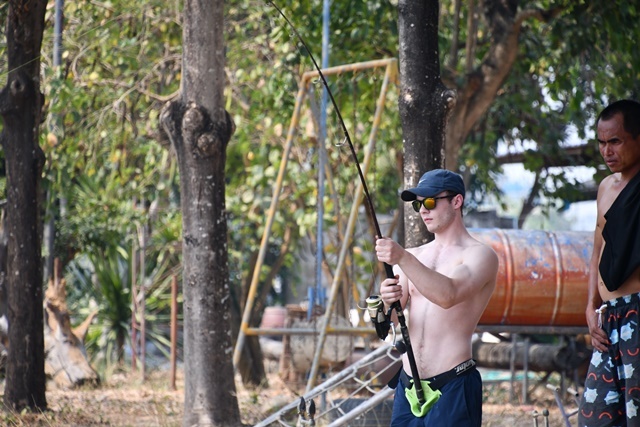 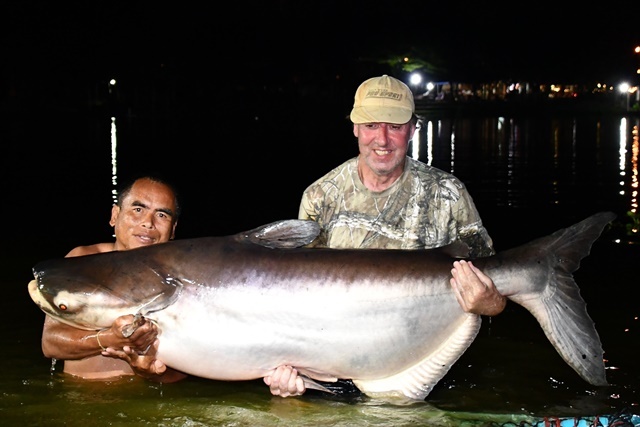 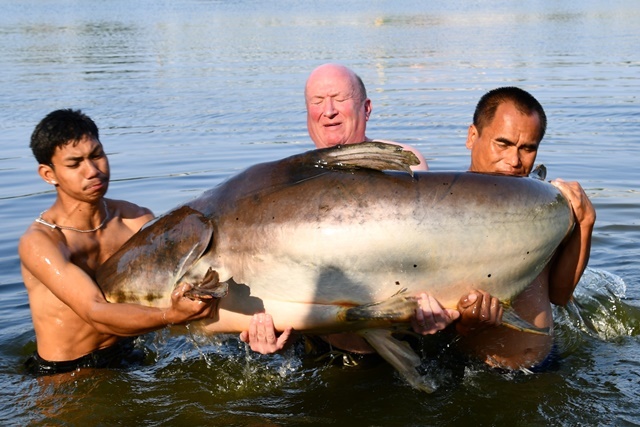 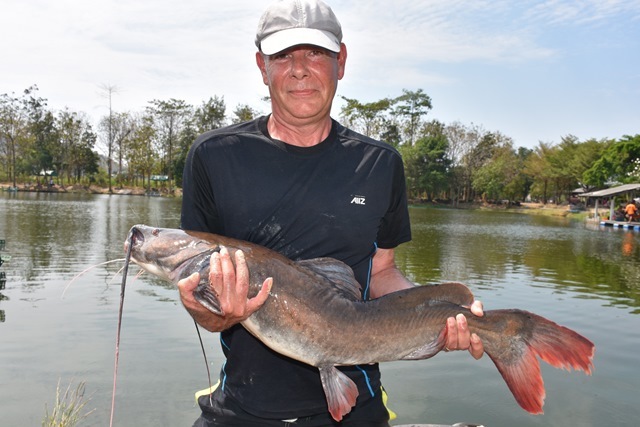 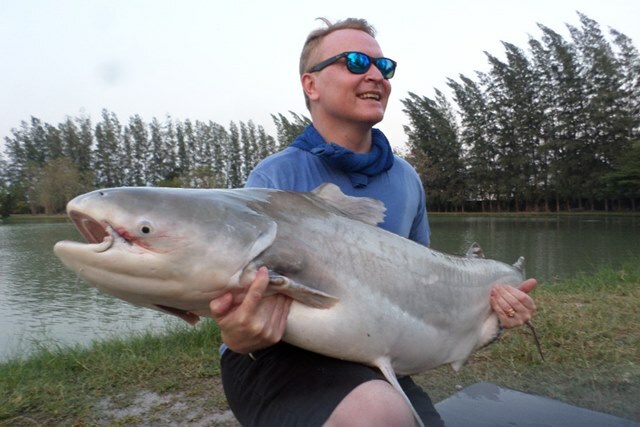 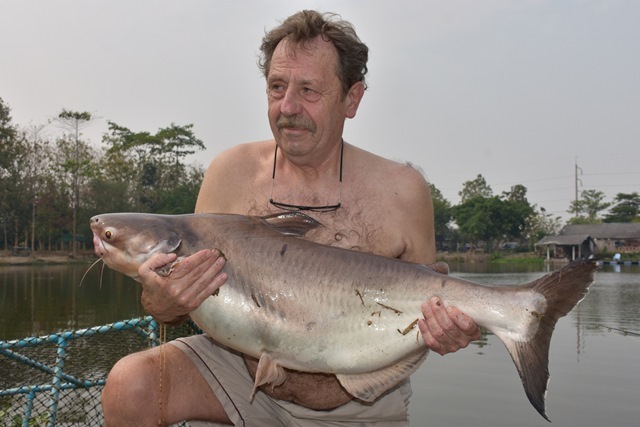 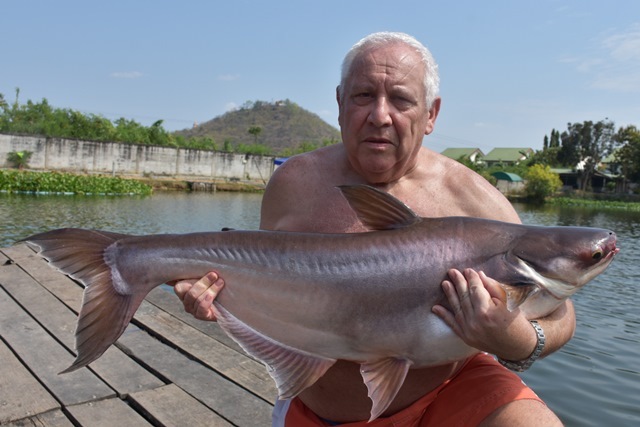 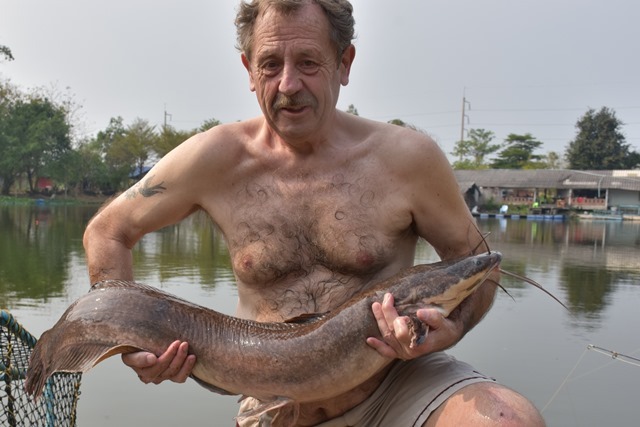 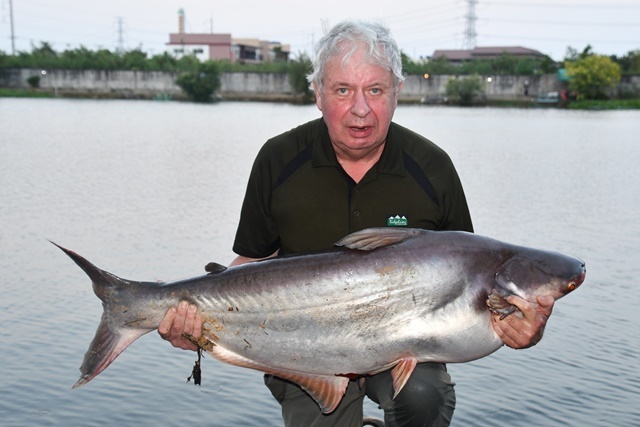 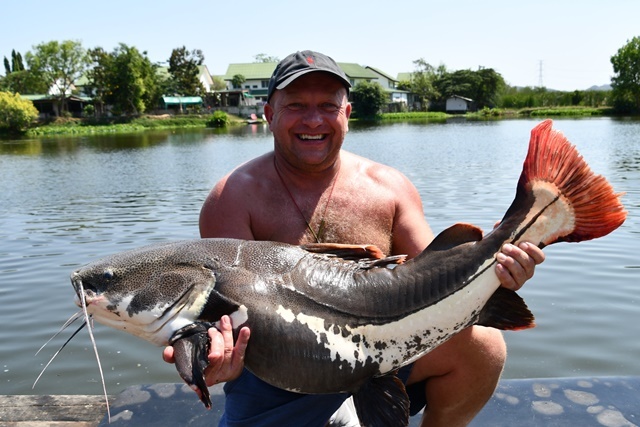 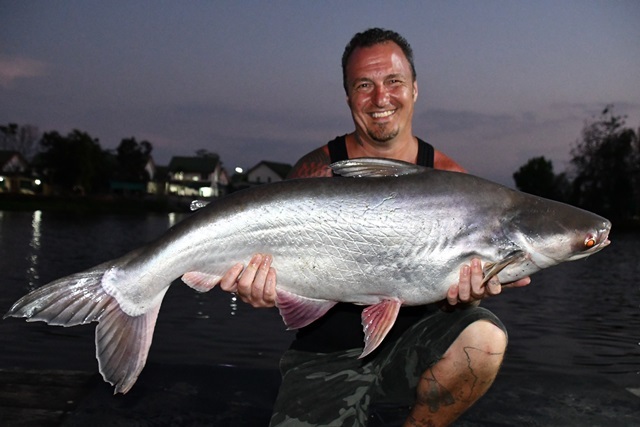 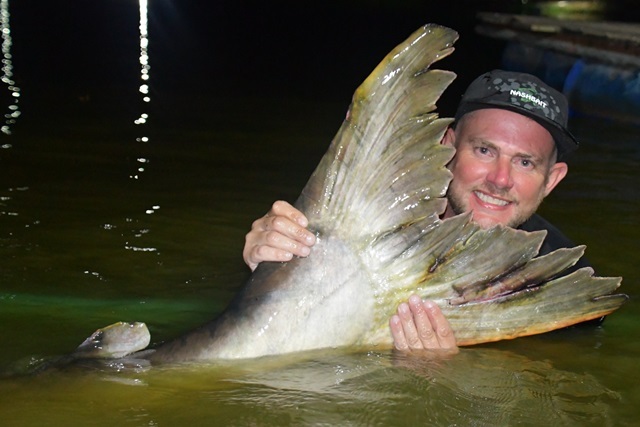 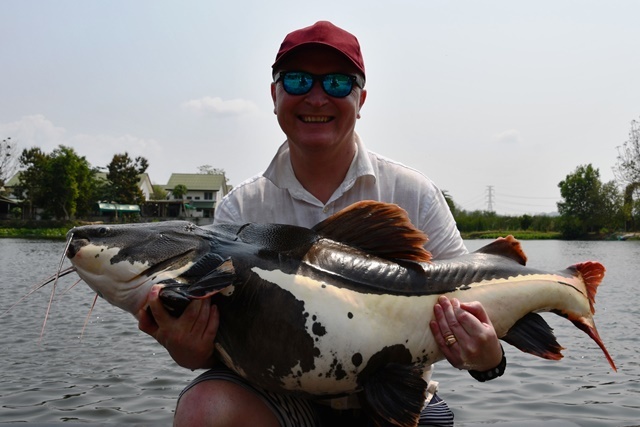 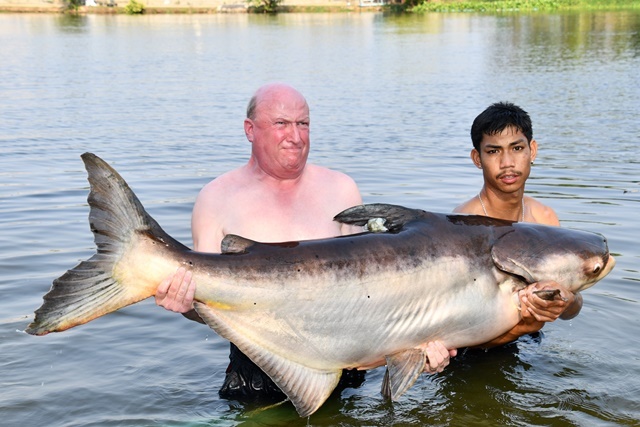 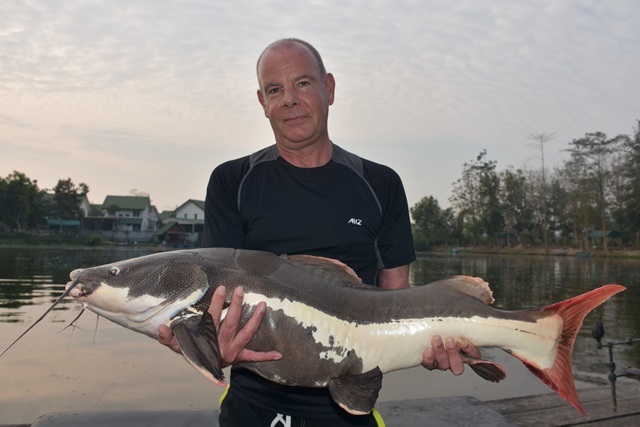 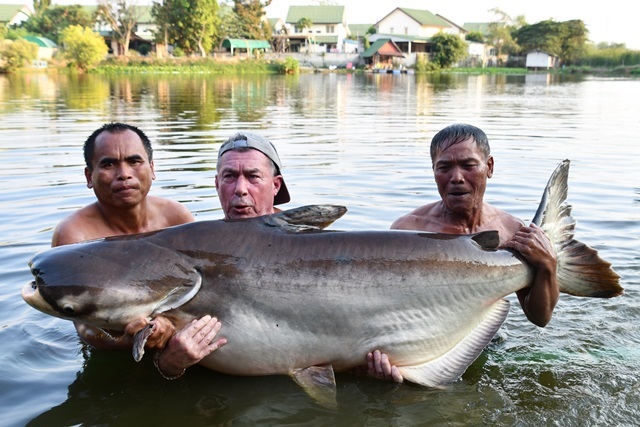 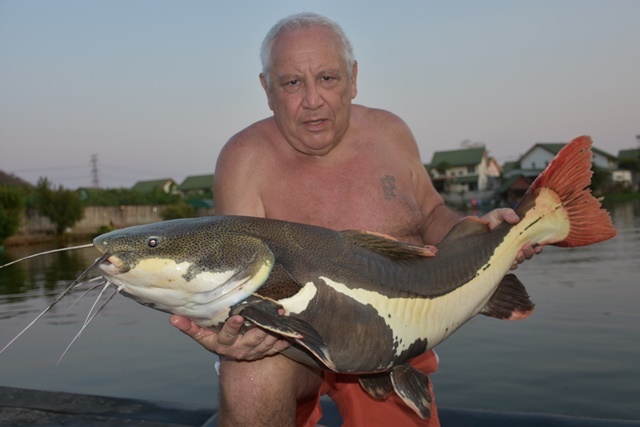 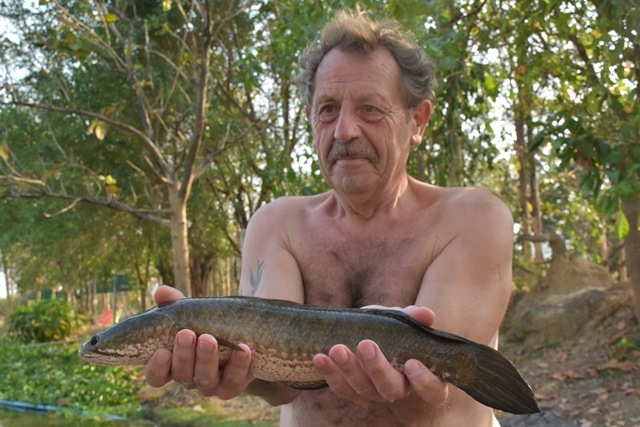 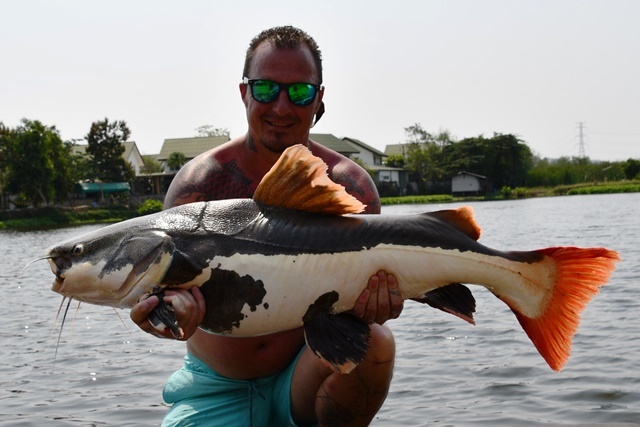 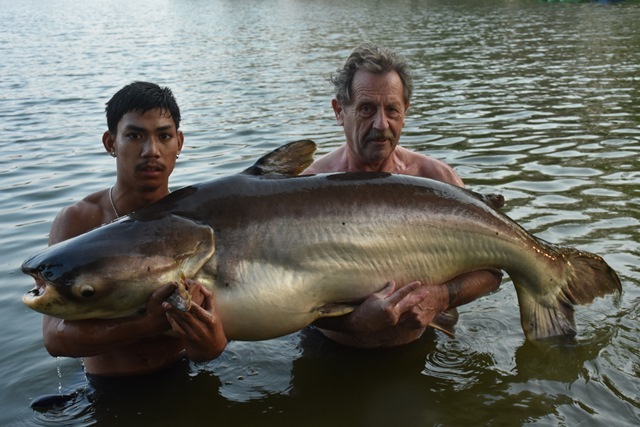 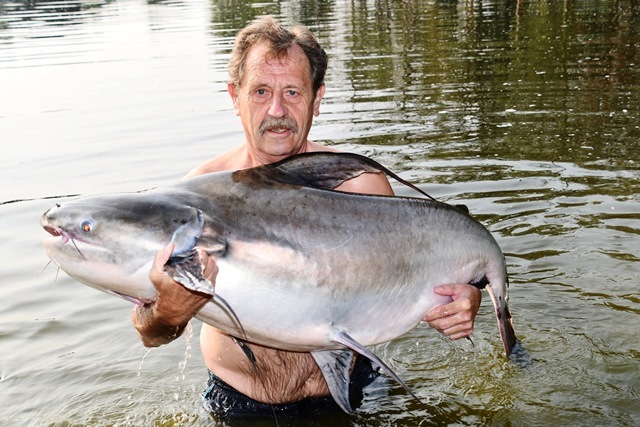 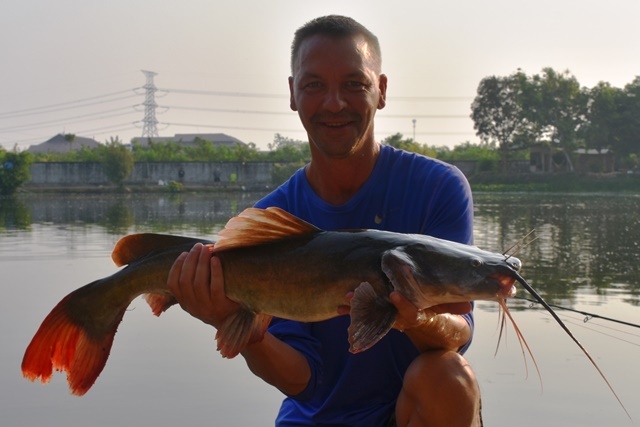 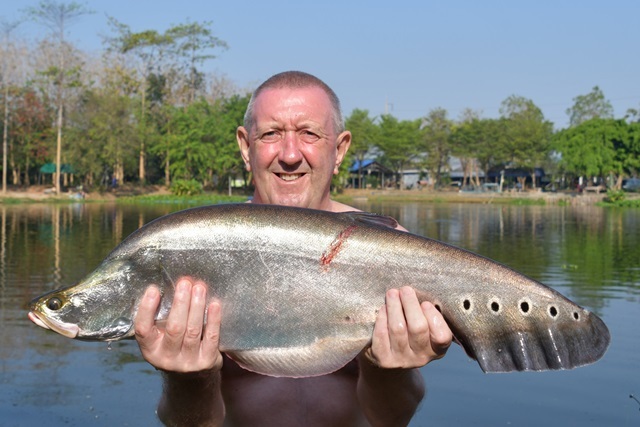 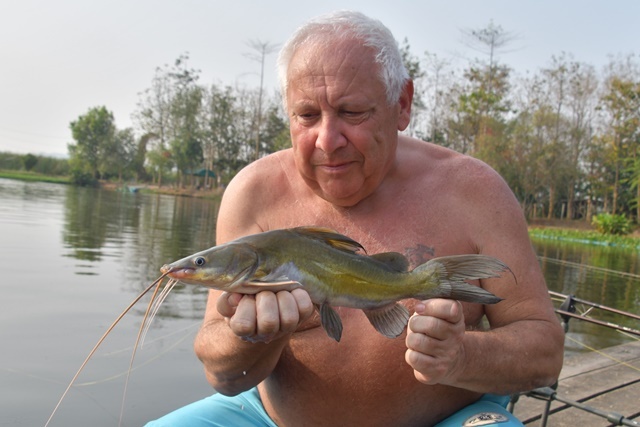 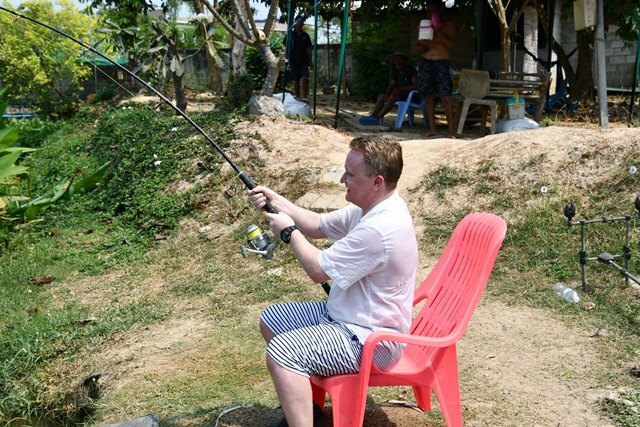 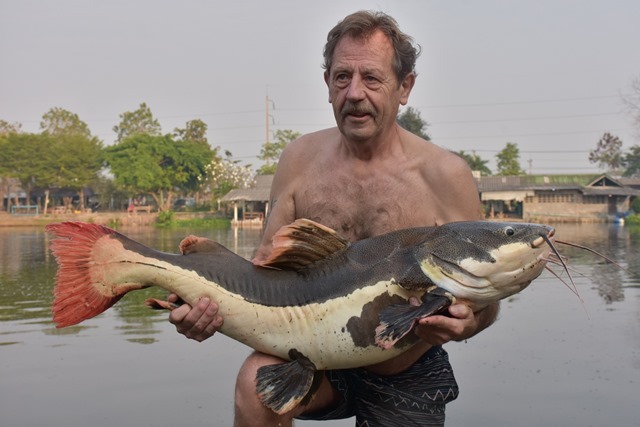 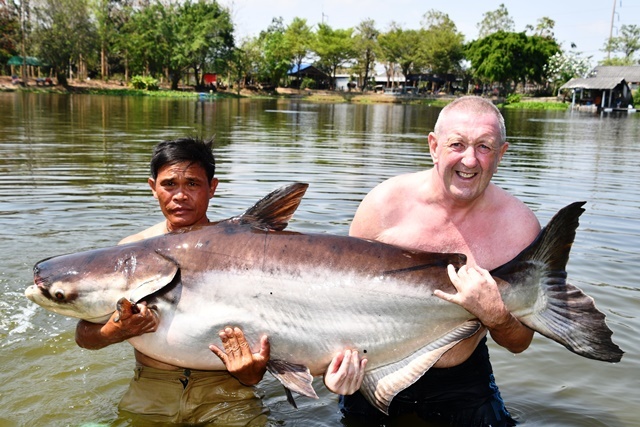 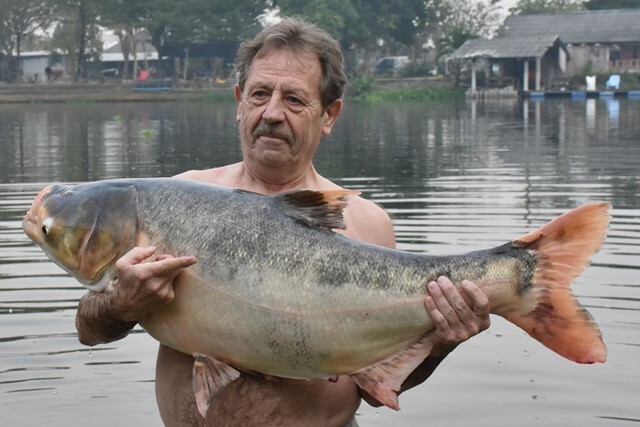 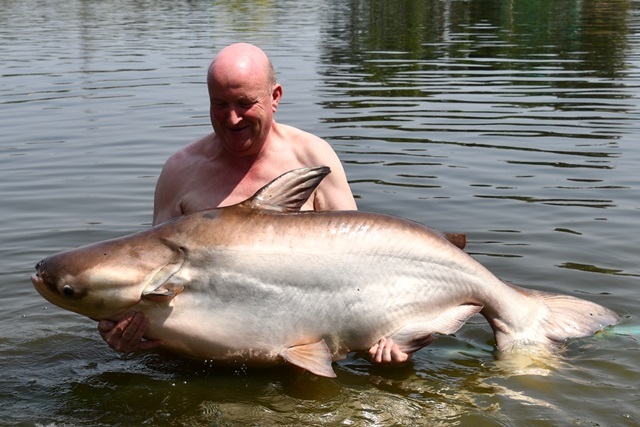 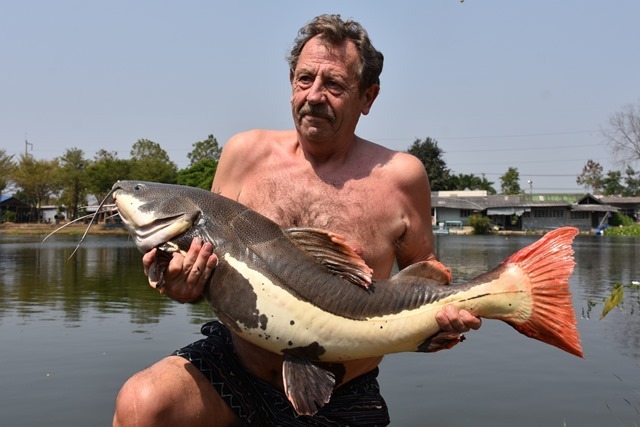 Francis Ameryckx opted for a change of venue for a day heading down to IT Monster Lake where he caught chao phraya catfish and Amazon redtail. 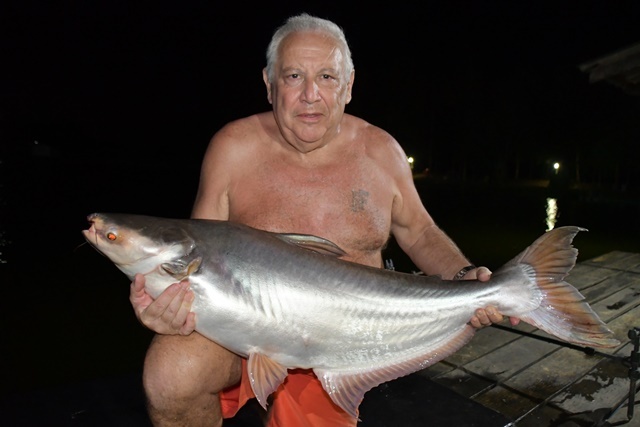 French angler Camillou got the Amazon redtail he was after on his first trip to Palm Tree as well as yellow catfish and striped catfish. 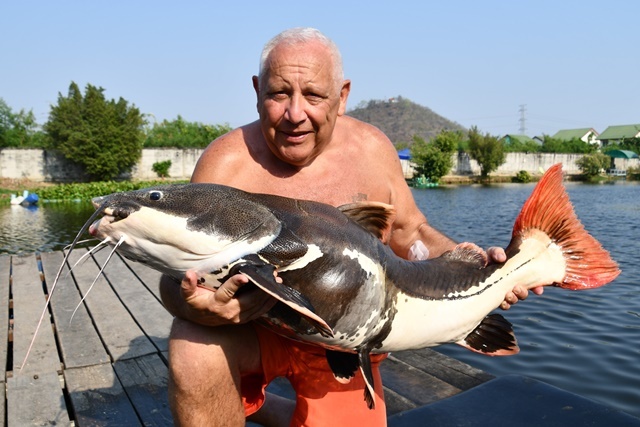 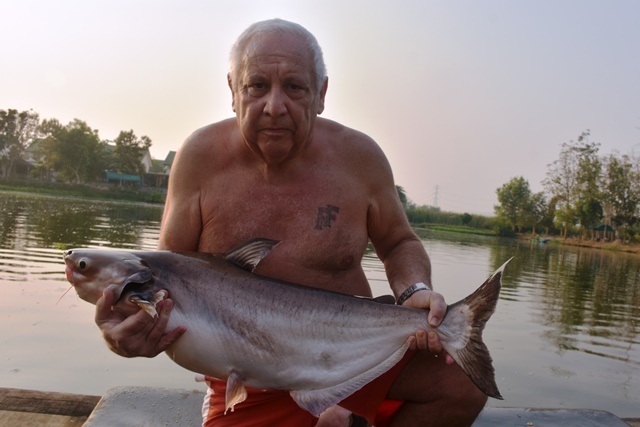 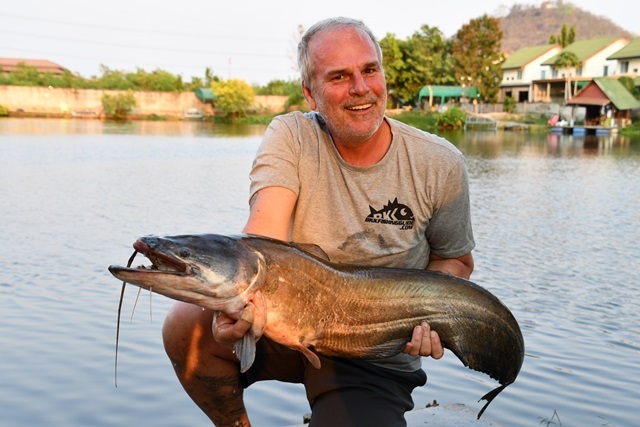 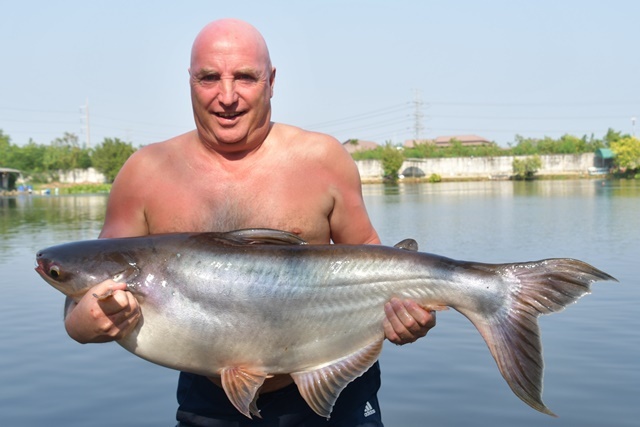 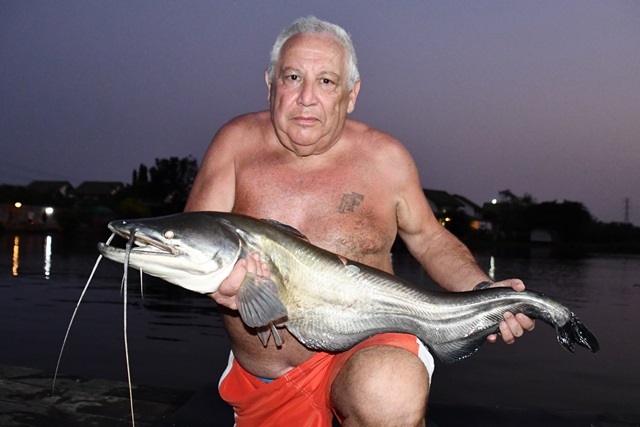 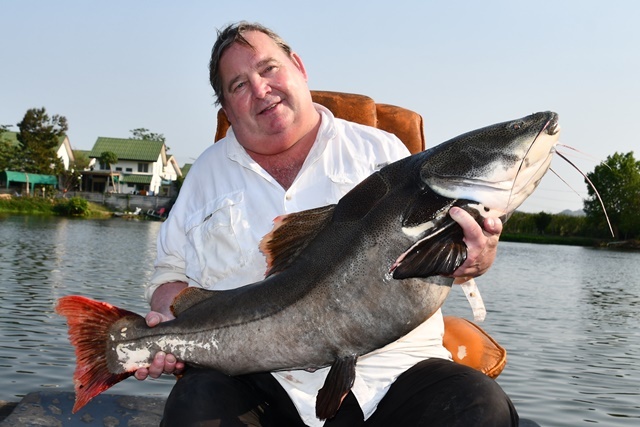 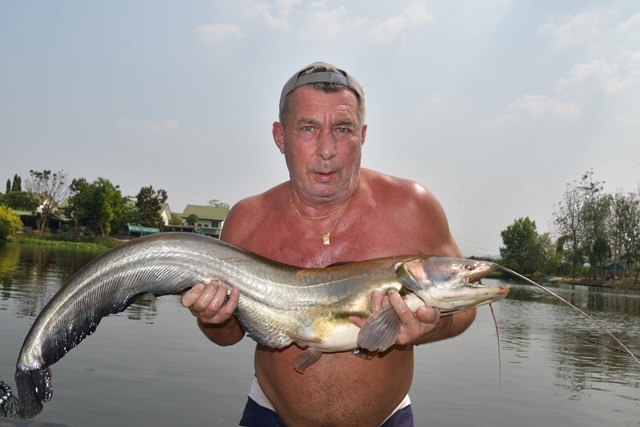 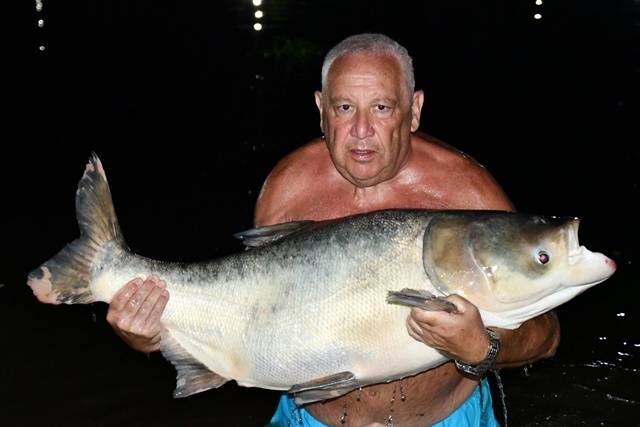 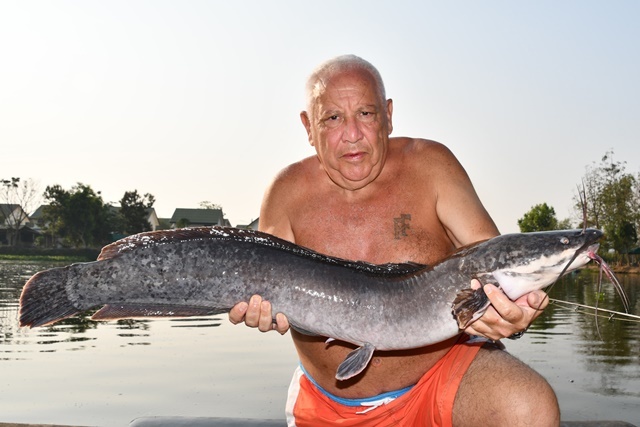 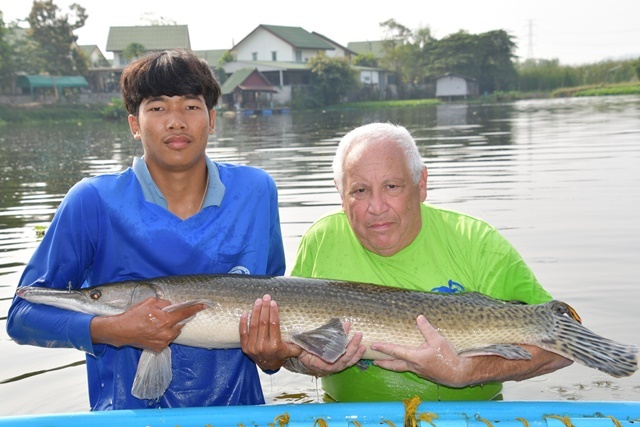 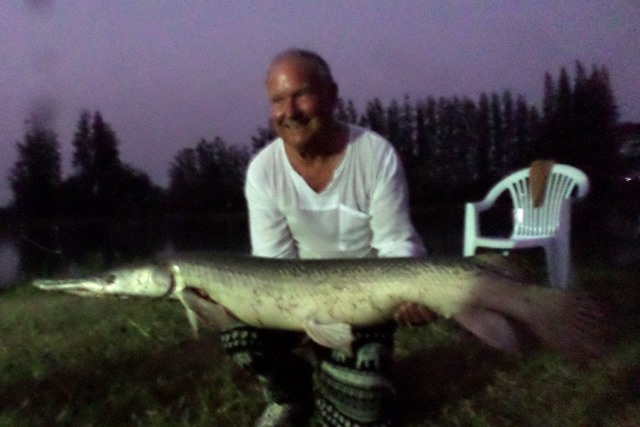 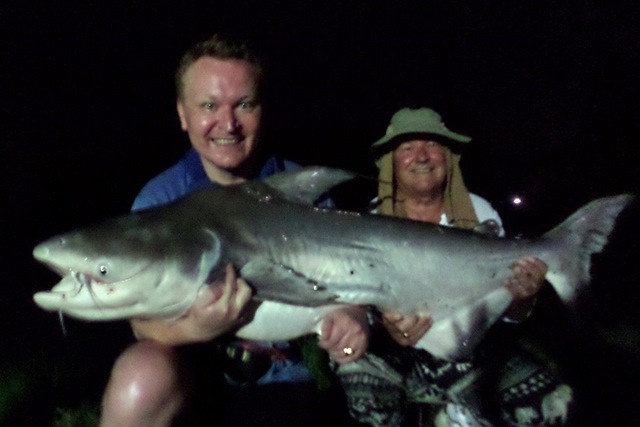 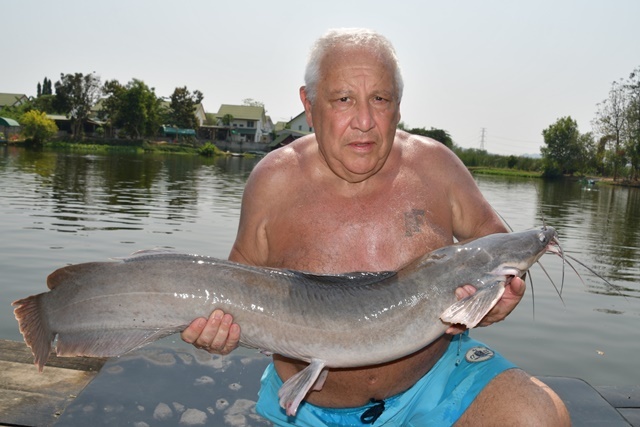 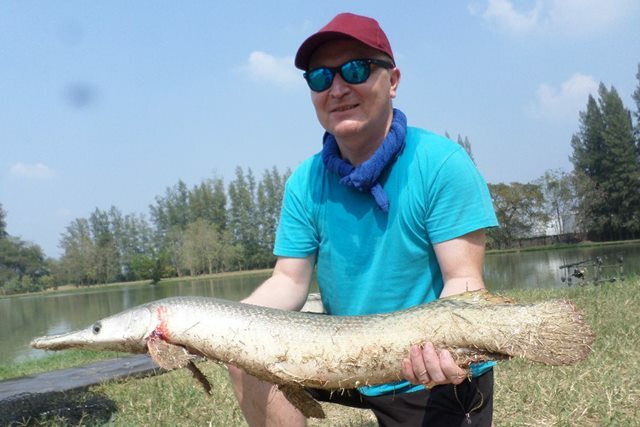 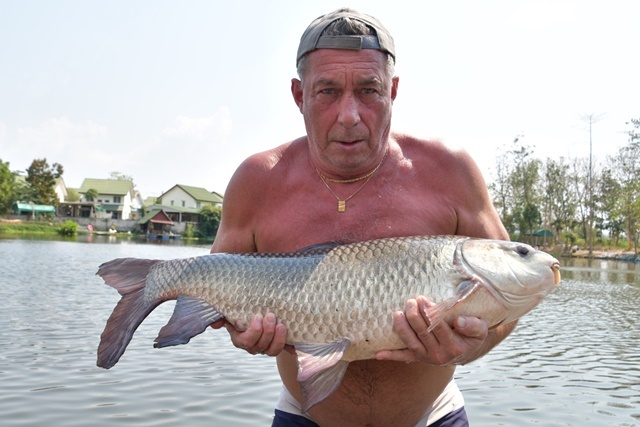 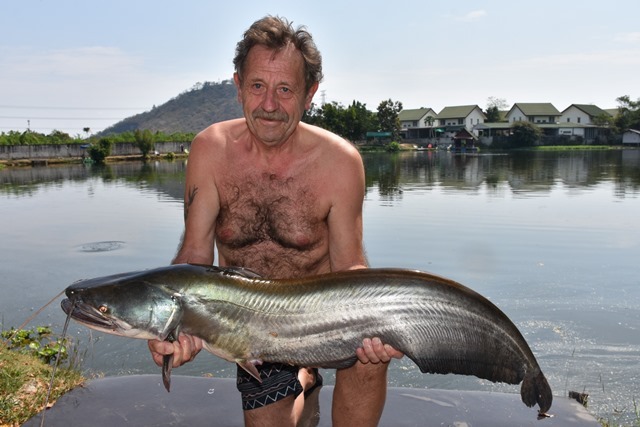 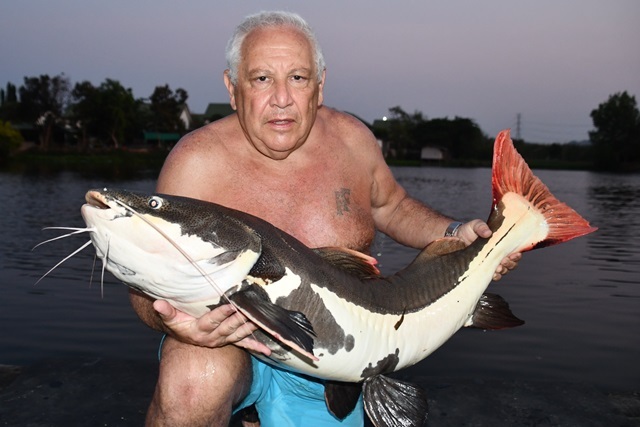 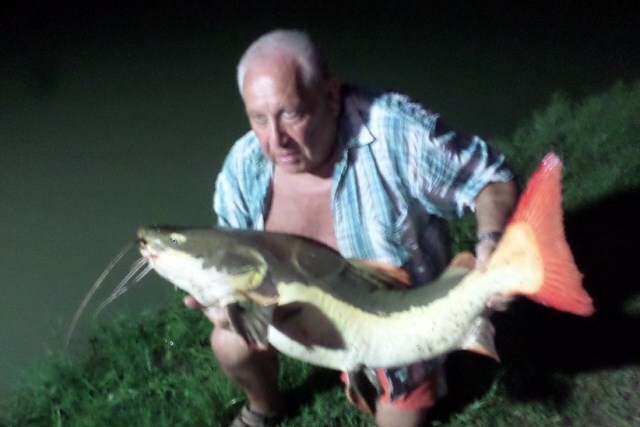 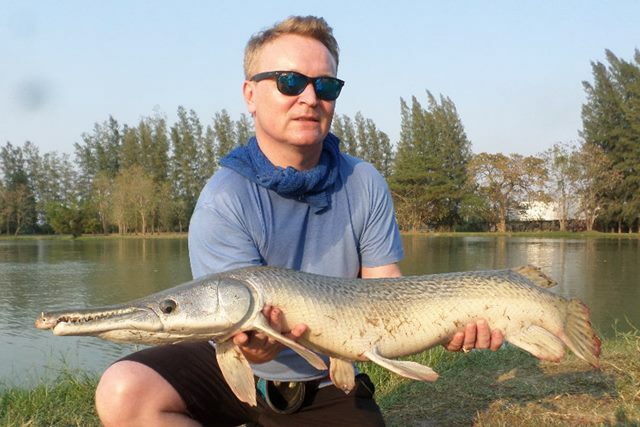 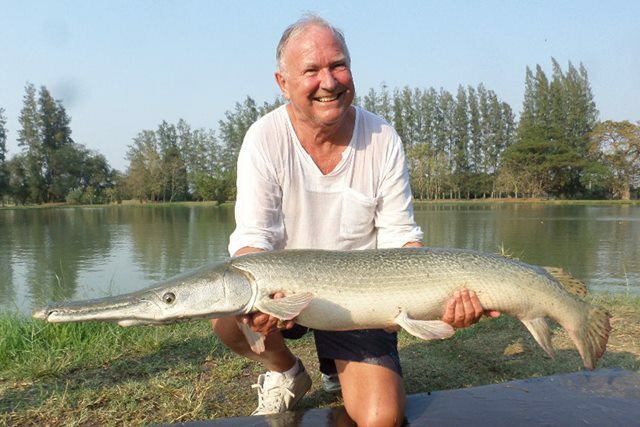 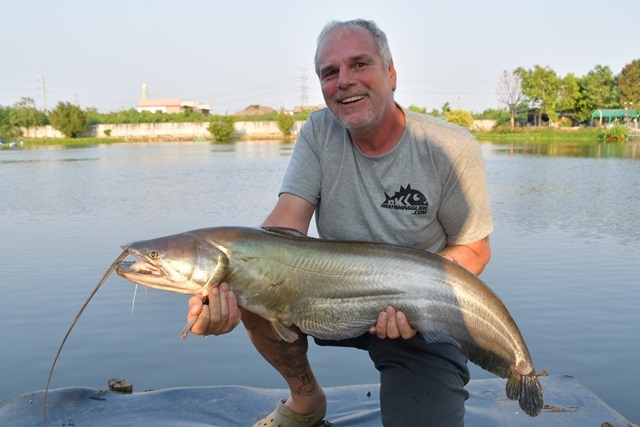 Italian angler Stefano Pirola was very pleased with his catches of a very chunky Mekong catfish as well as a good sized alligator gar and a black shark minnow. 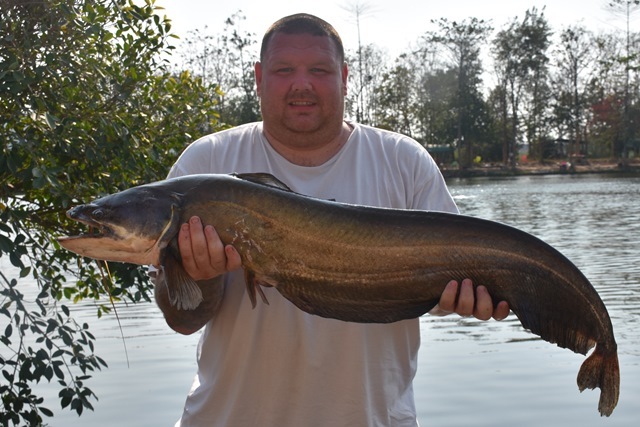 Adrian Hancock spent most of the time helping his mate catch fish but he did land a Mekong catfish as well as a few others. 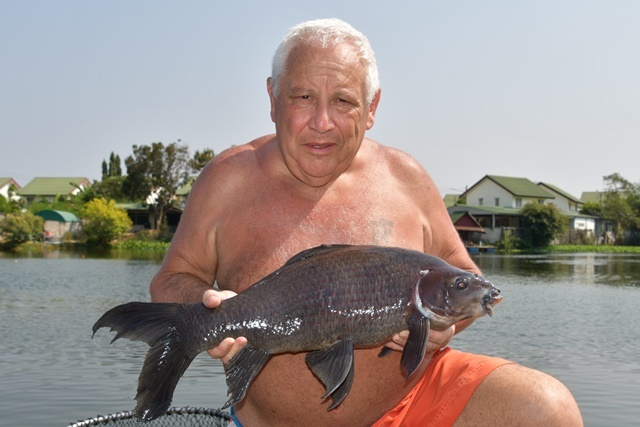 First timer Jules Pierefitte successfully caught mollycot, black shark minnow and a rtohu x black shark minnow cross.